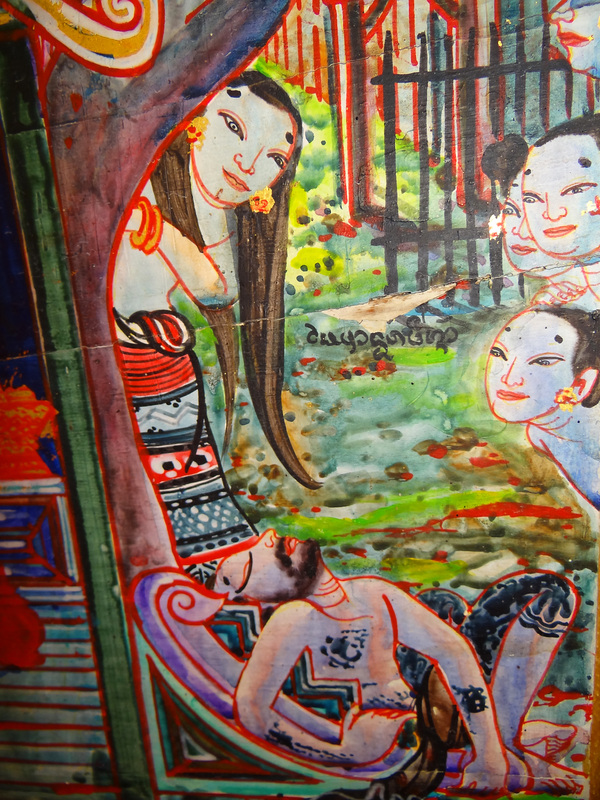 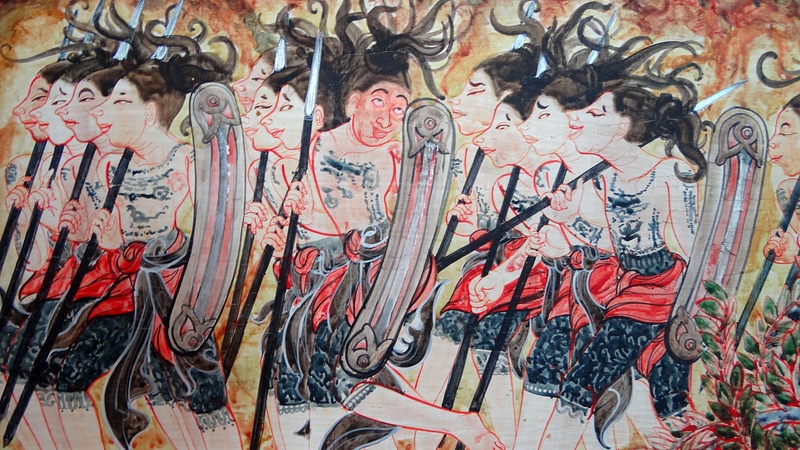 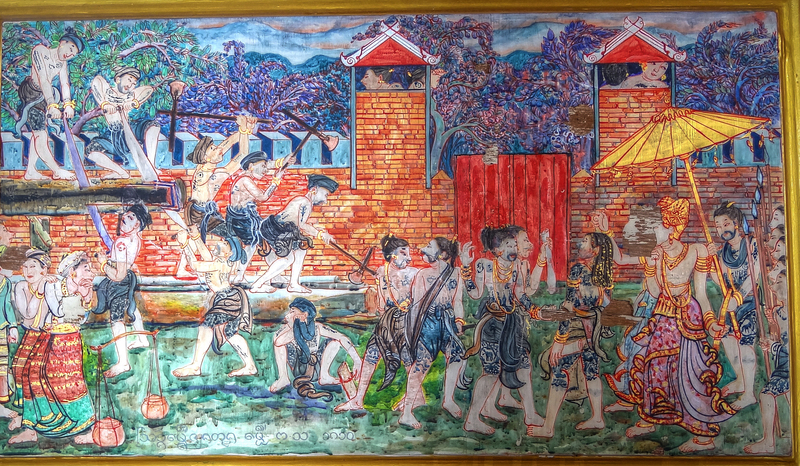 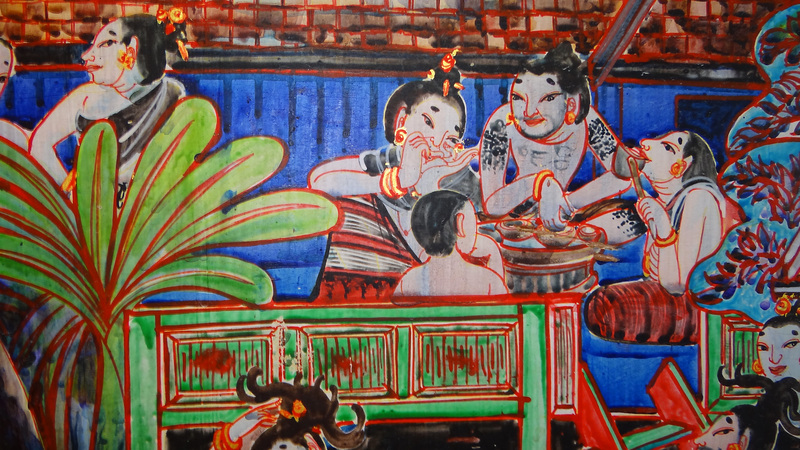 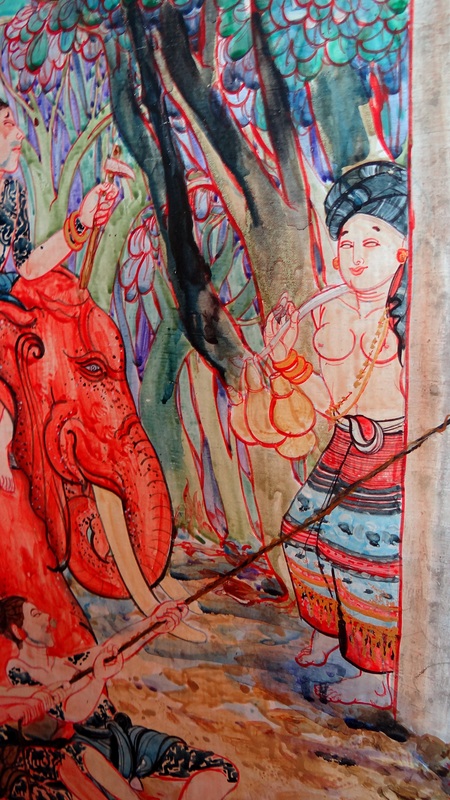 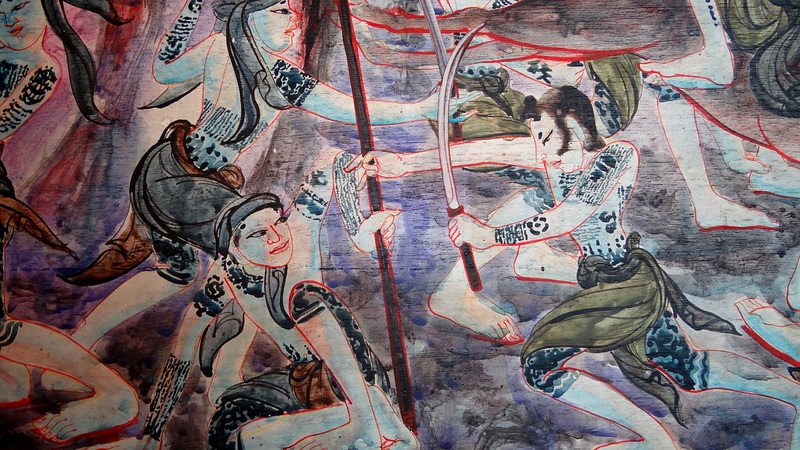 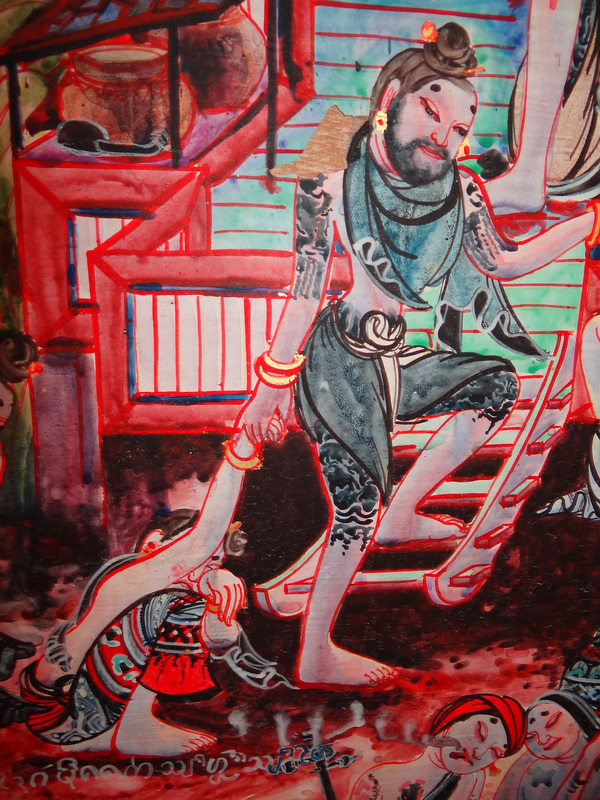 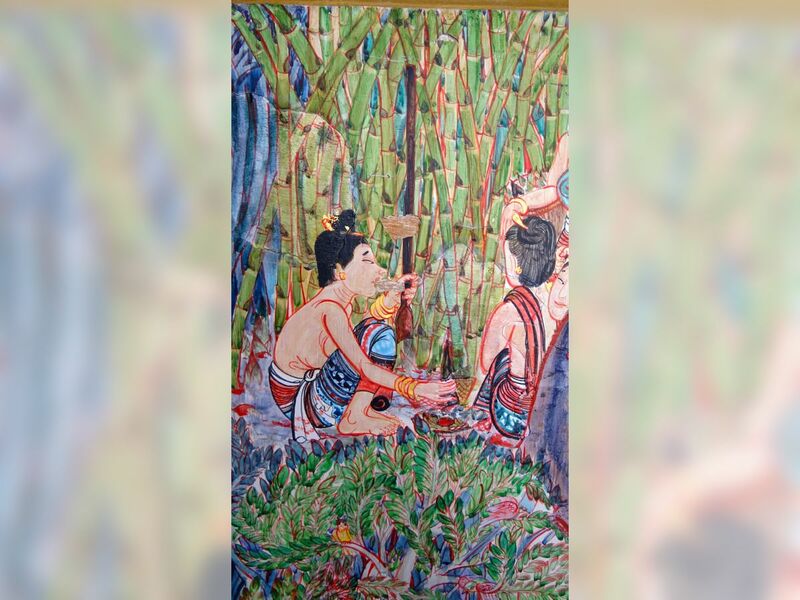 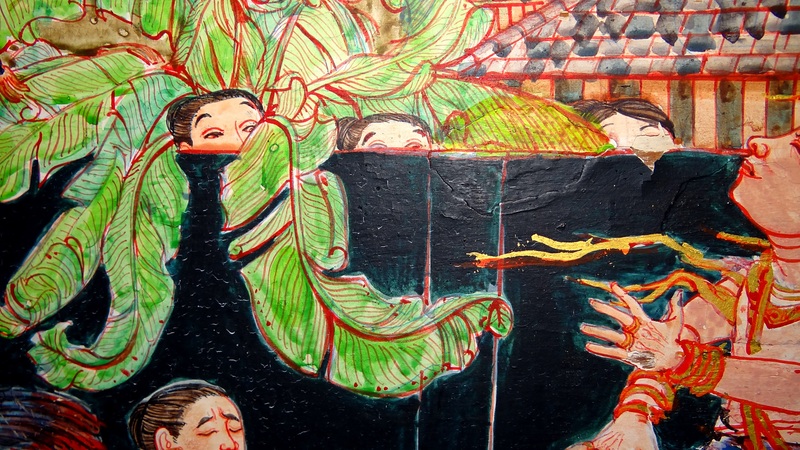 large collection of high-definition creative commons photographs from Fang, Chiang Mai, showing the fine modern murals in the Ubosot of this temple, together with a map and a Life of King Mangrai. 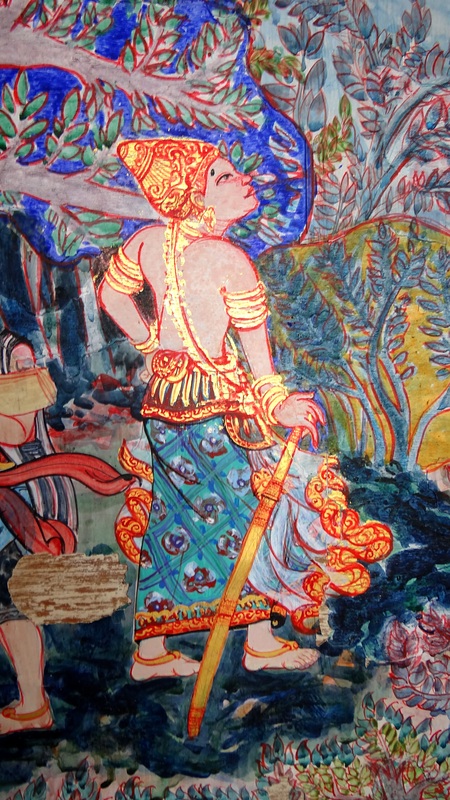 The murals above are found in the Ubosot (Sīma) at Wat Chedi Ngam in Fang. 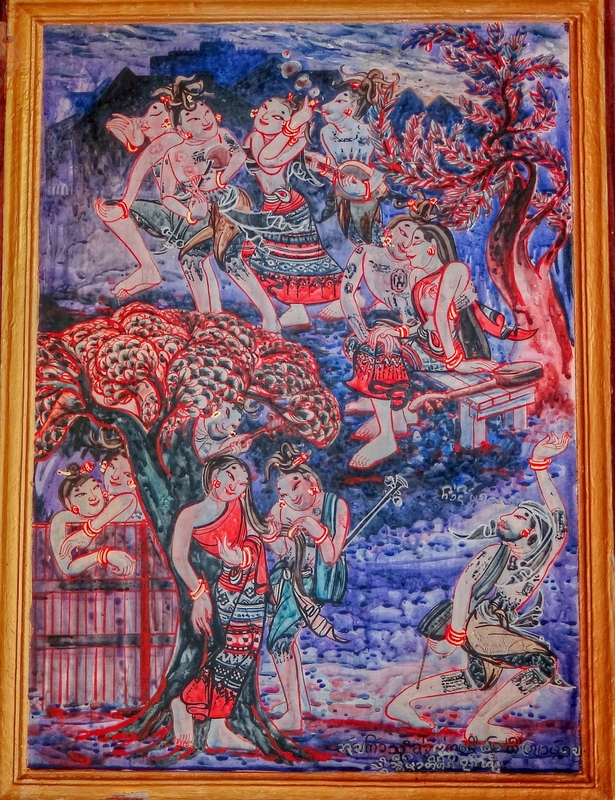 The only information I was able to find out about them is that they were made about twenty years ago, but the artist's name has been forgotten. 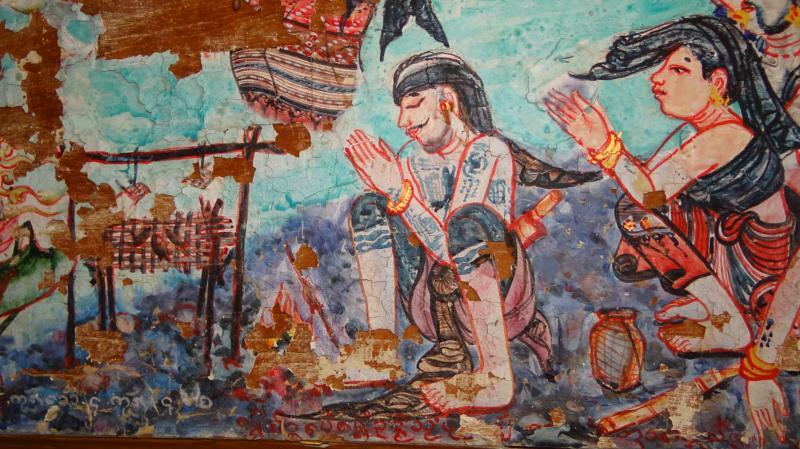 As can be seen some of them are decaying, and they badly need the attention of restoration experts before they are lost. 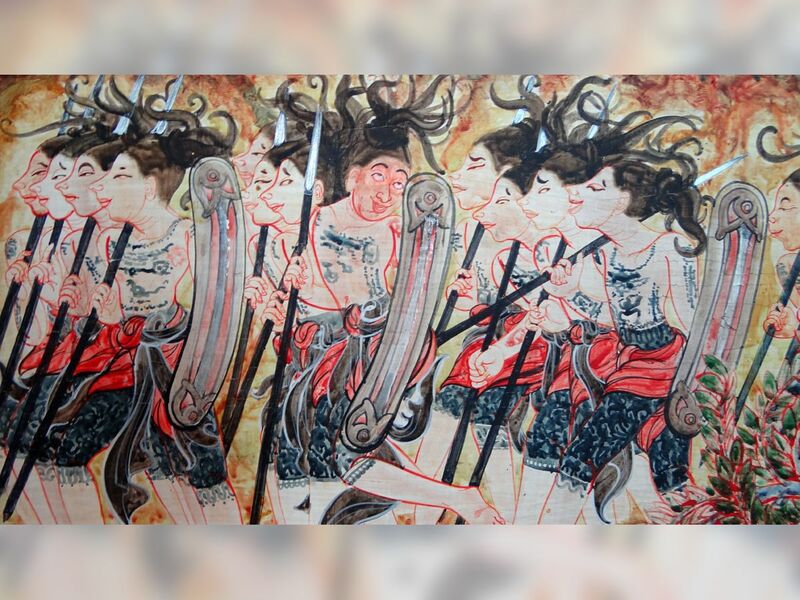 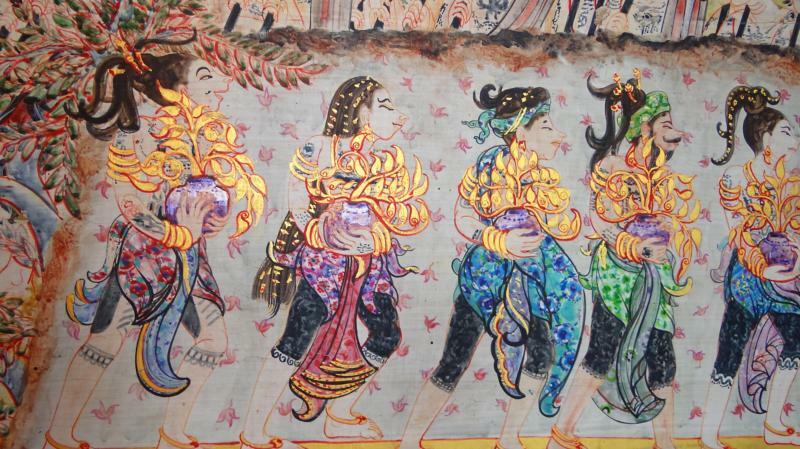 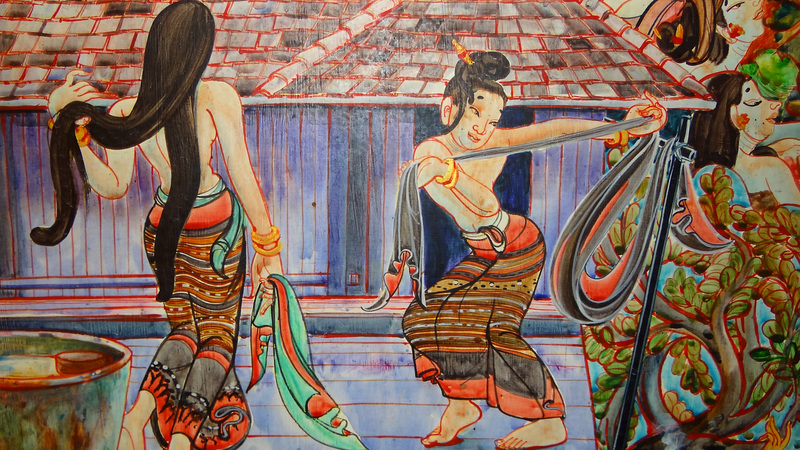 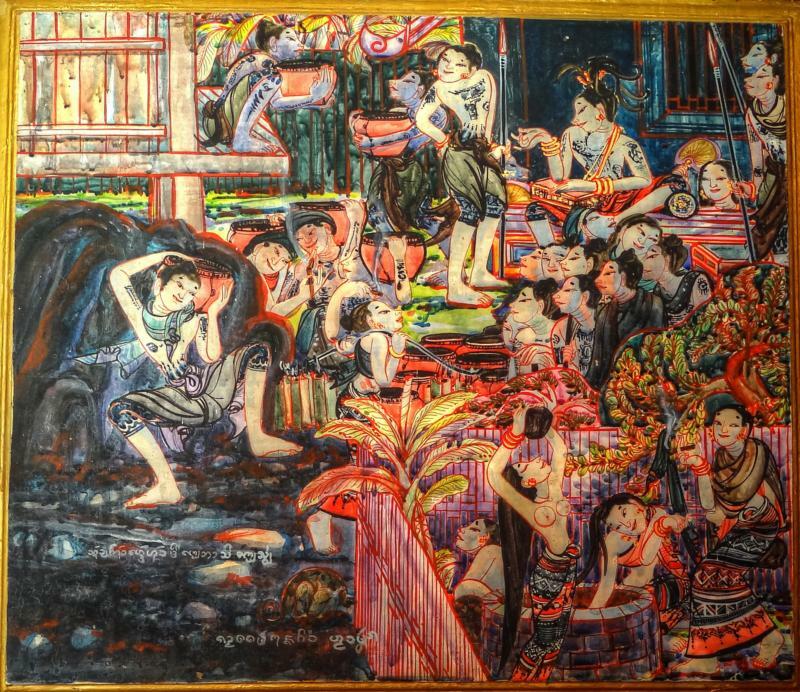 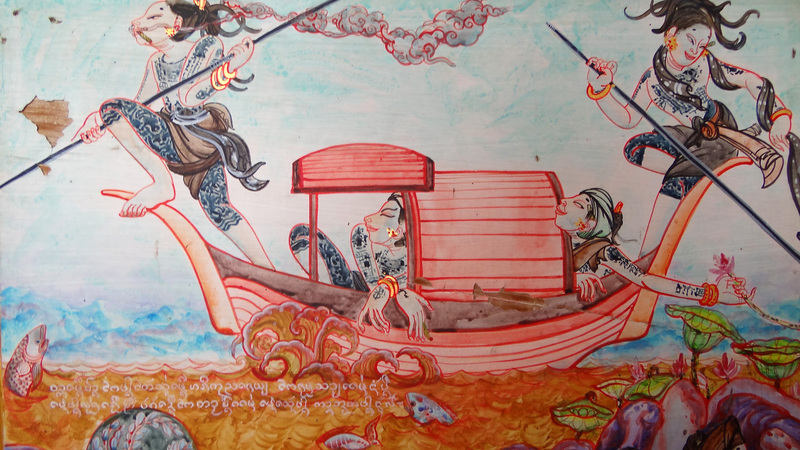 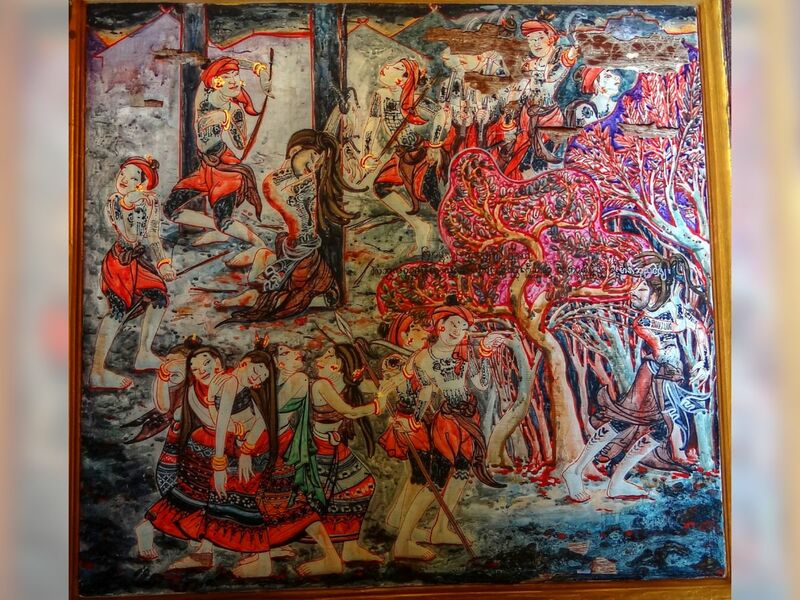 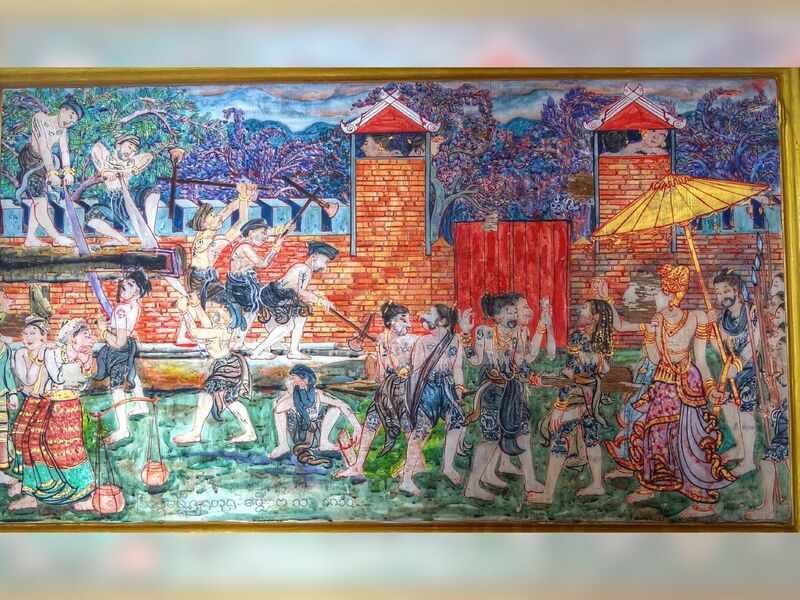 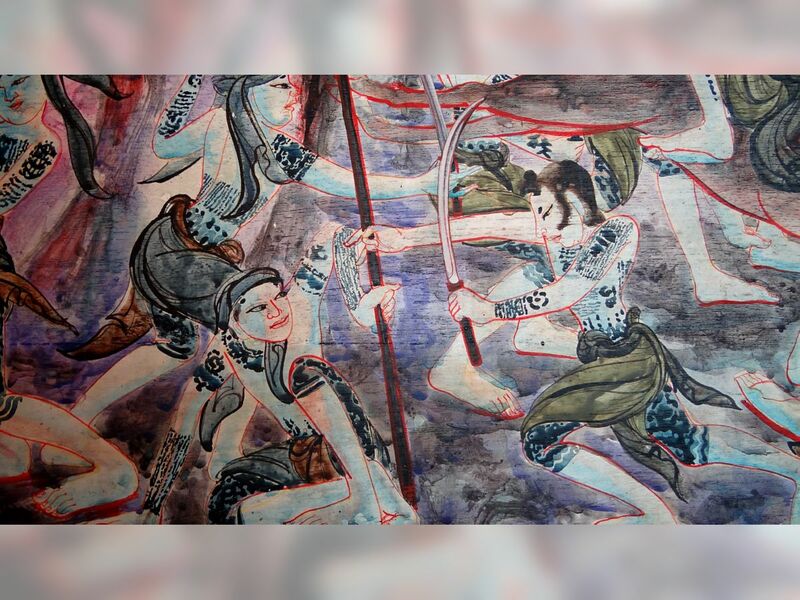 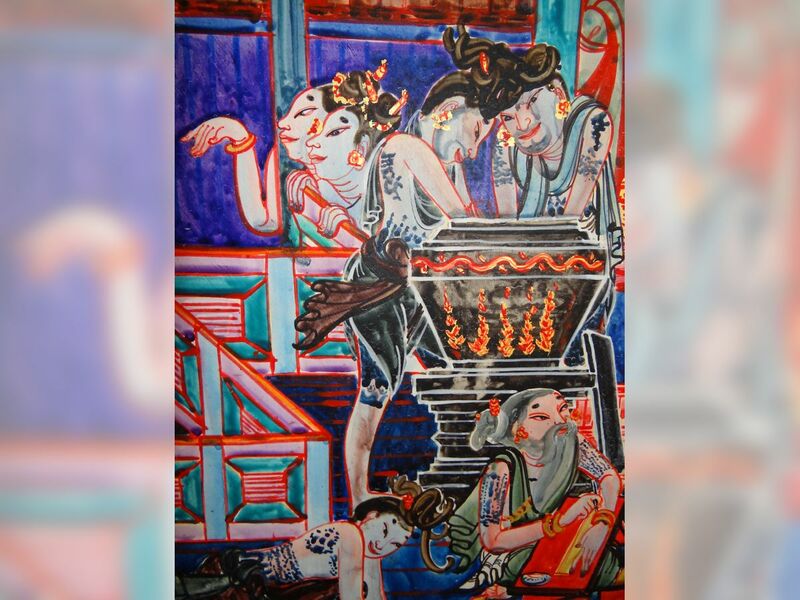 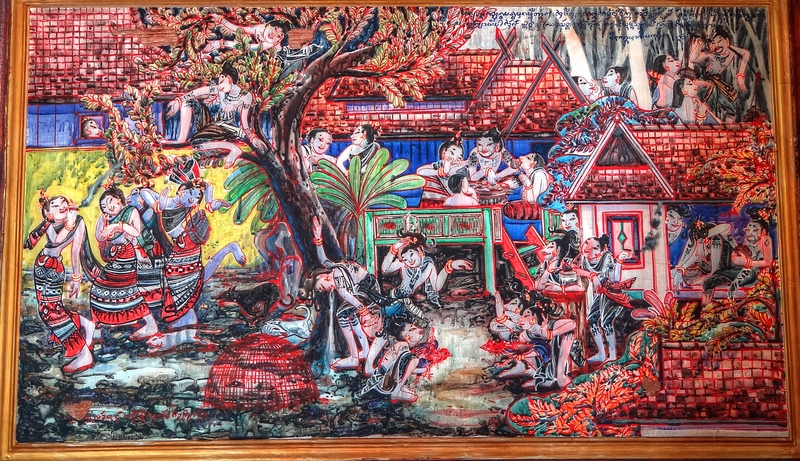 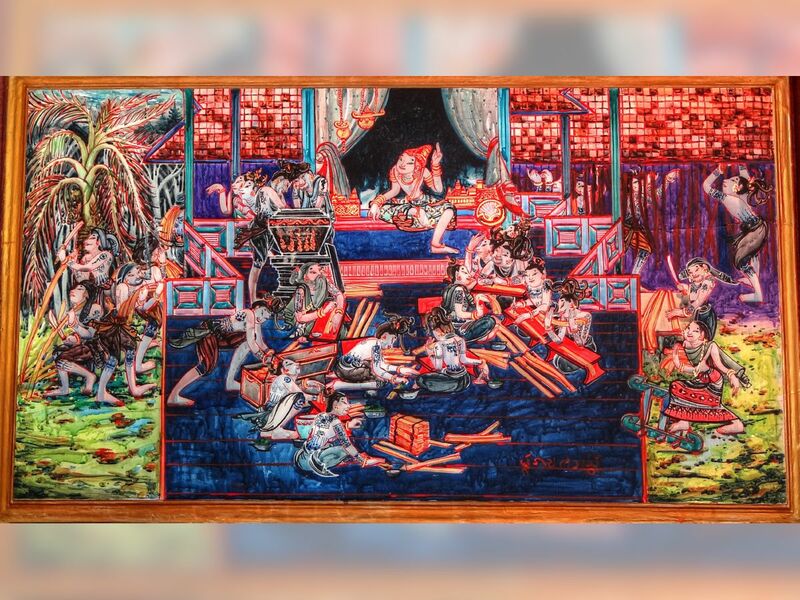 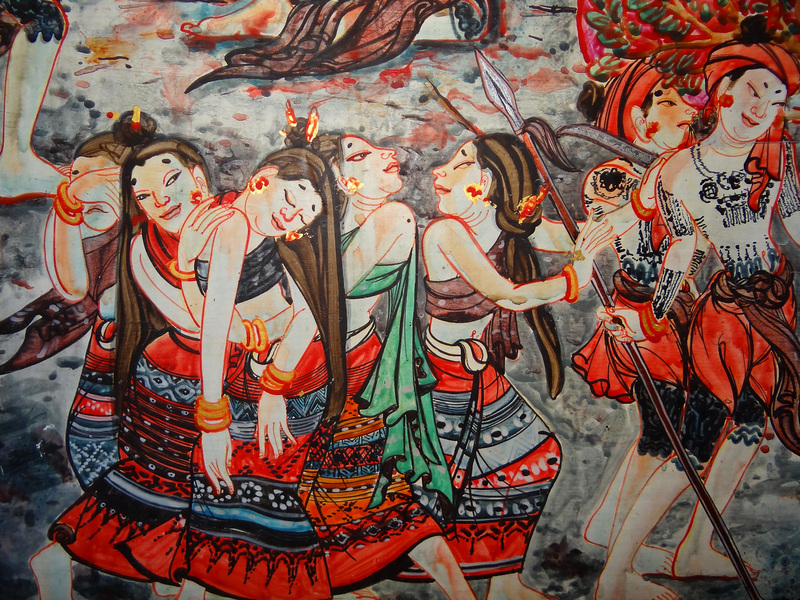 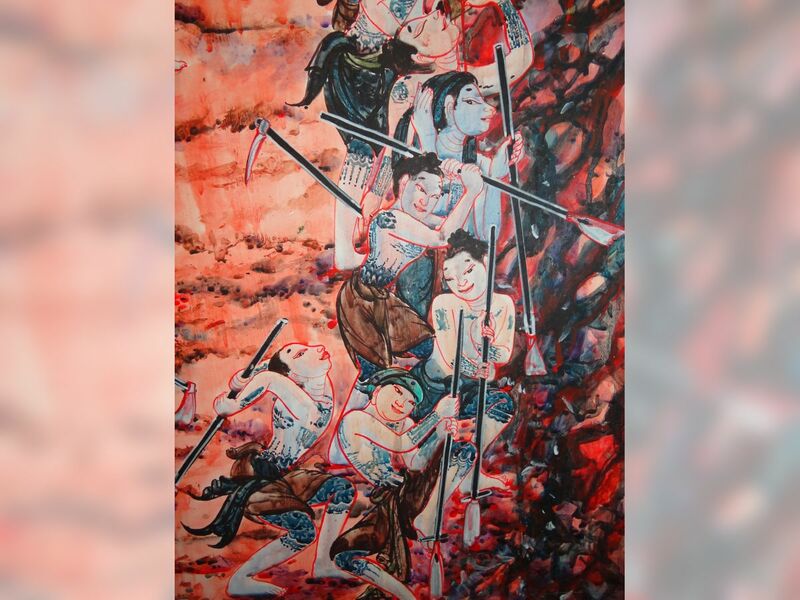 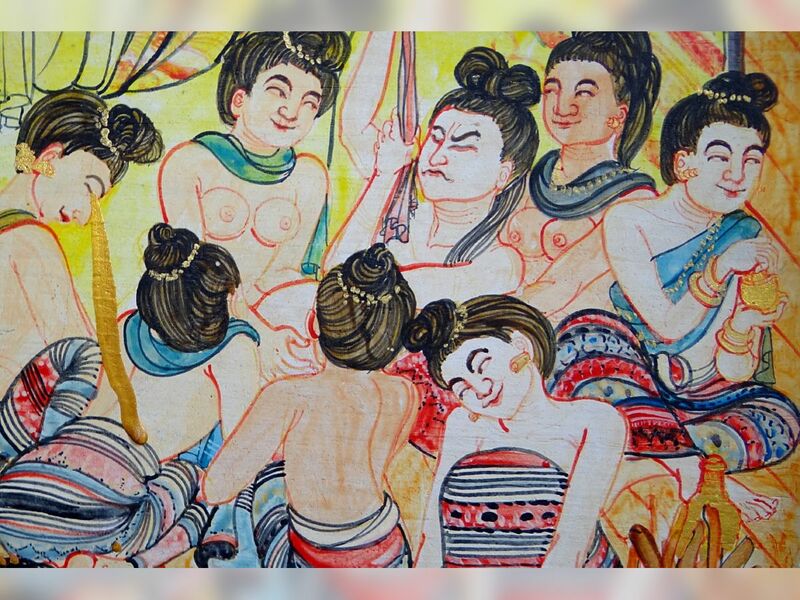 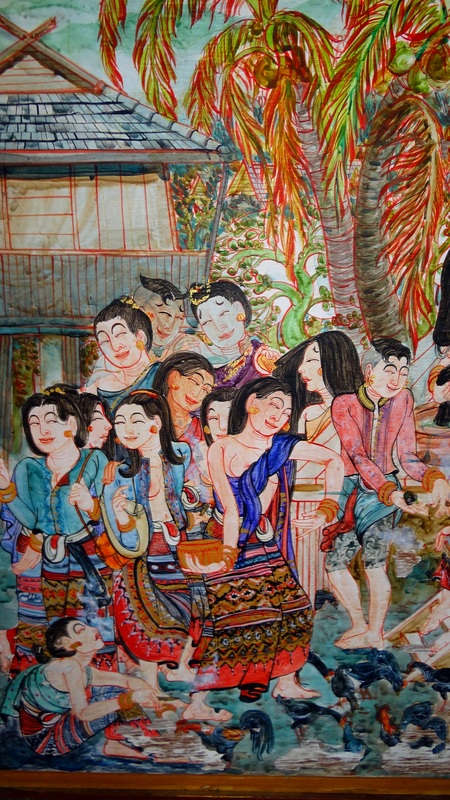 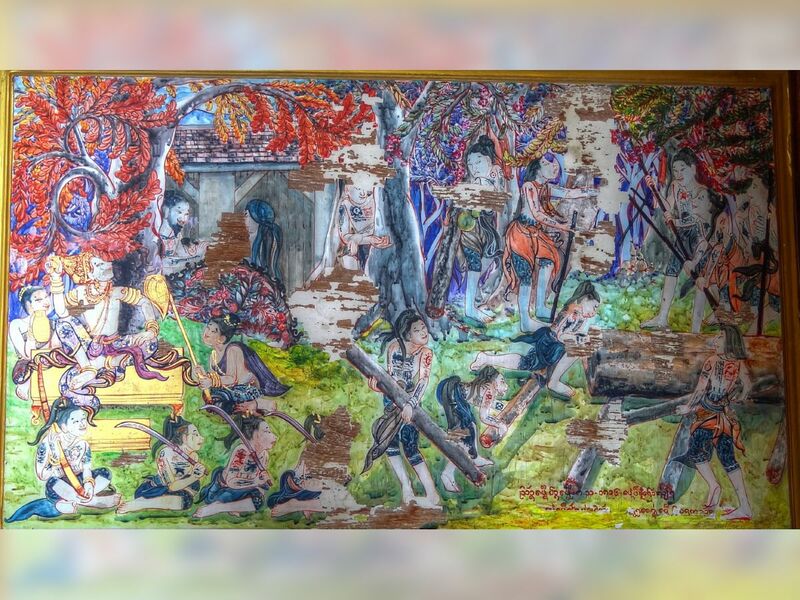 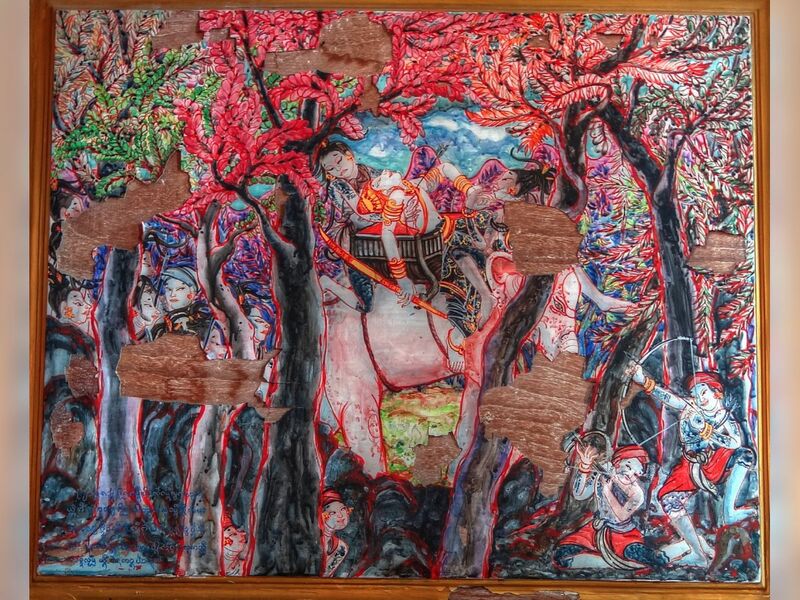 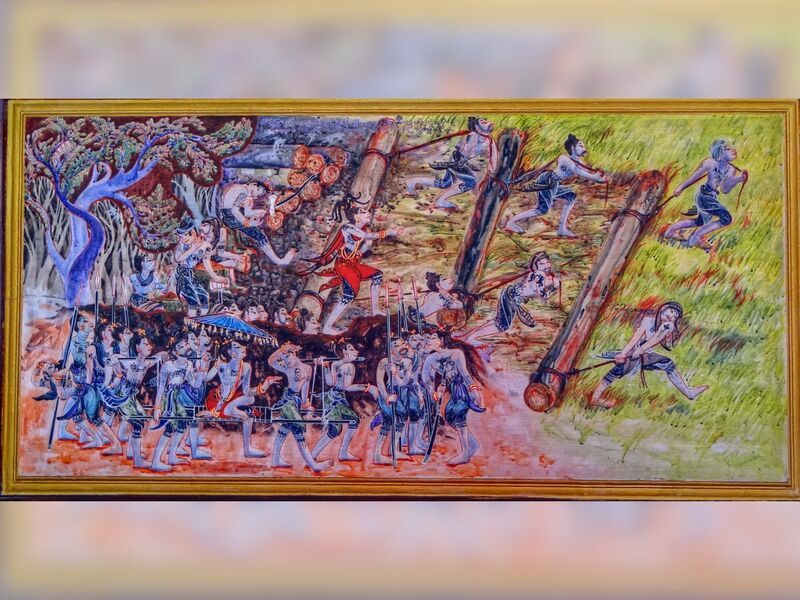 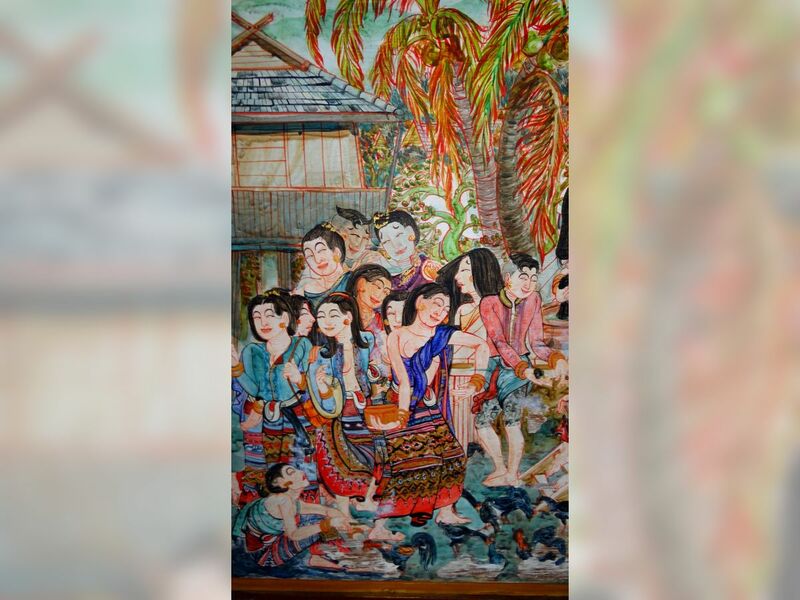 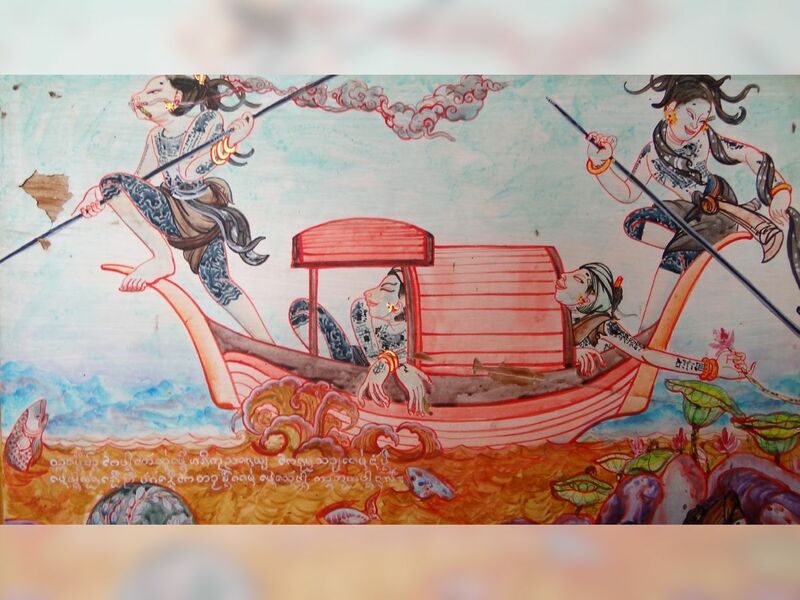 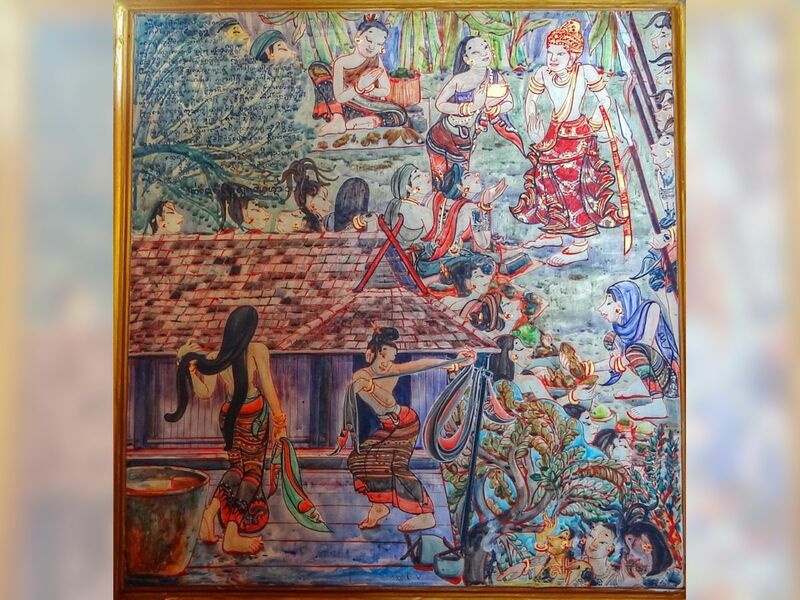 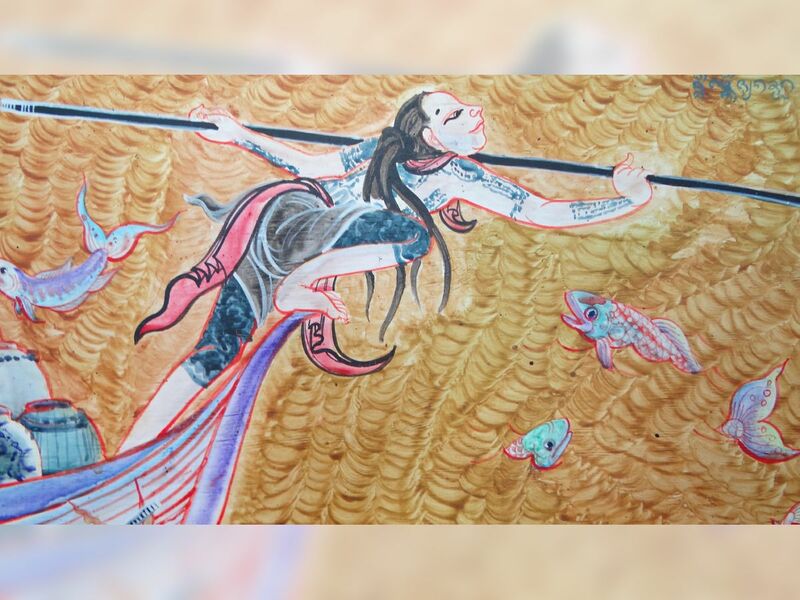 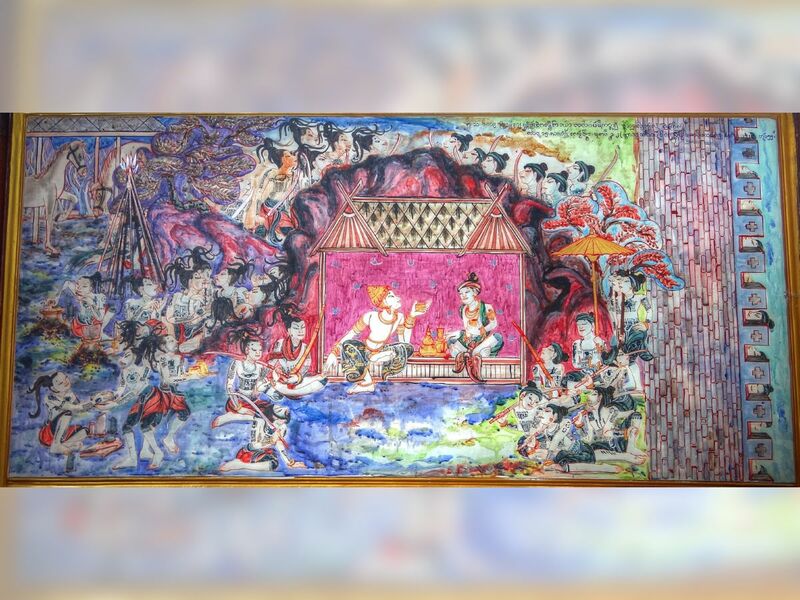 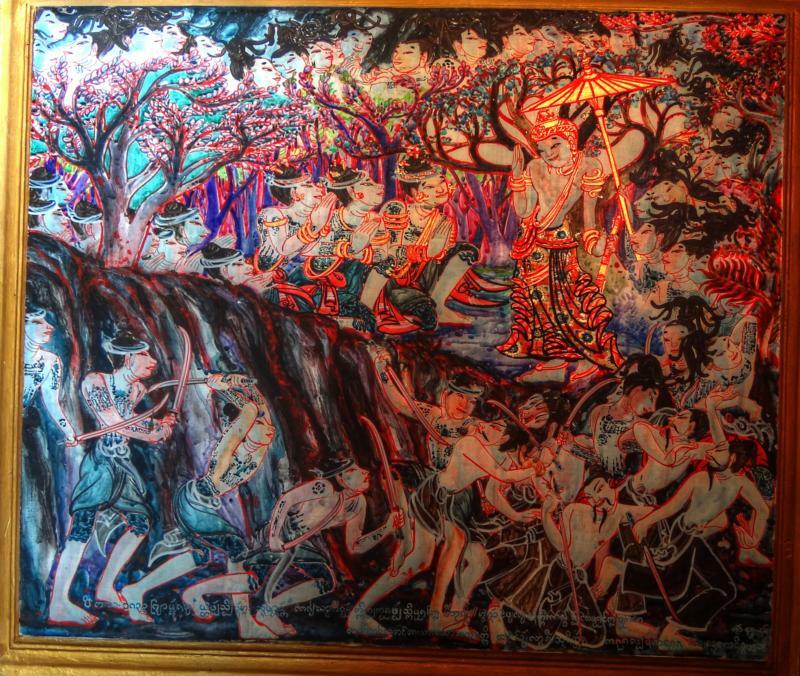 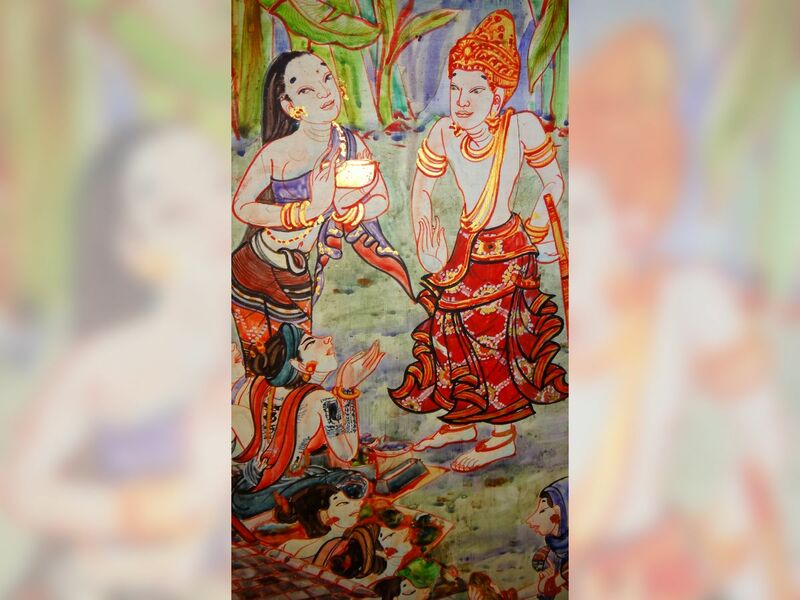 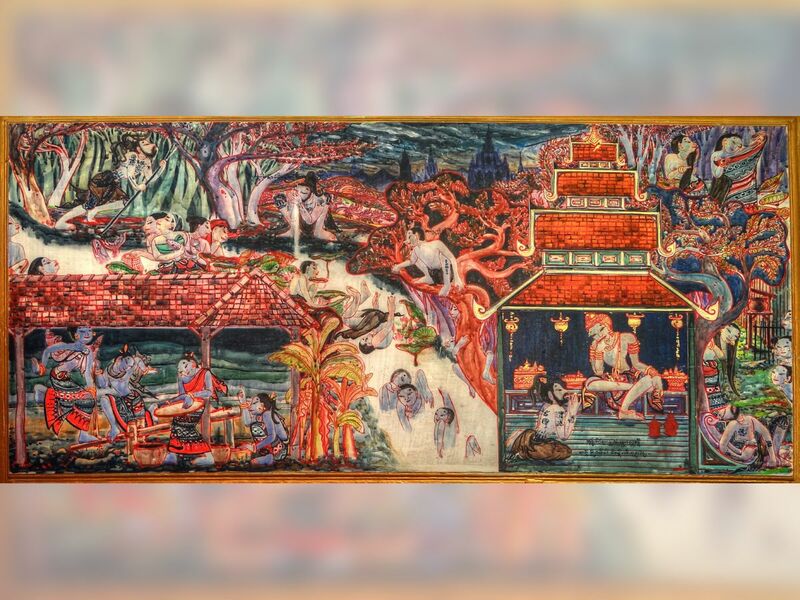 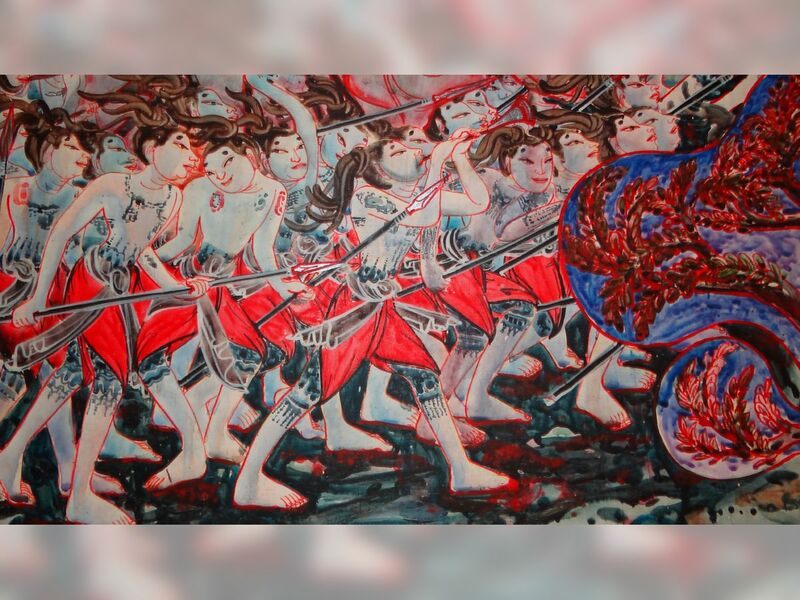 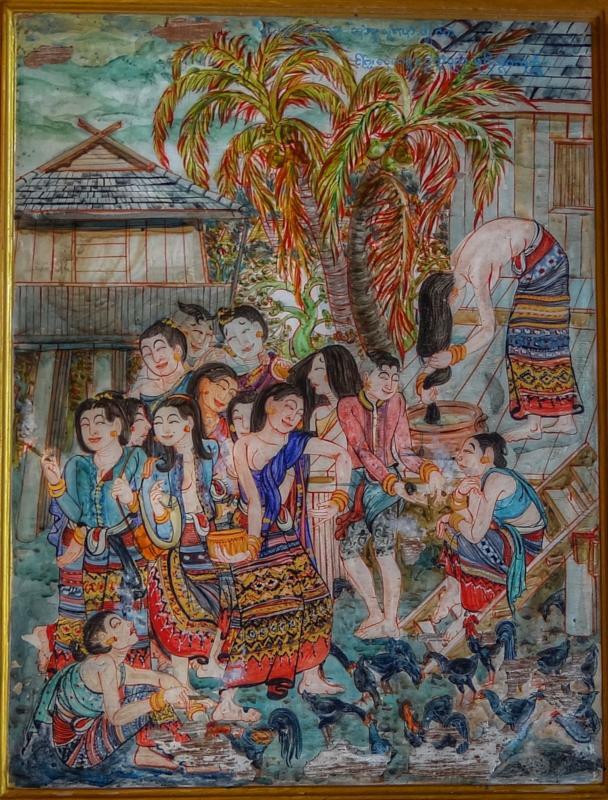 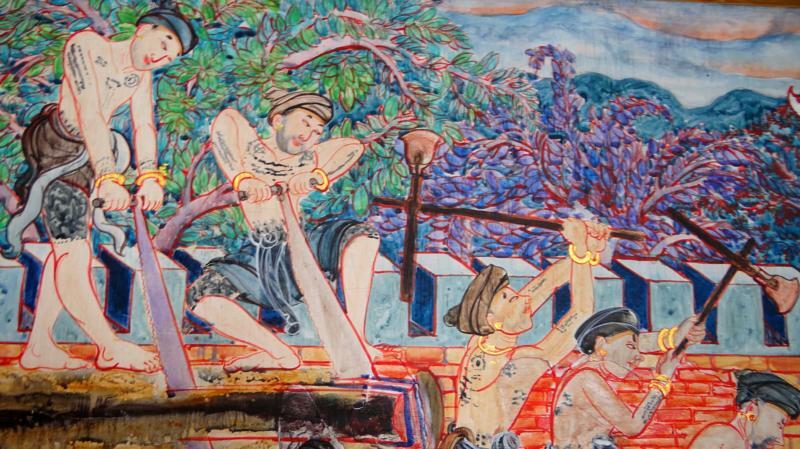 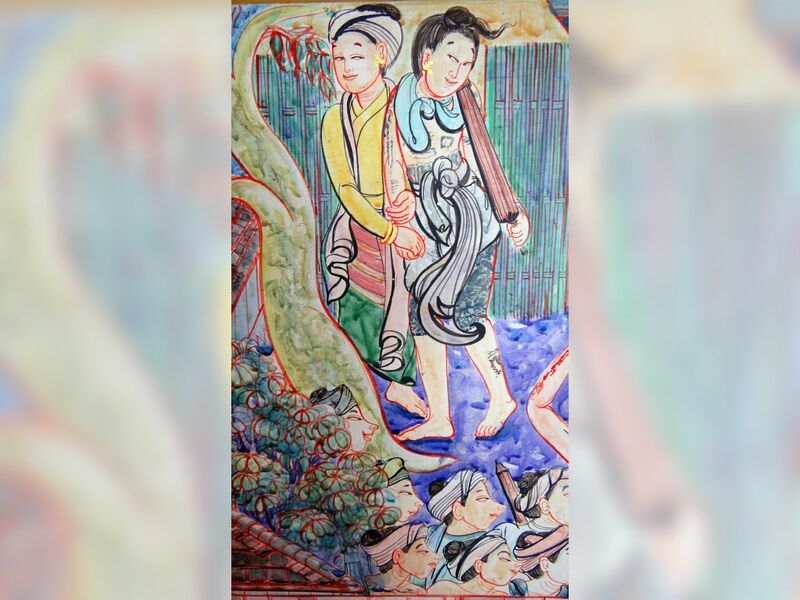 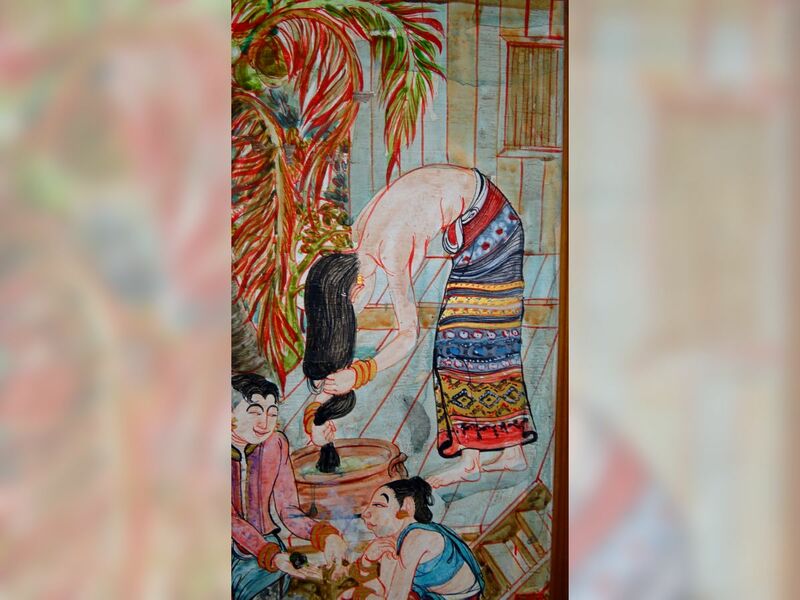 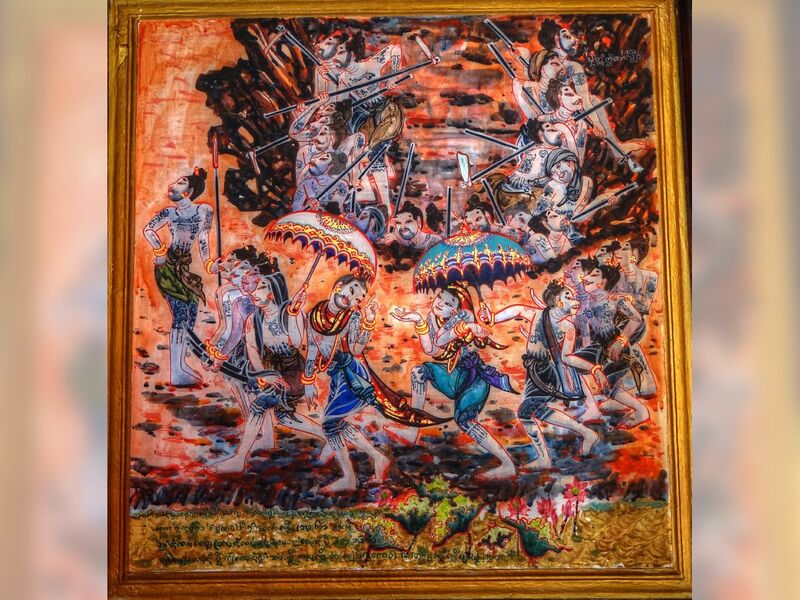 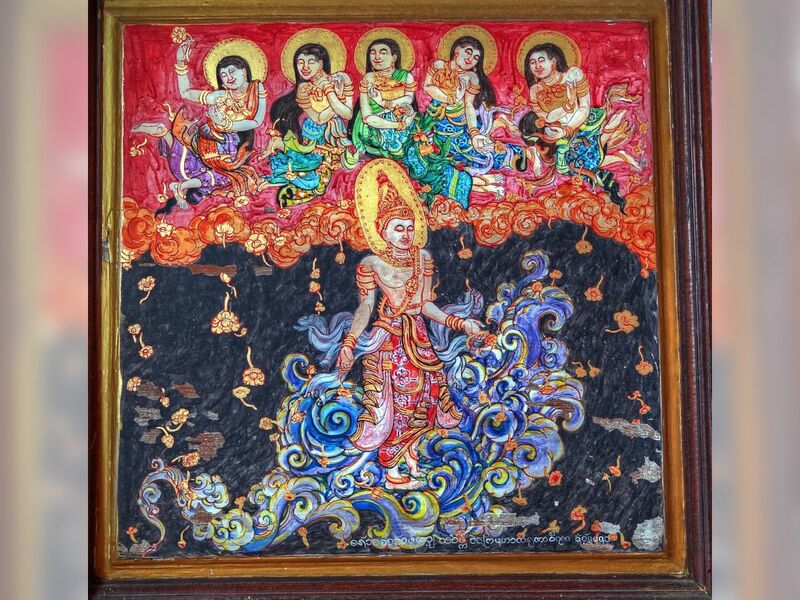 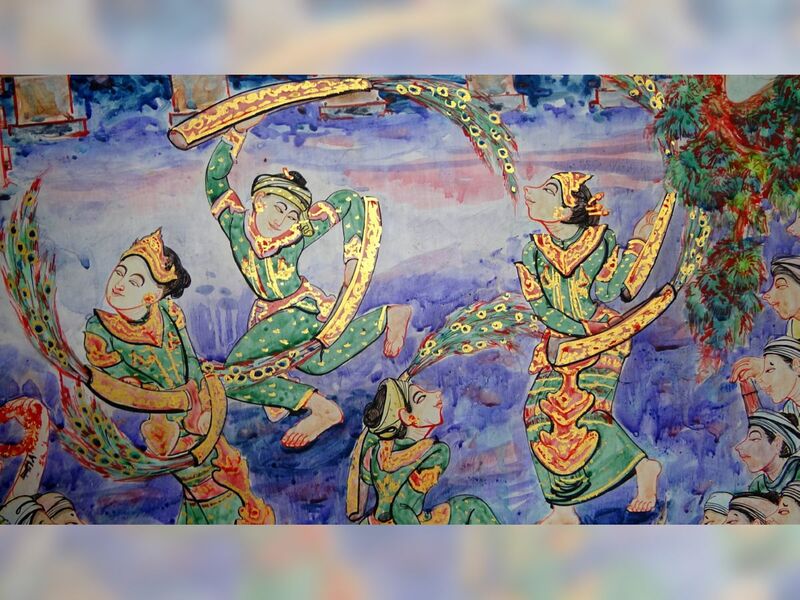 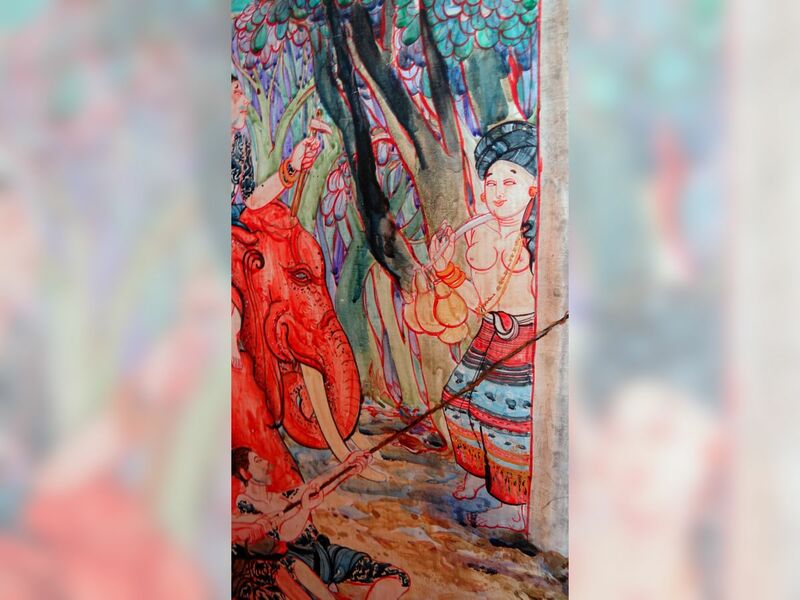 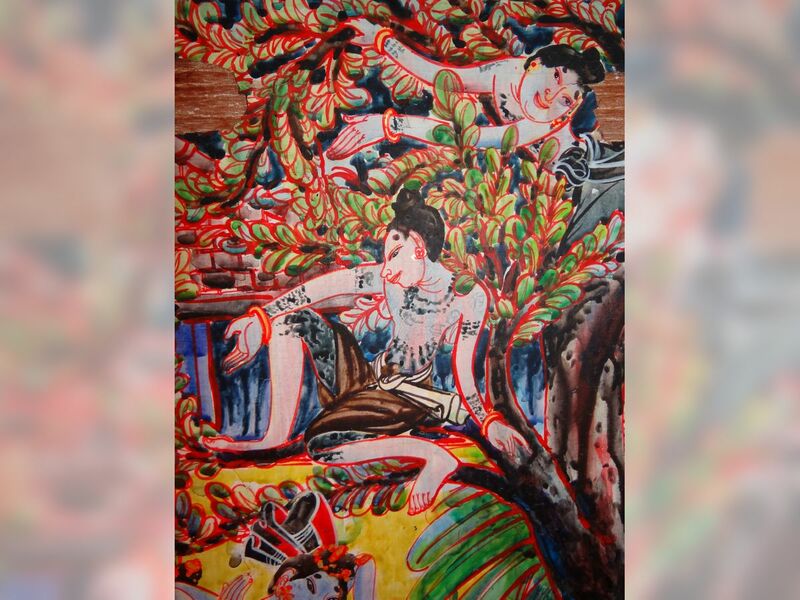 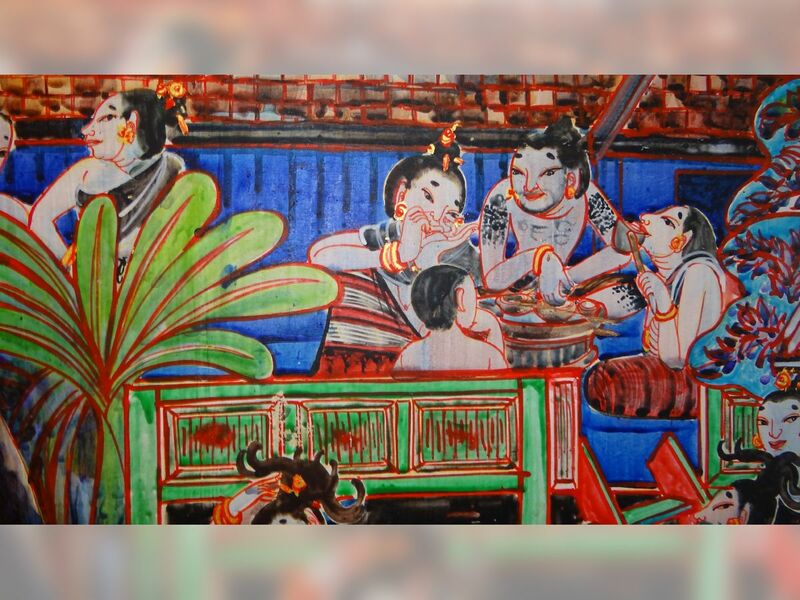 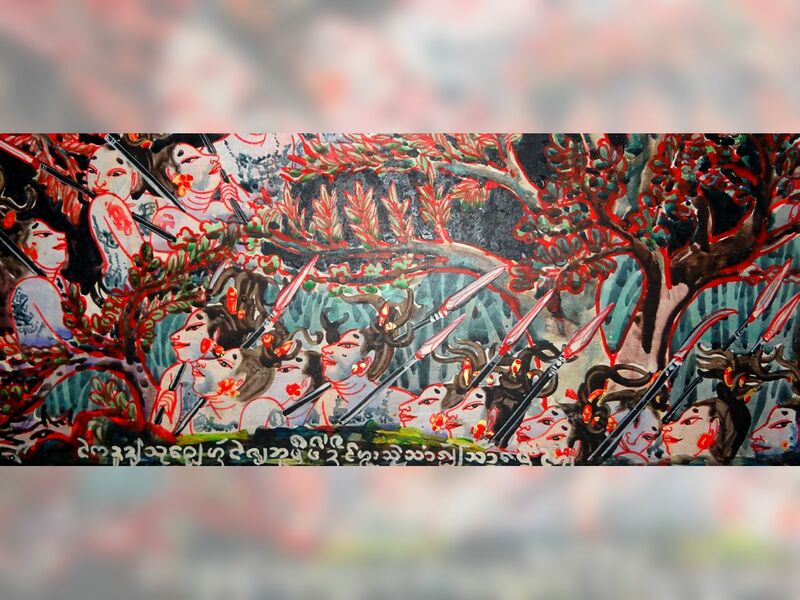 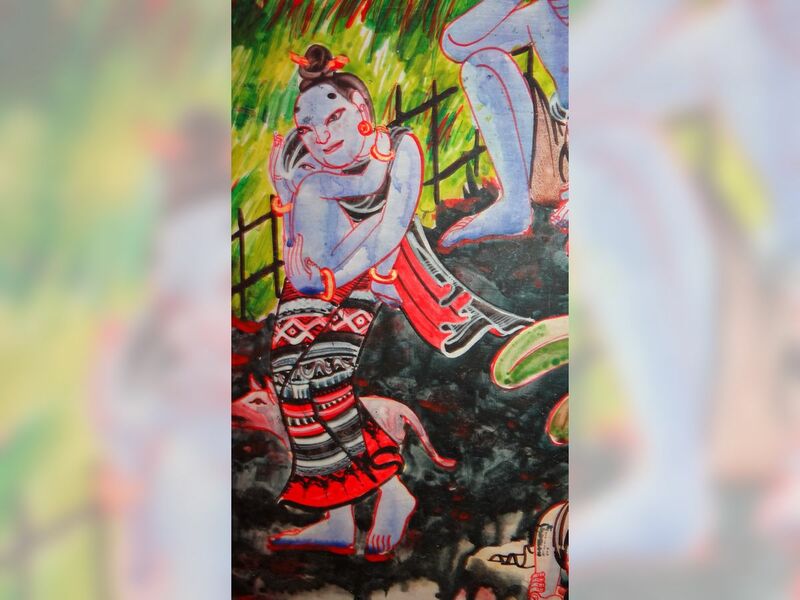 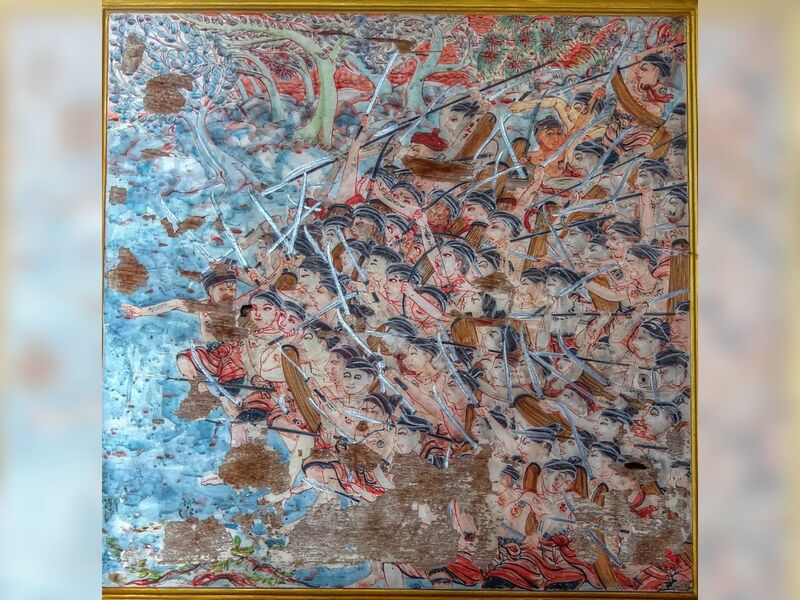 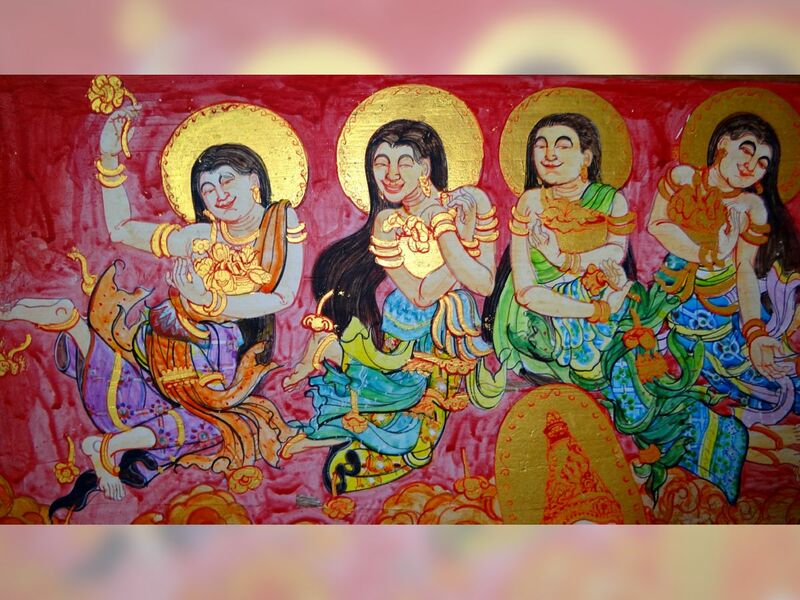 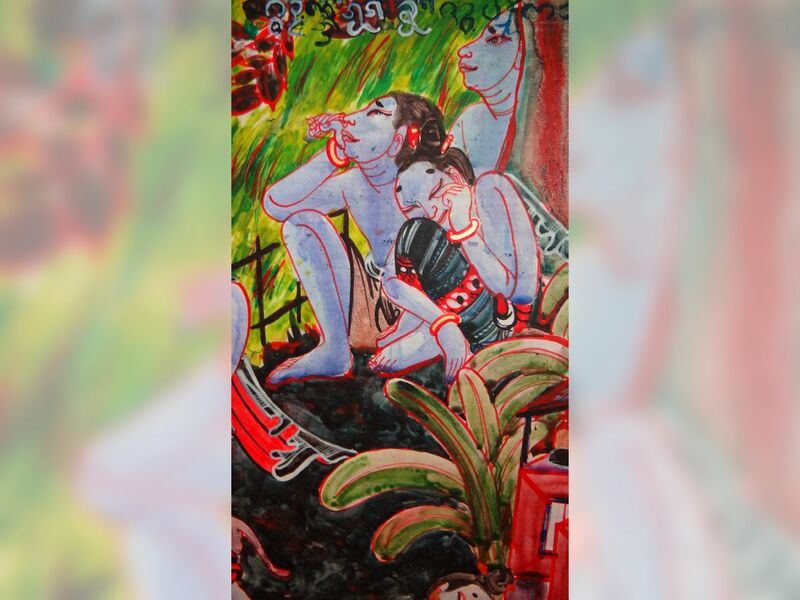 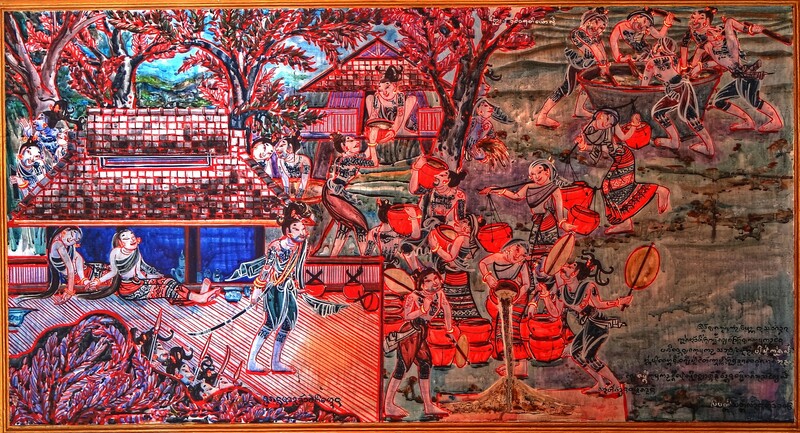 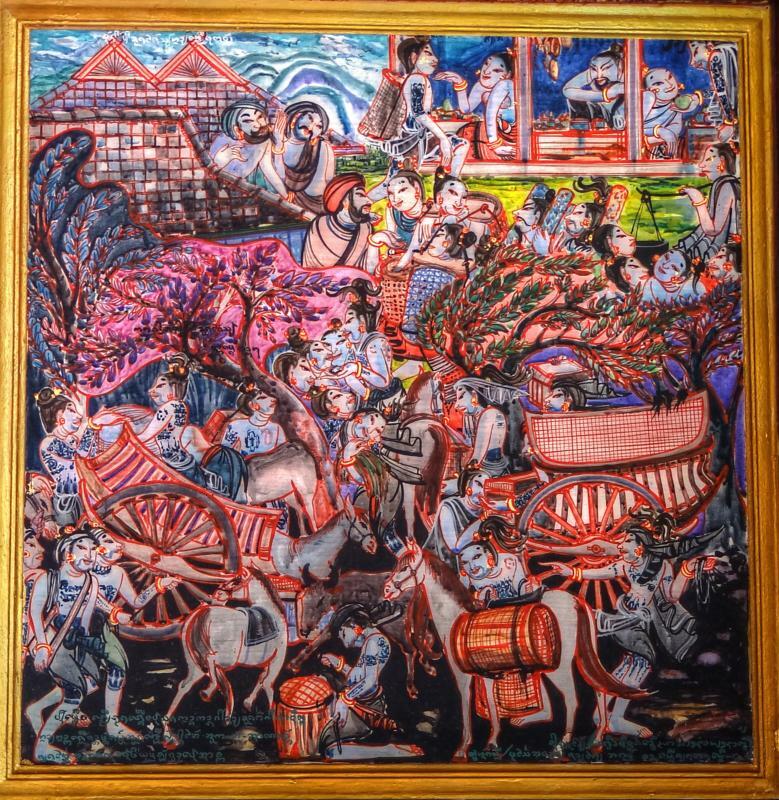 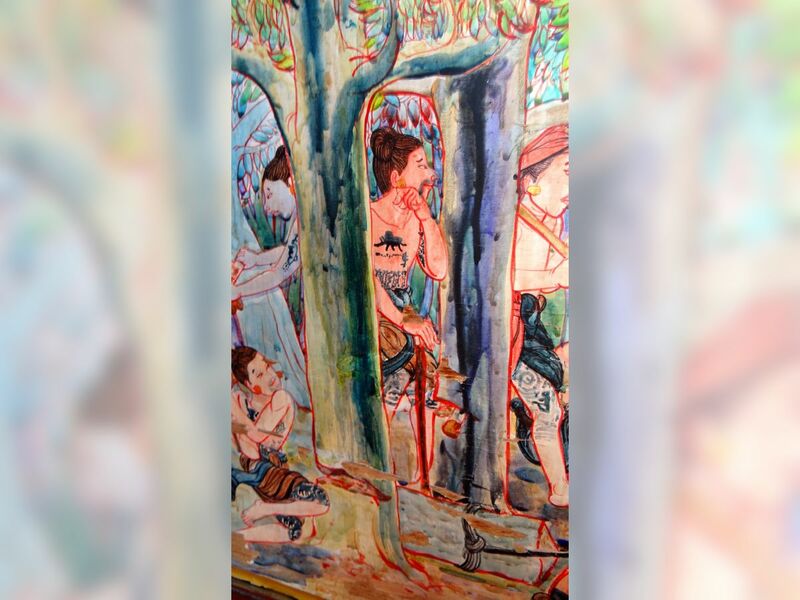 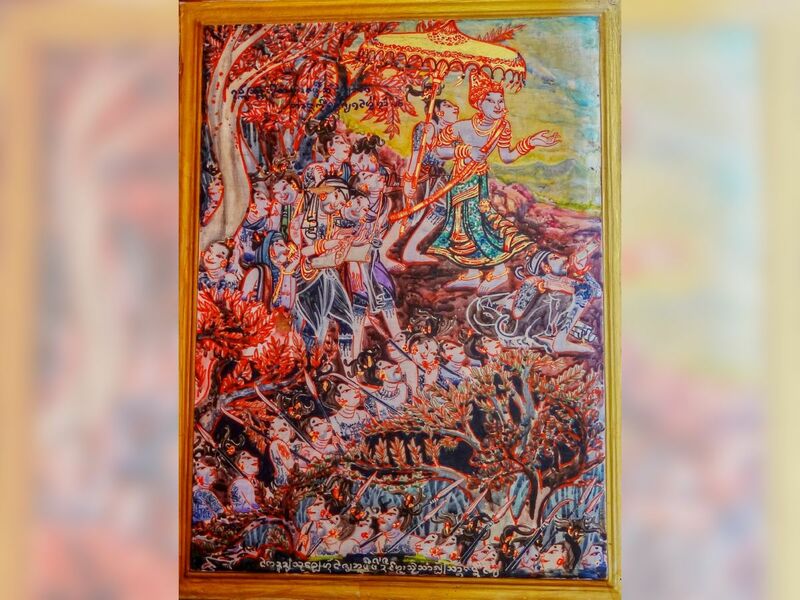 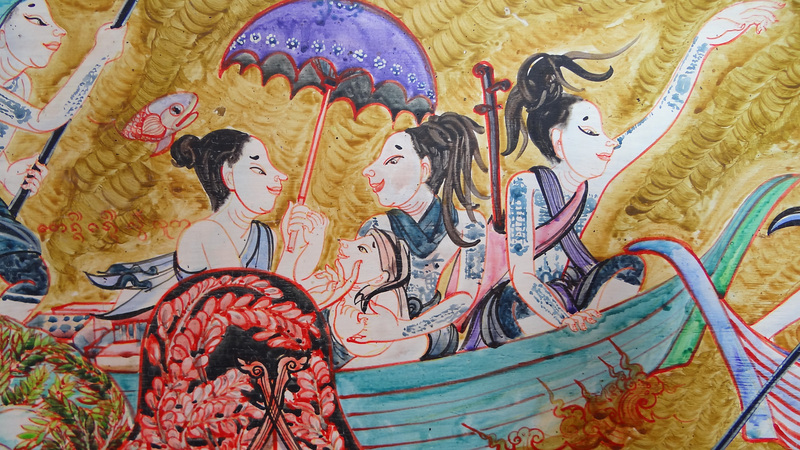 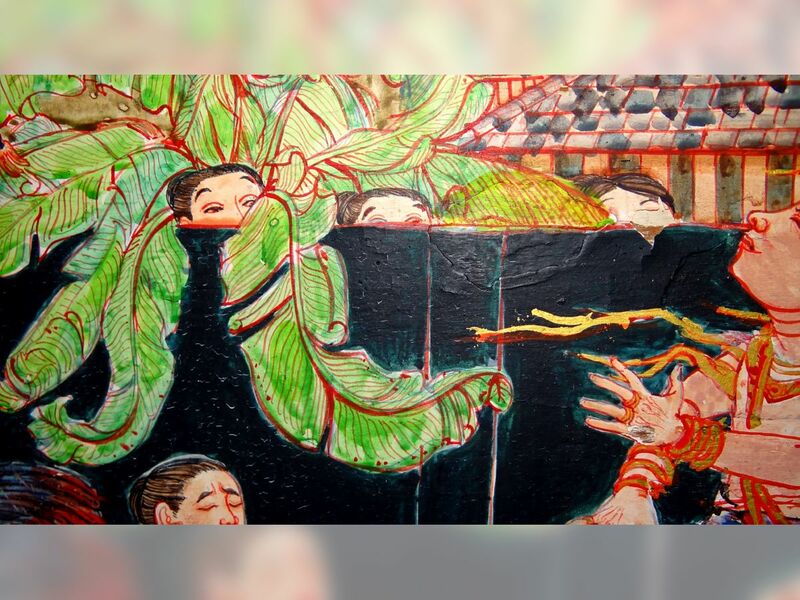 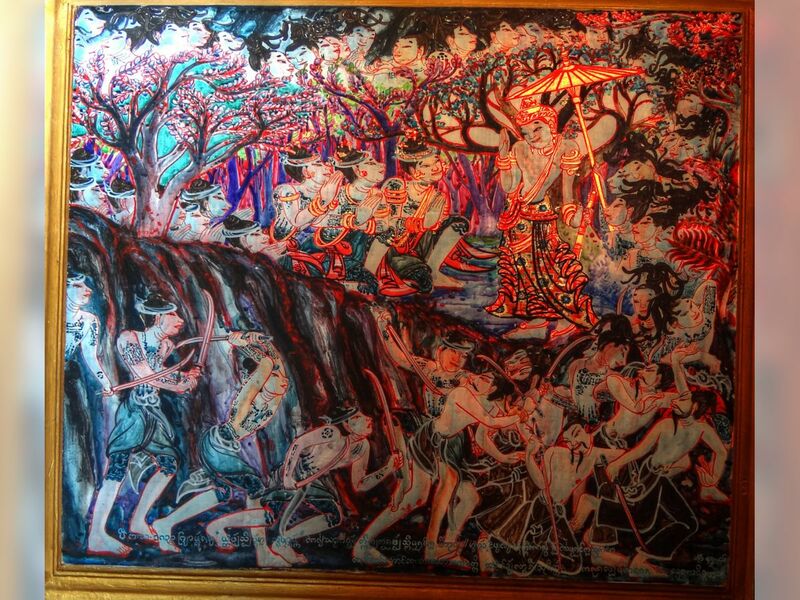 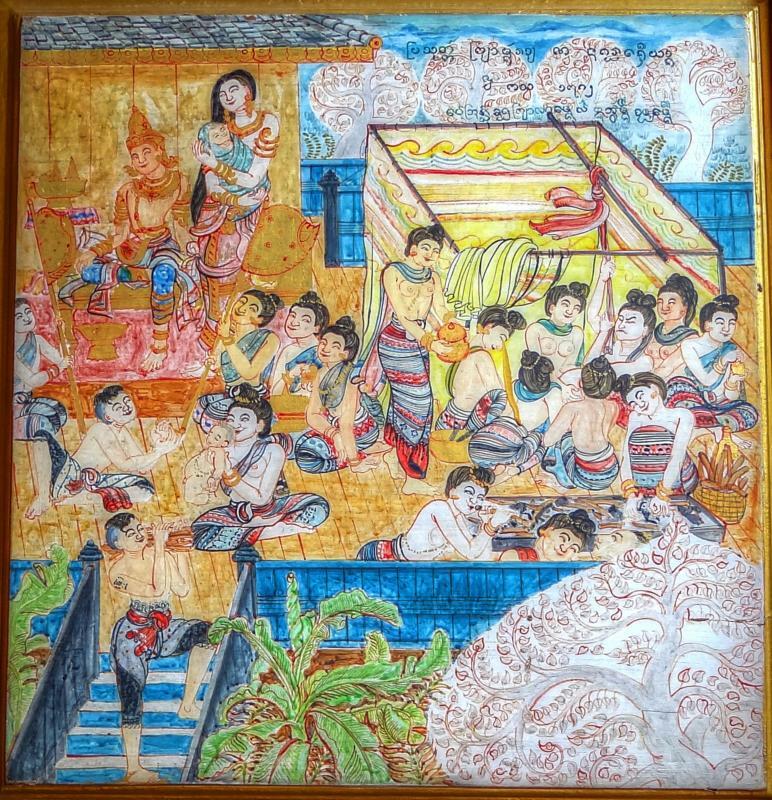 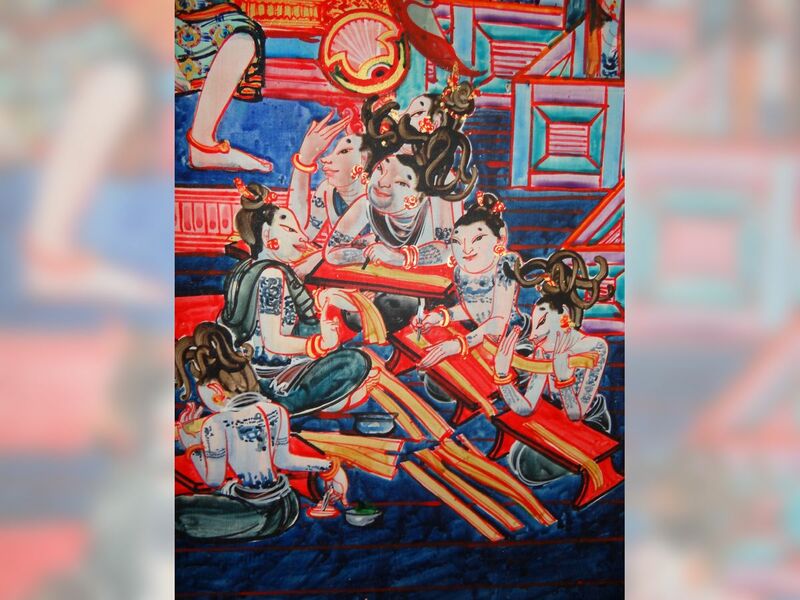 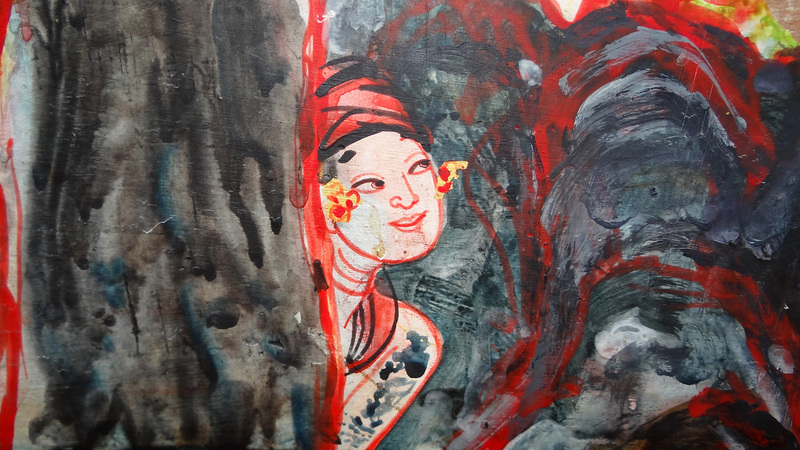 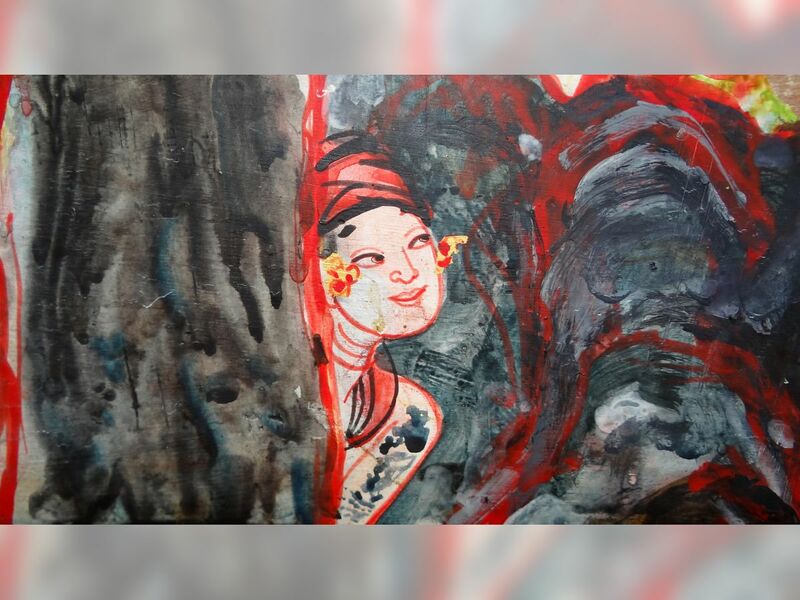 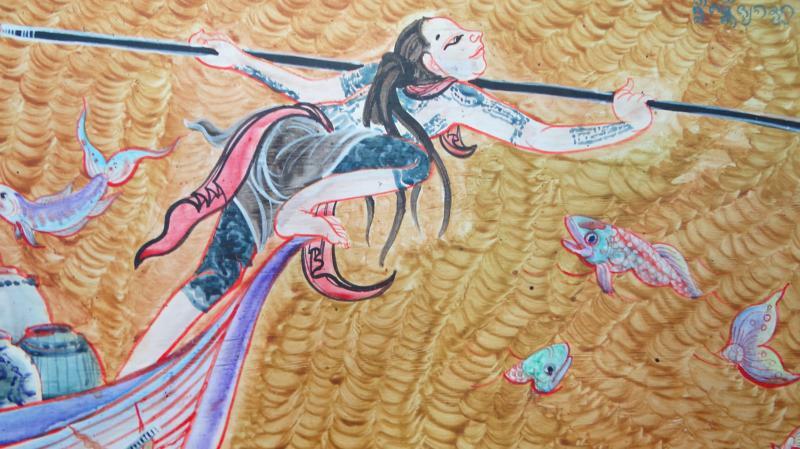 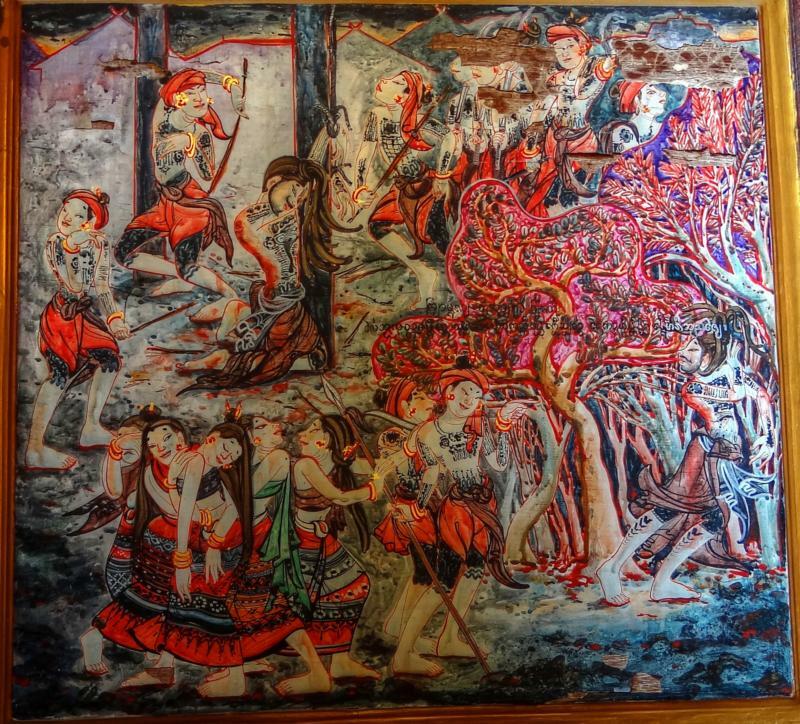 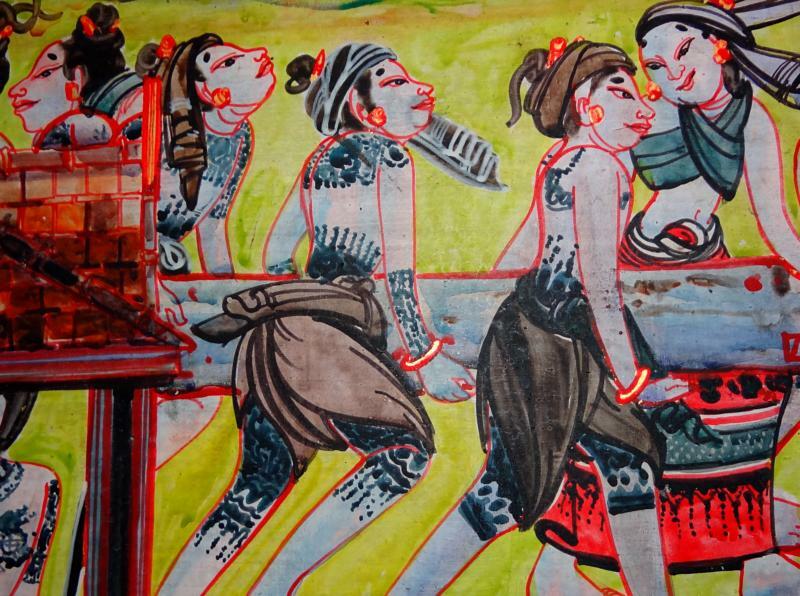 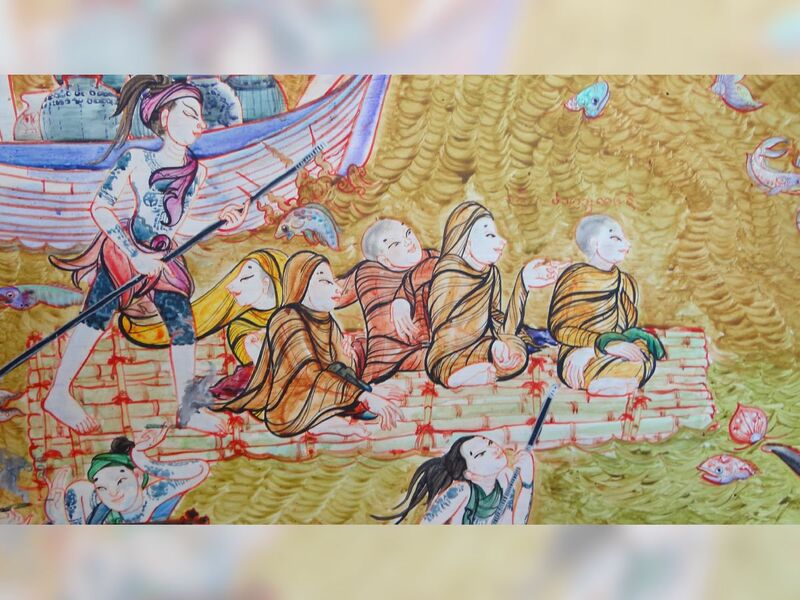 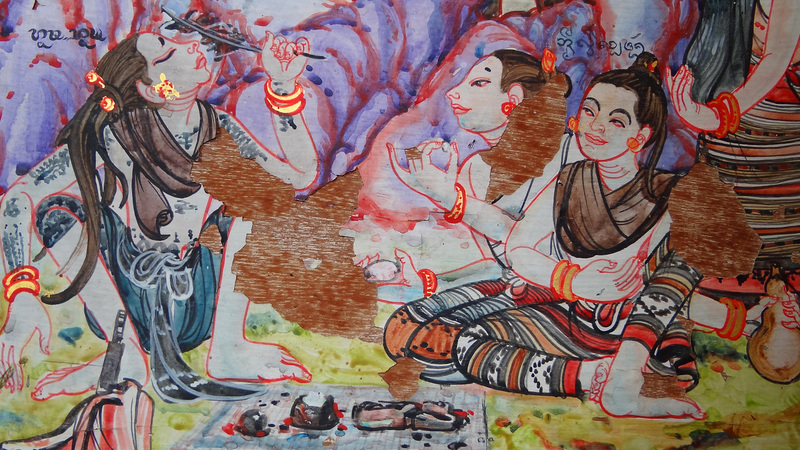 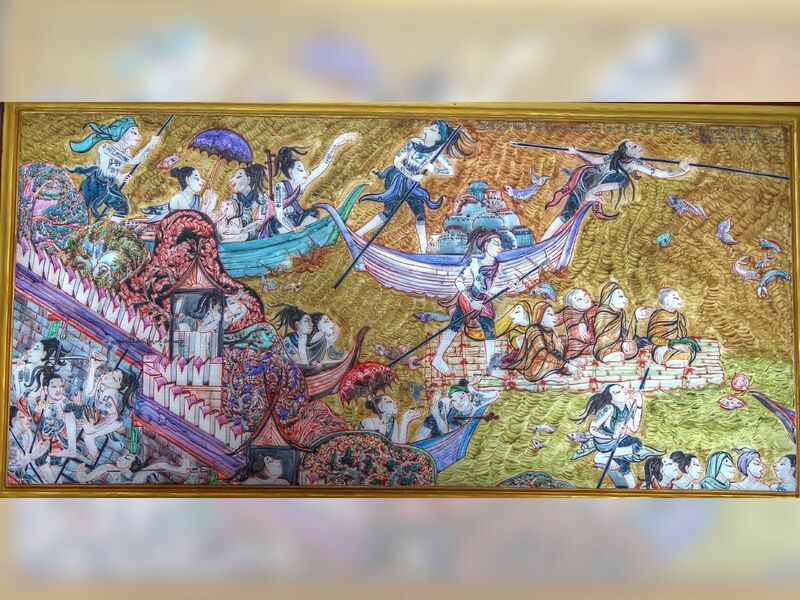 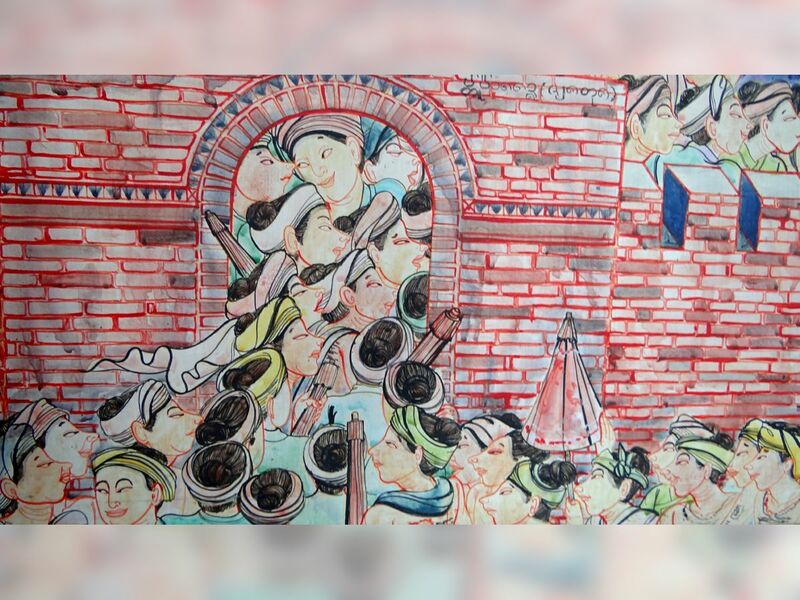 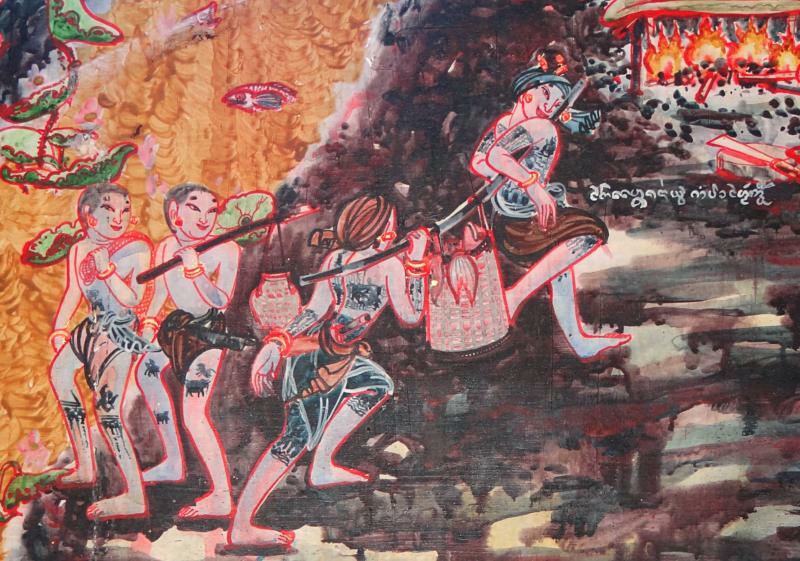 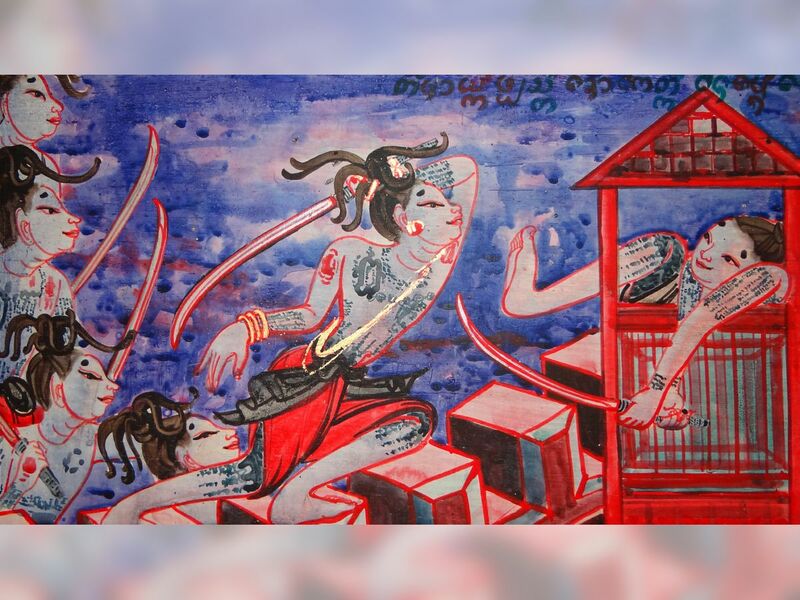 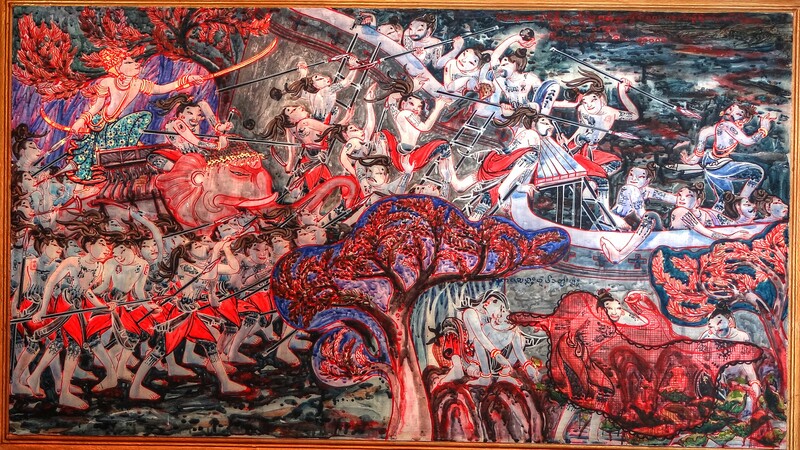 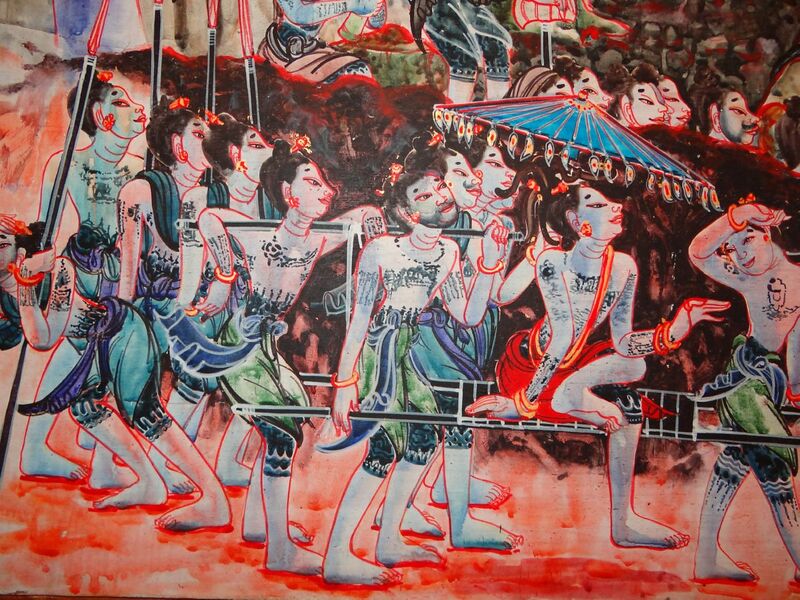 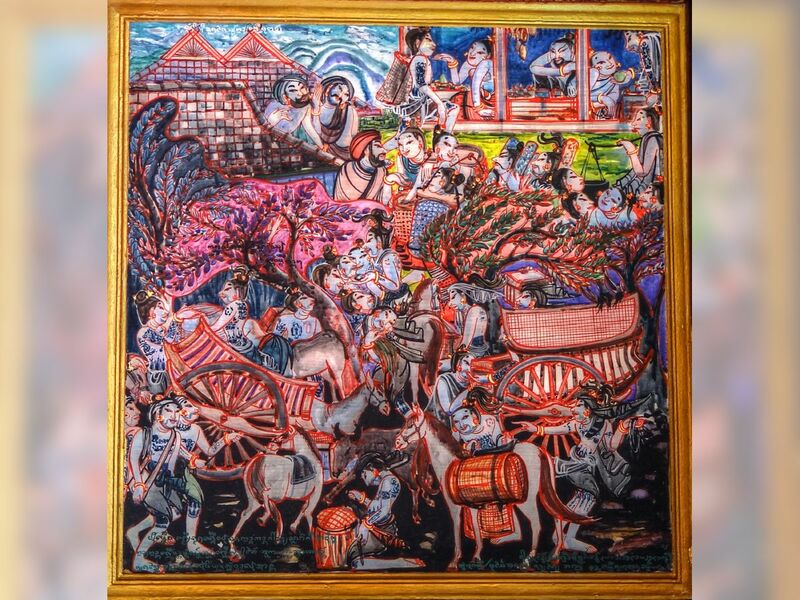 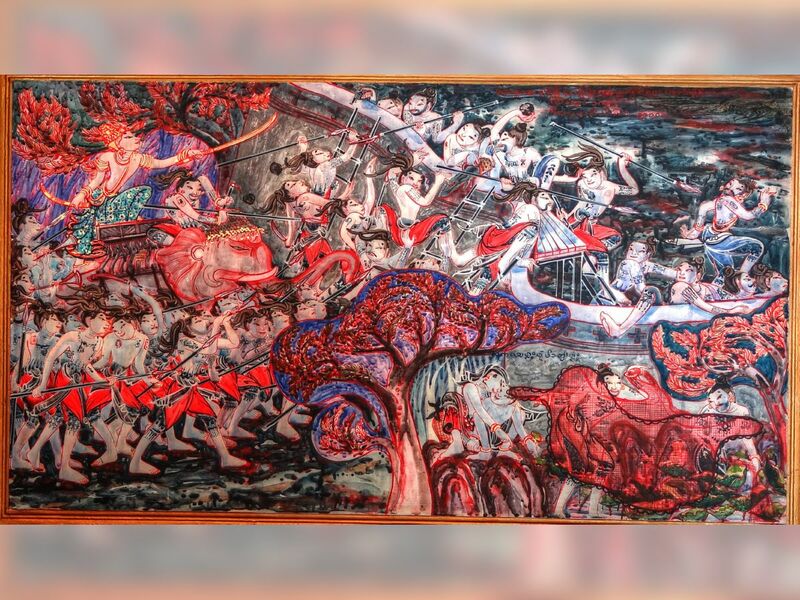 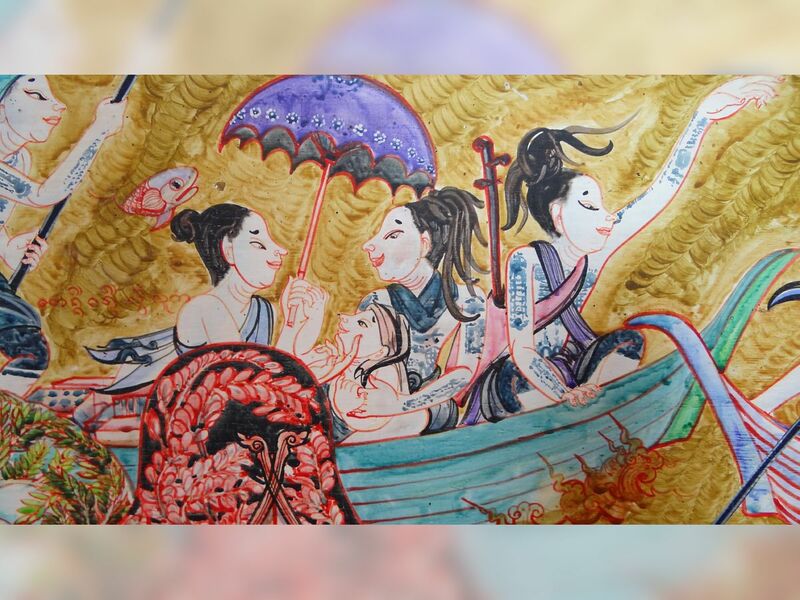 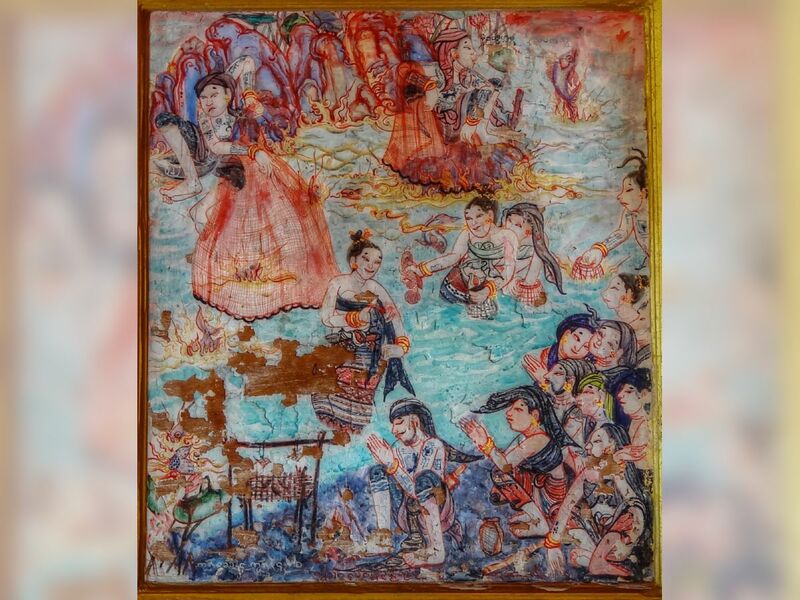 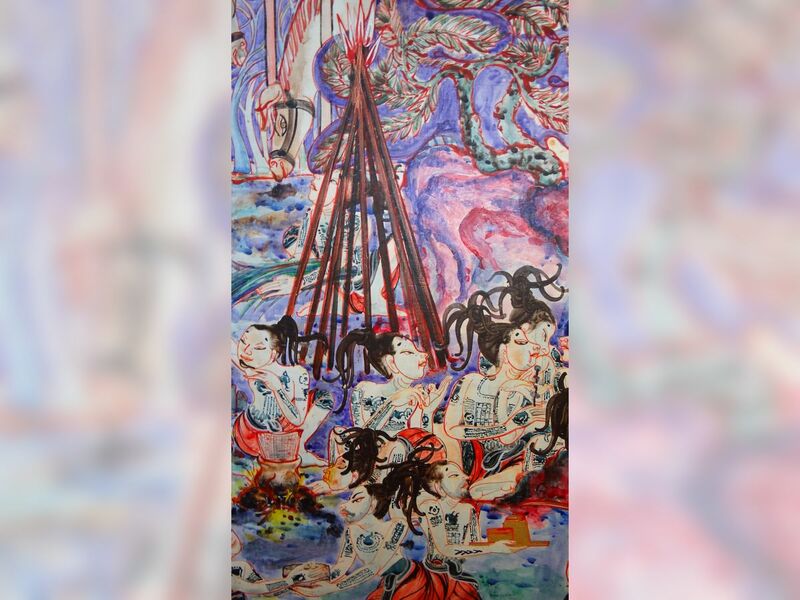 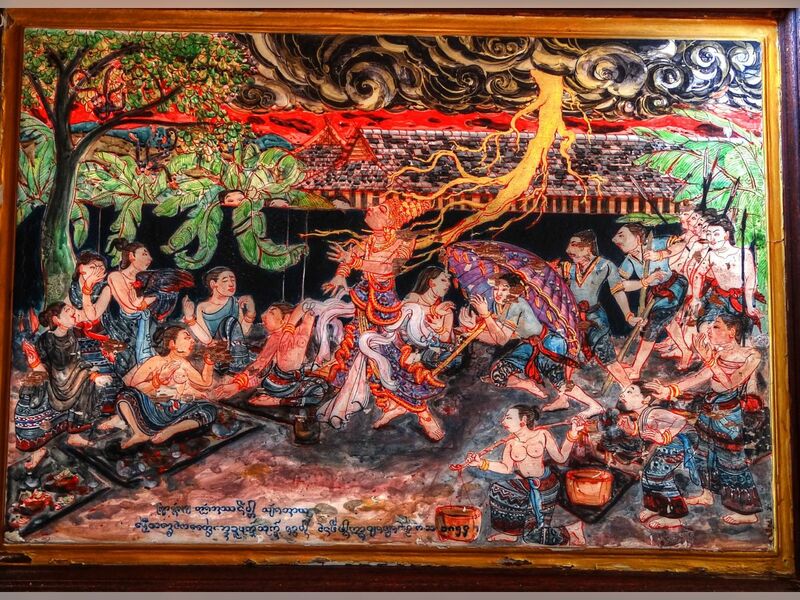 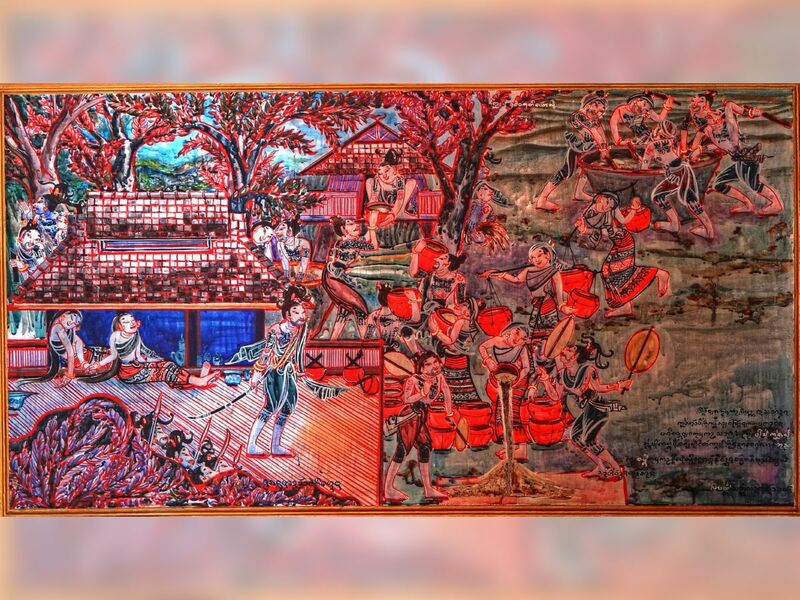 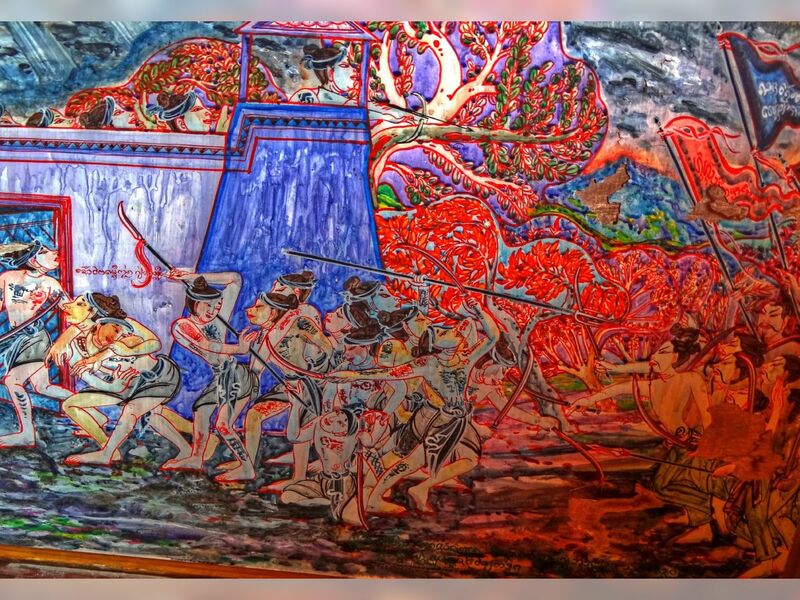 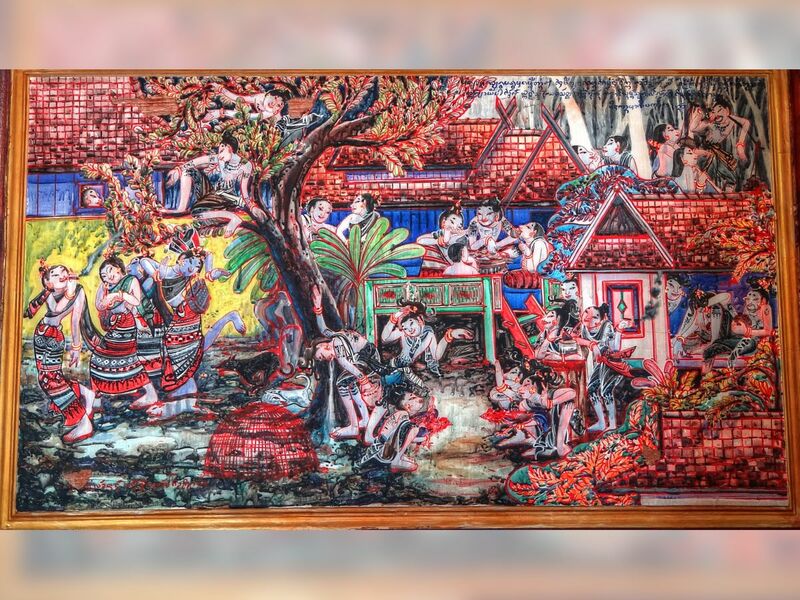 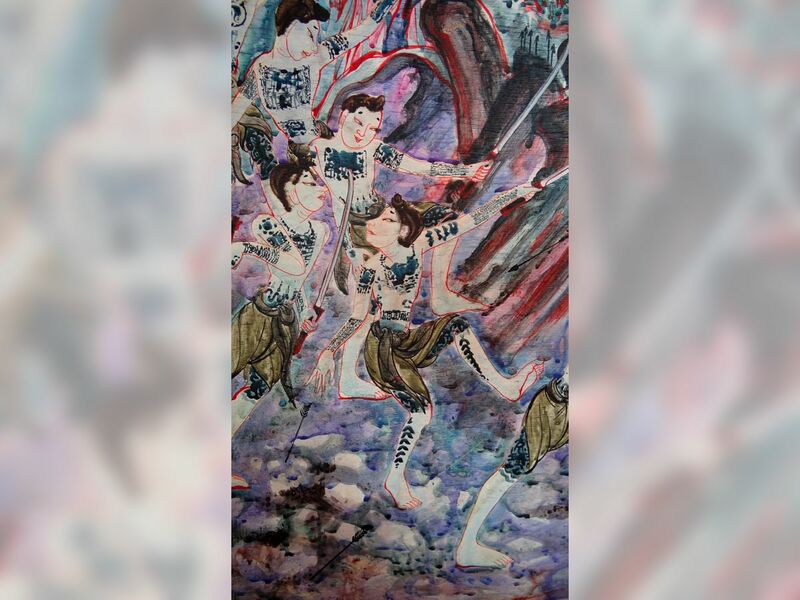 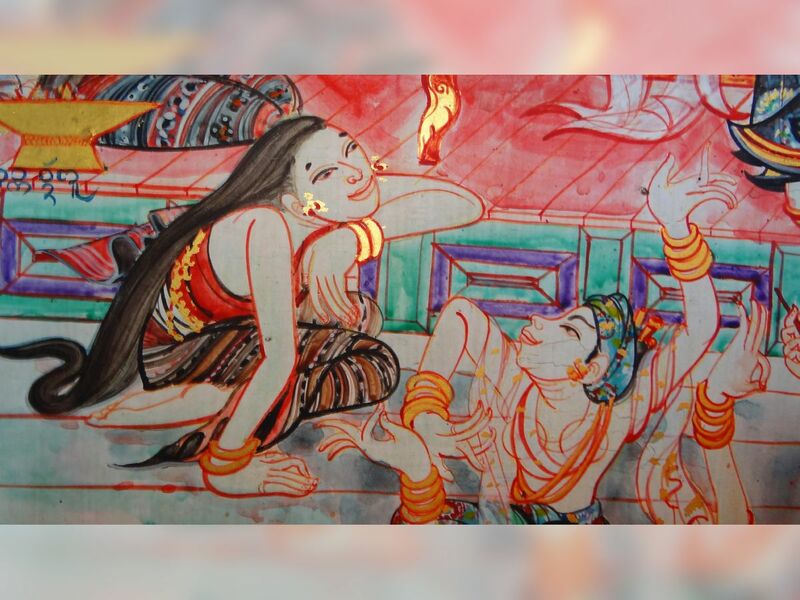 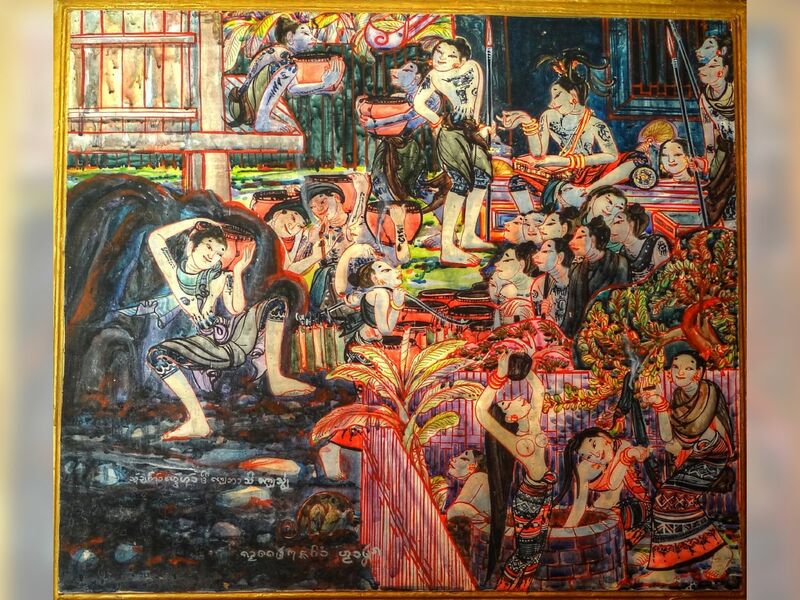 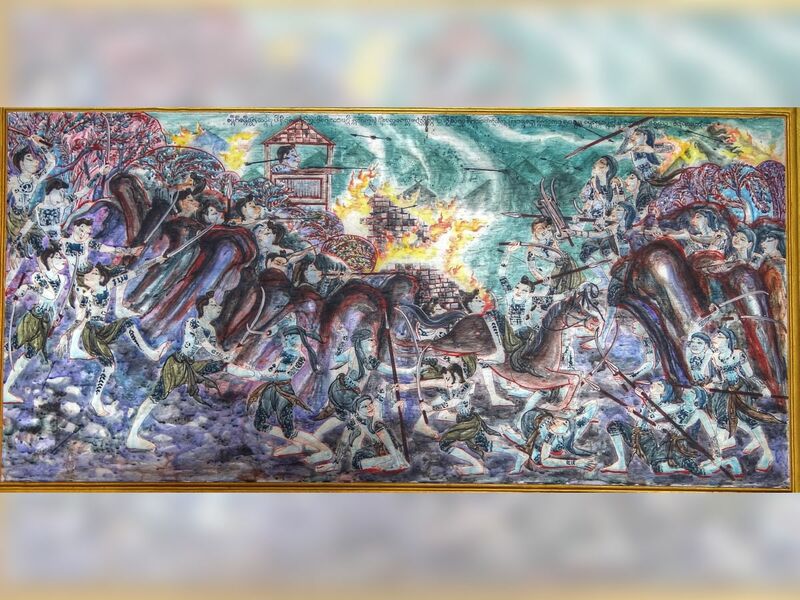 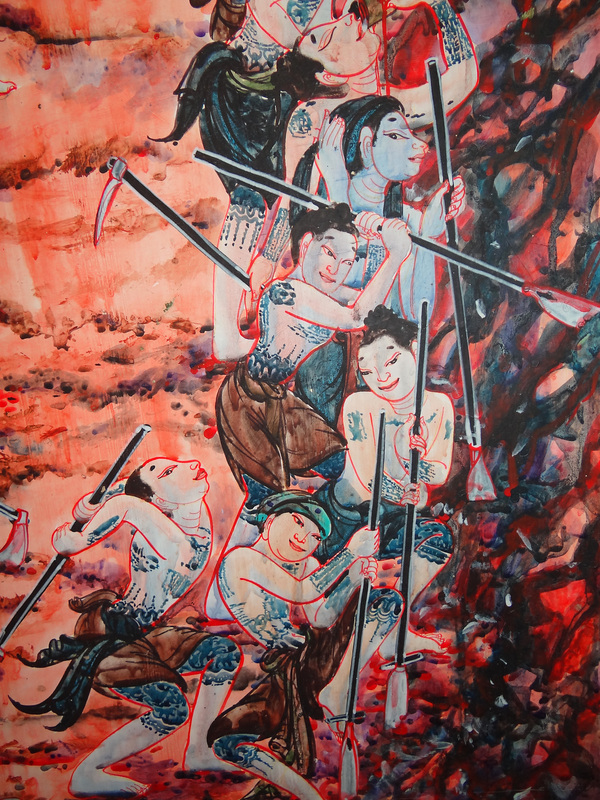 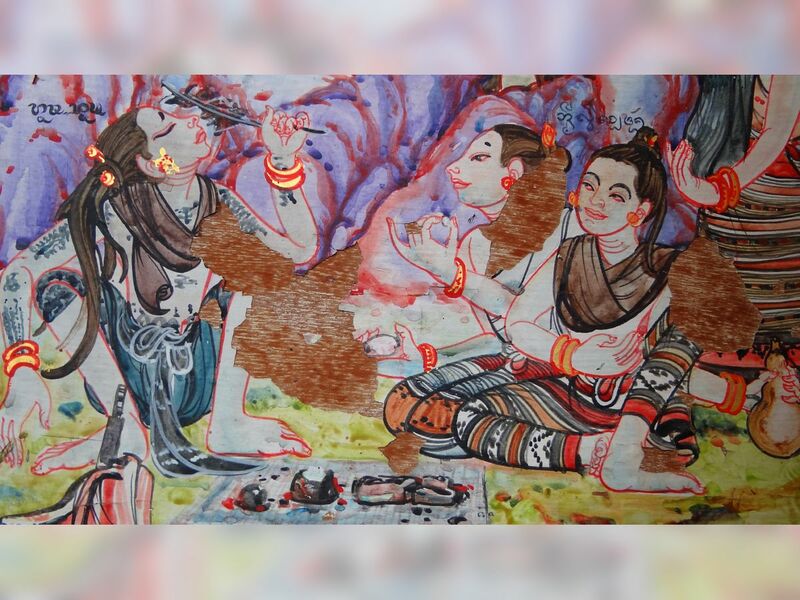 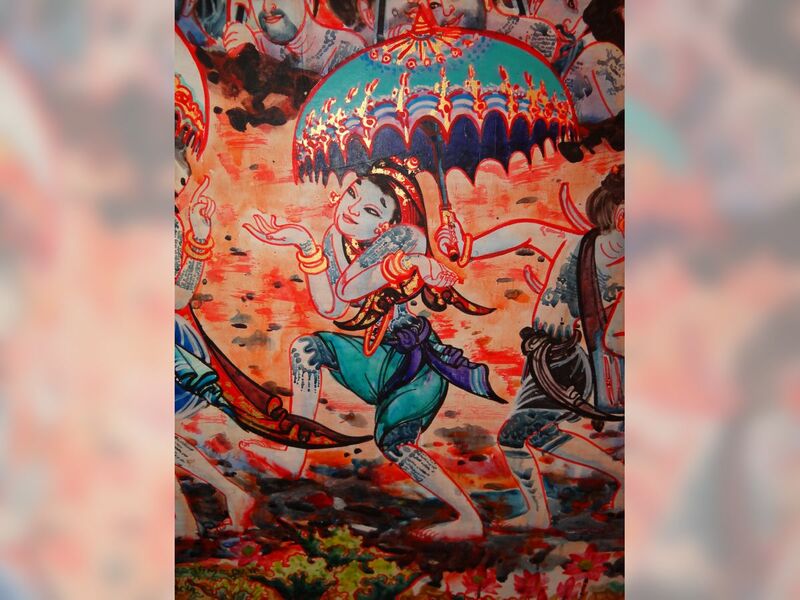 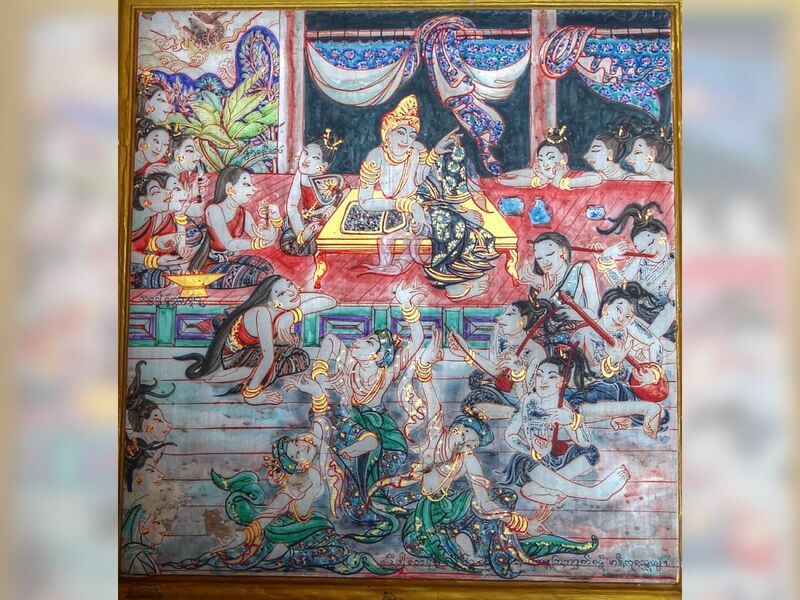 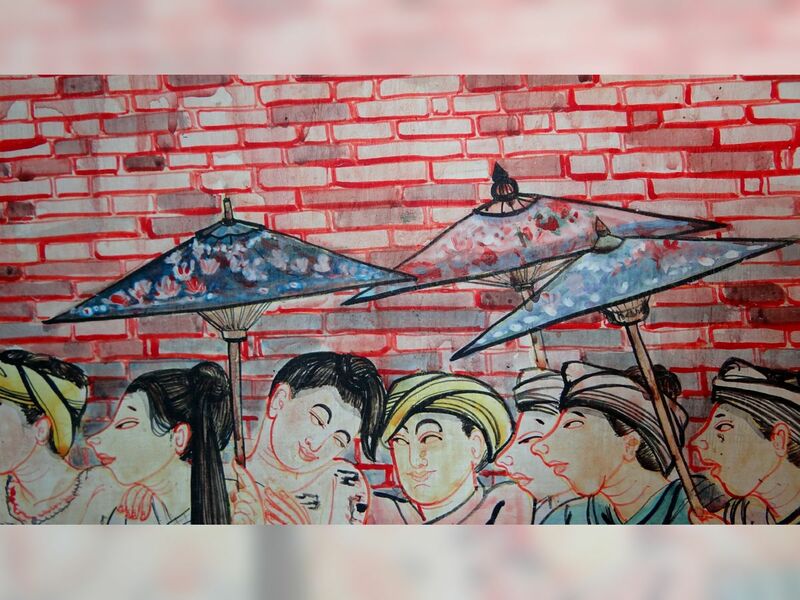 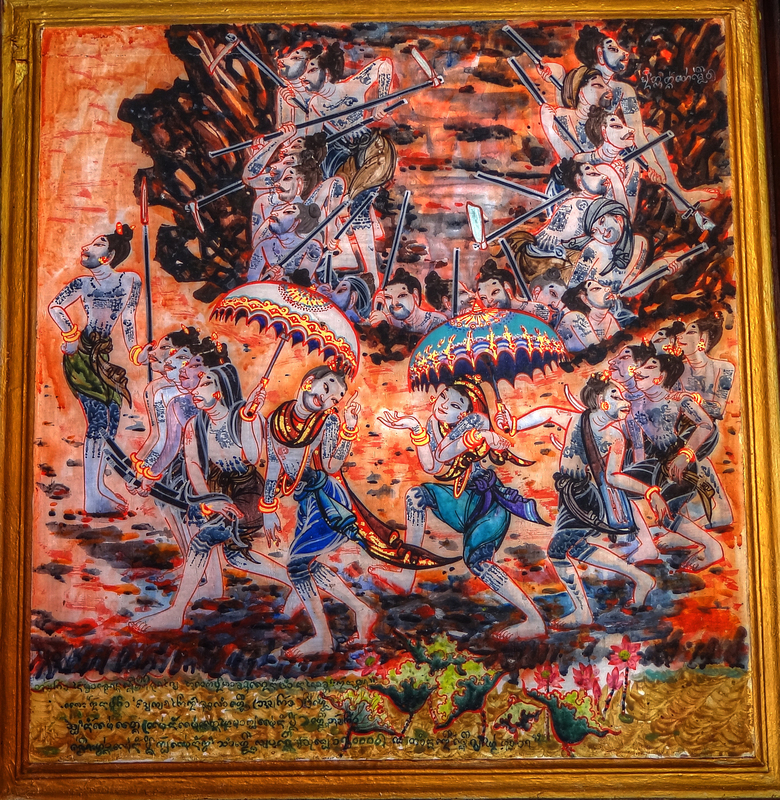 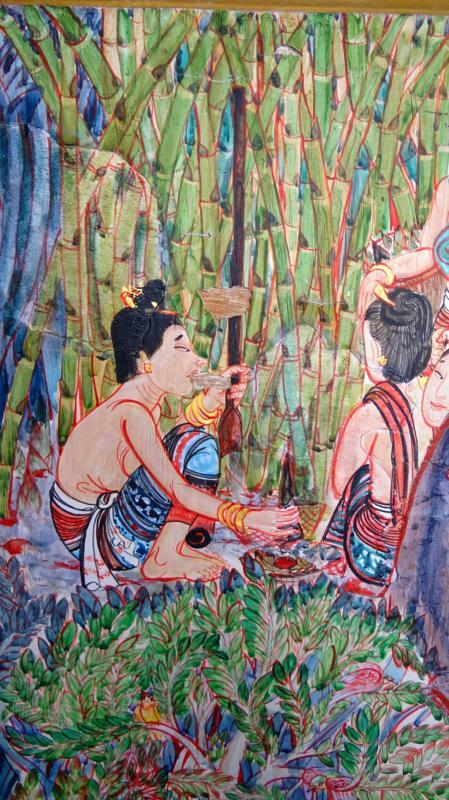 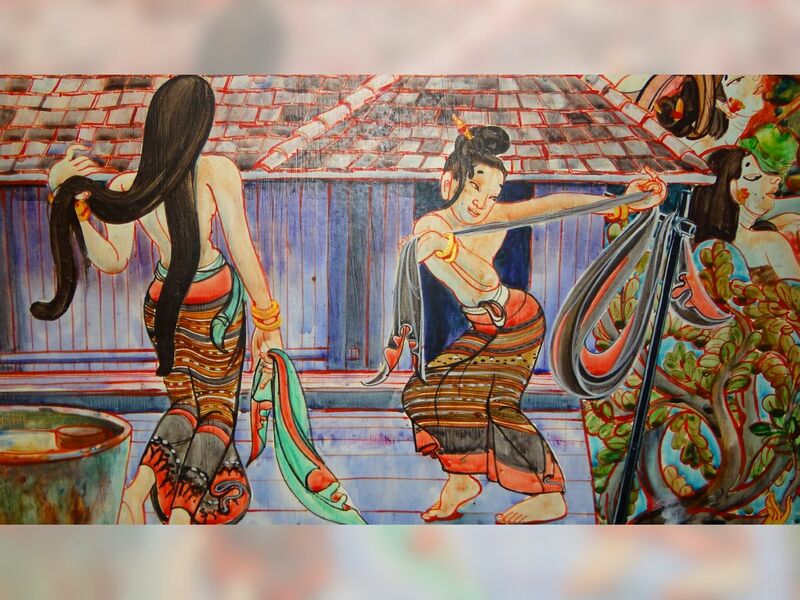 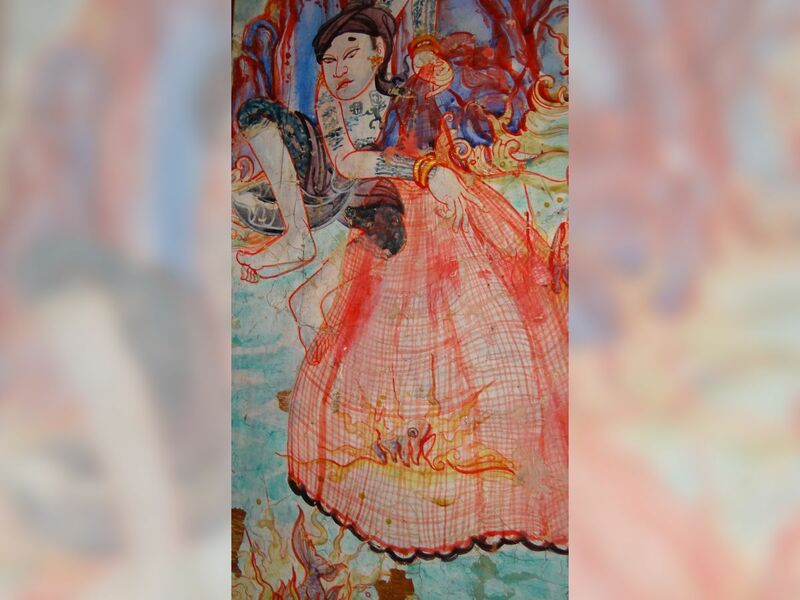 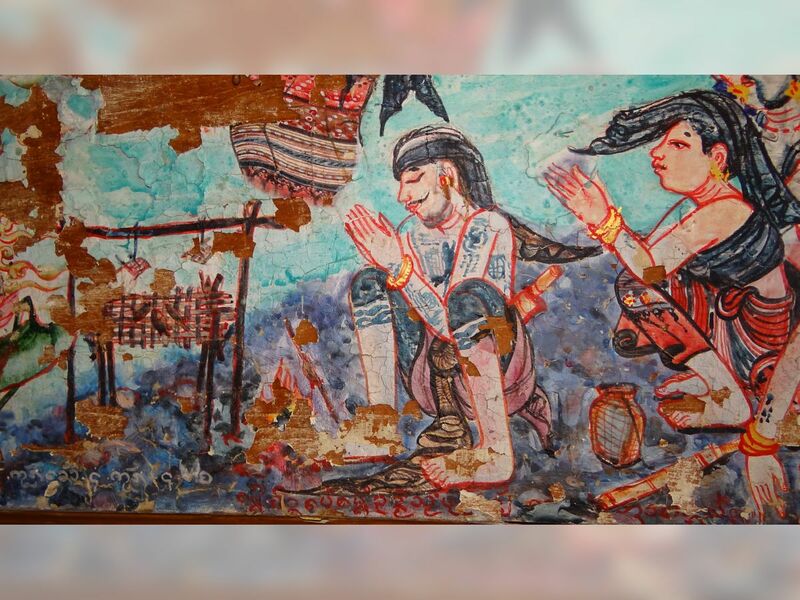 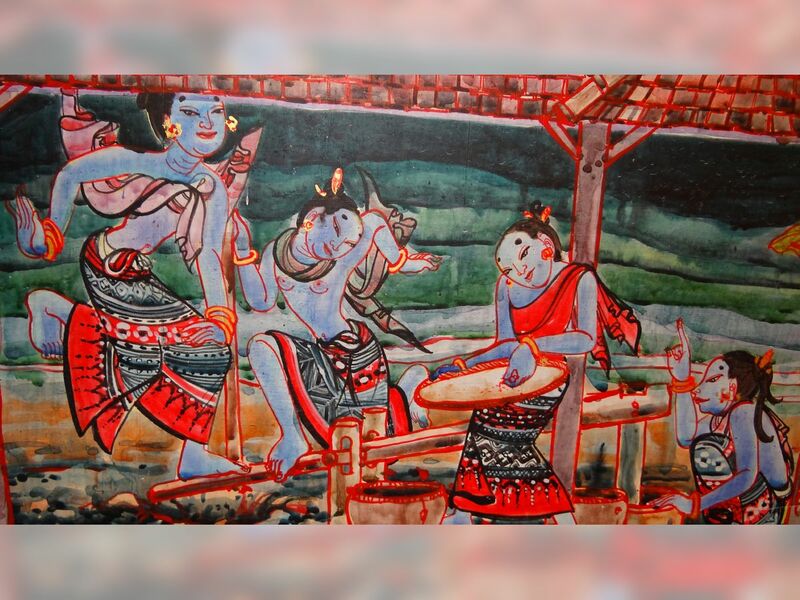 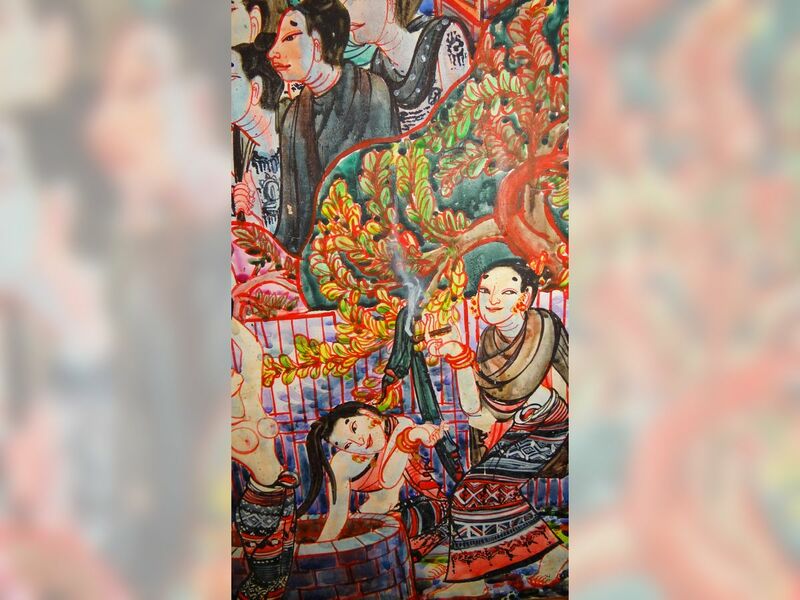 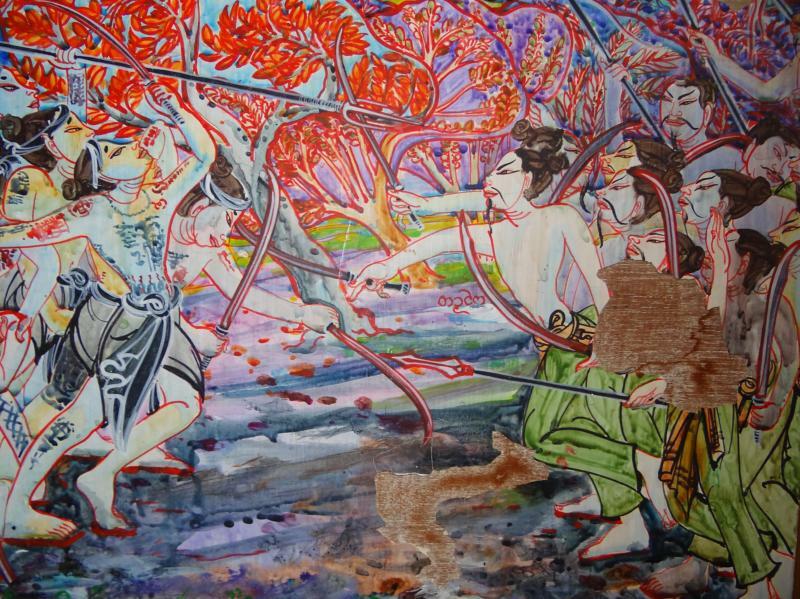 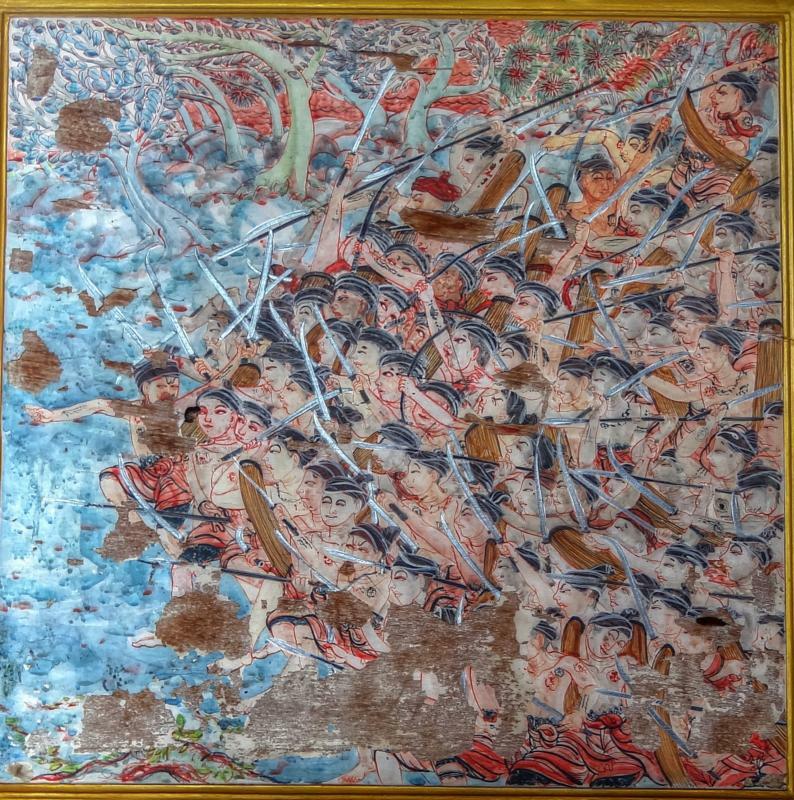 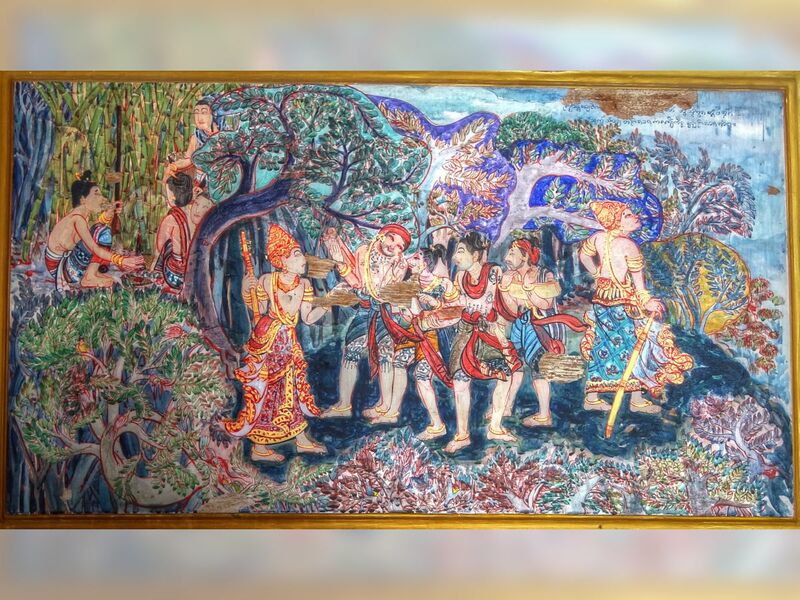 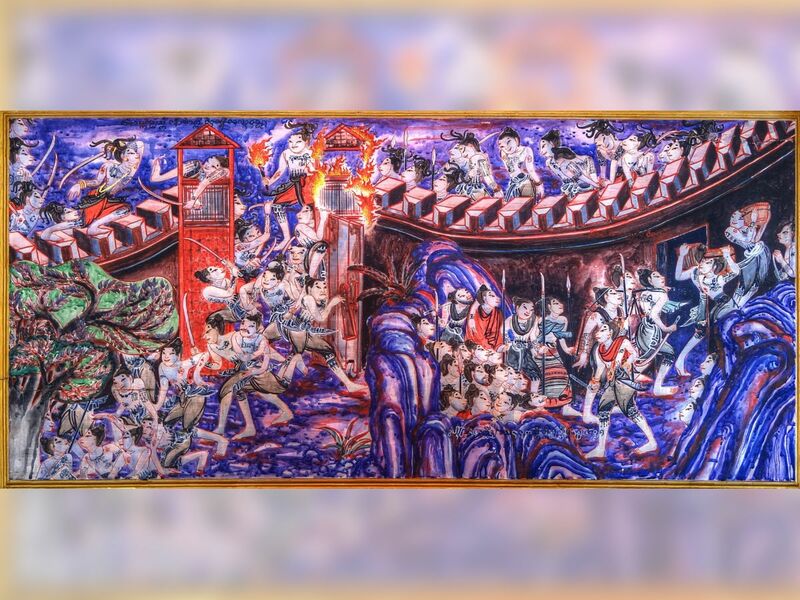 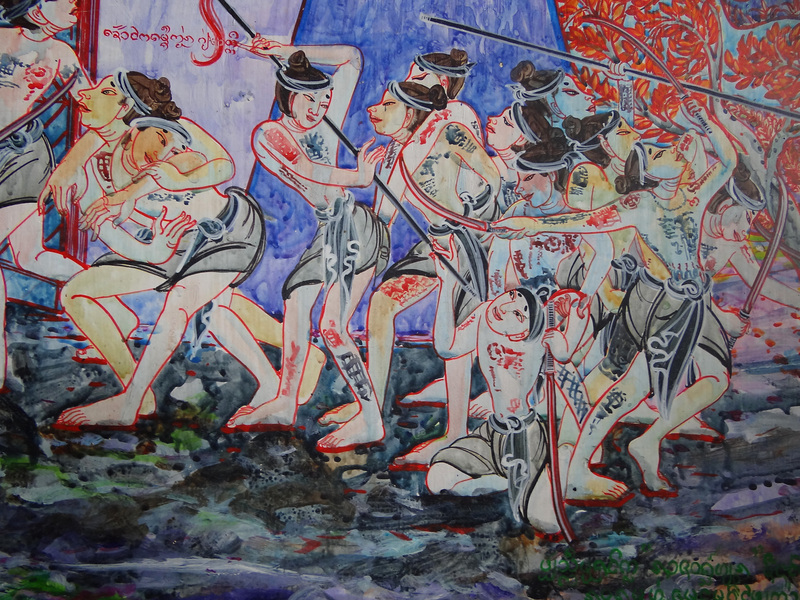 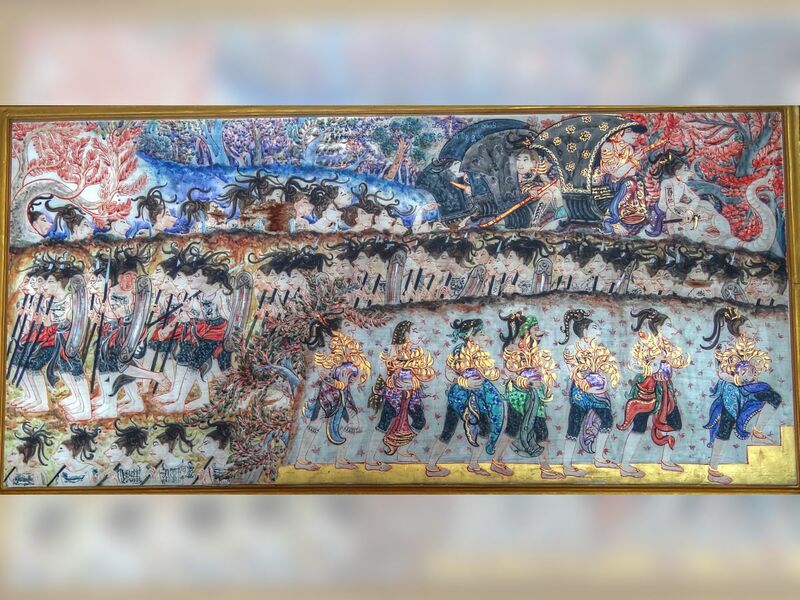 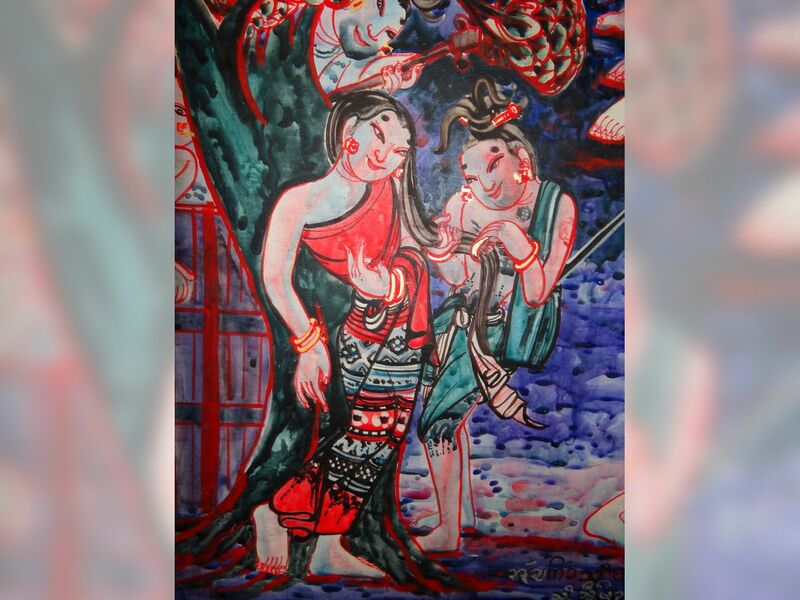 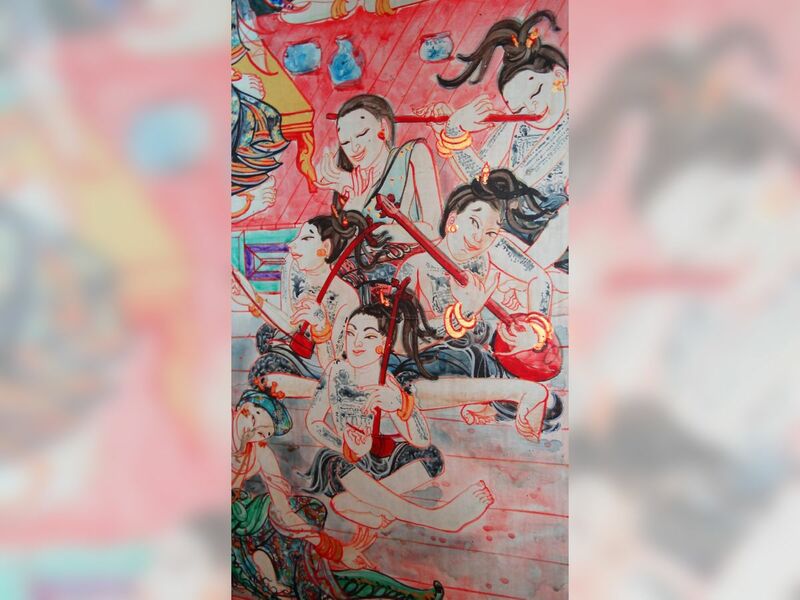 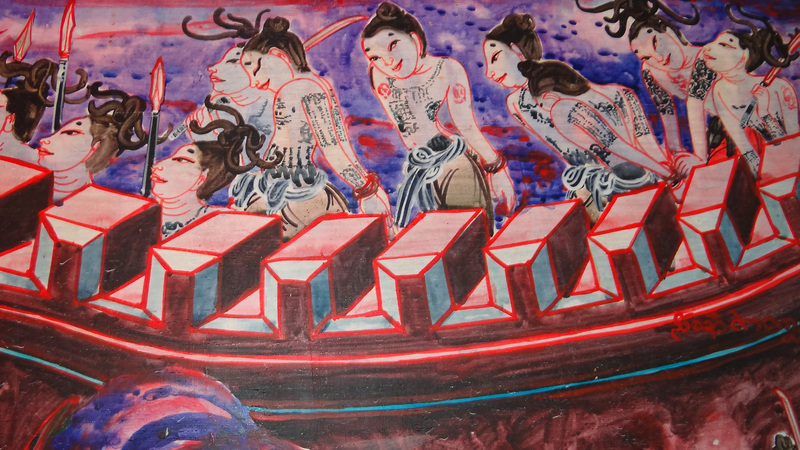 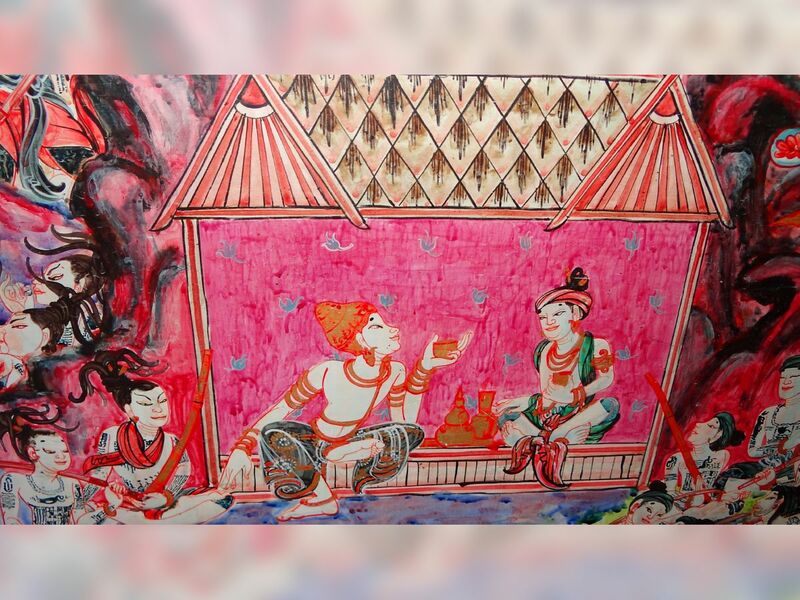 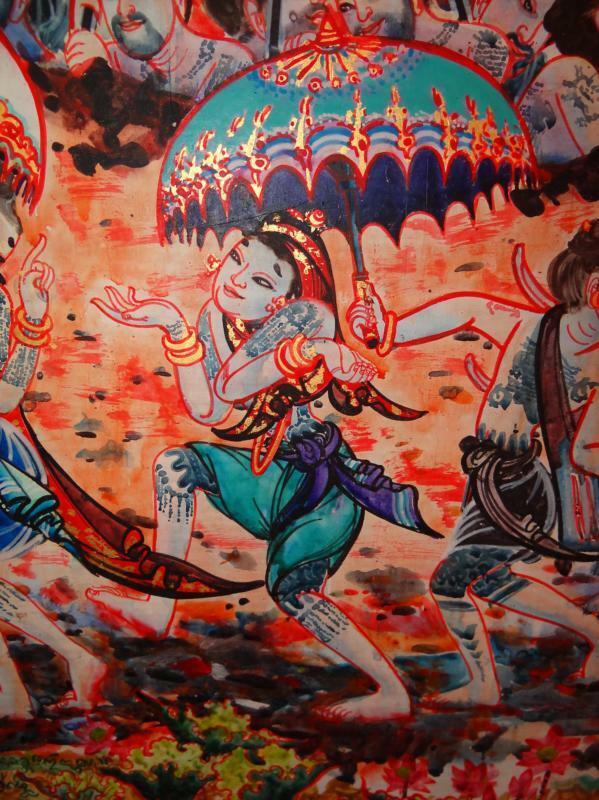 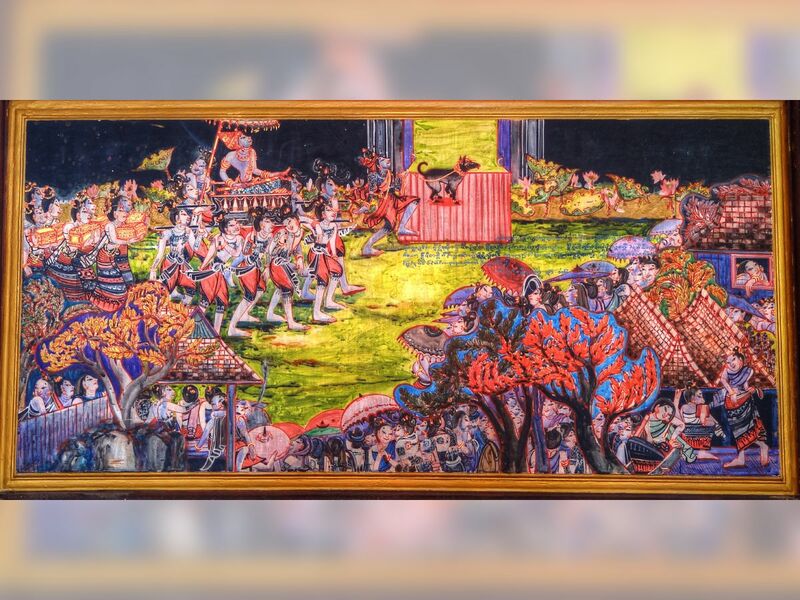 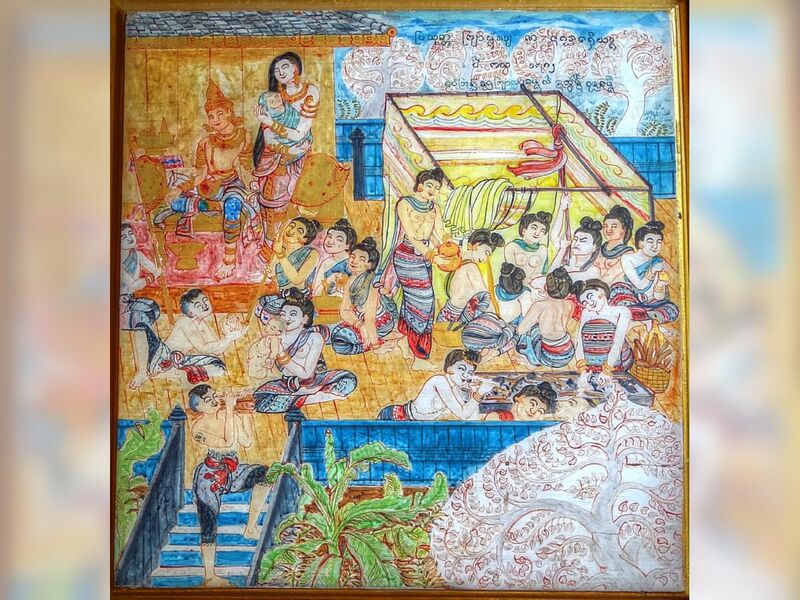 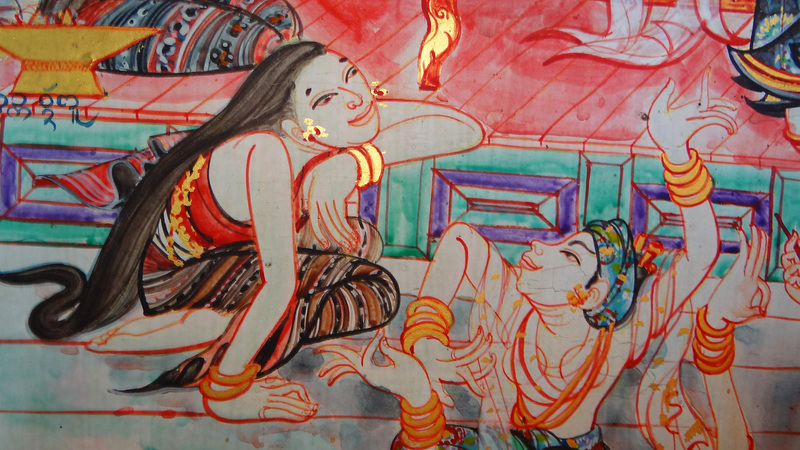 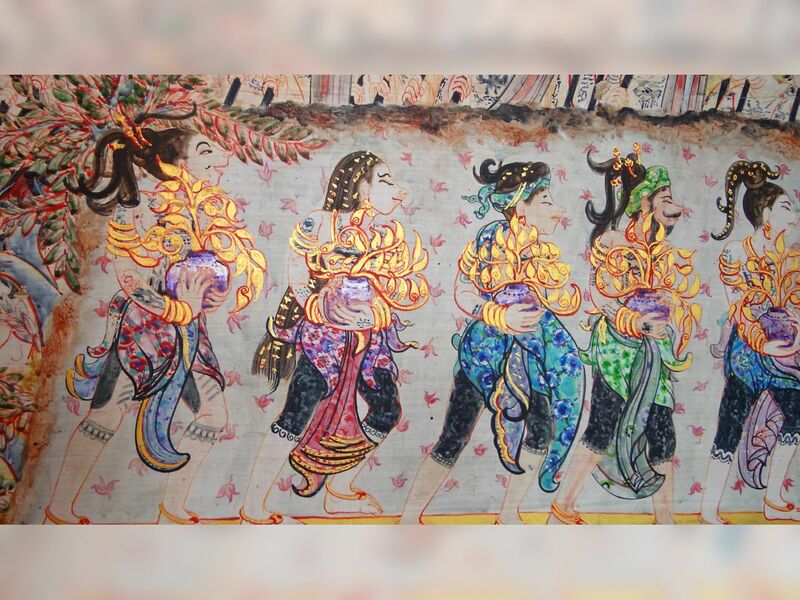 They illustrate the Life of Phra Mangrai, the founder of the Lanna Kingdom, and are fine examples of modern mural painting, full of character and life. 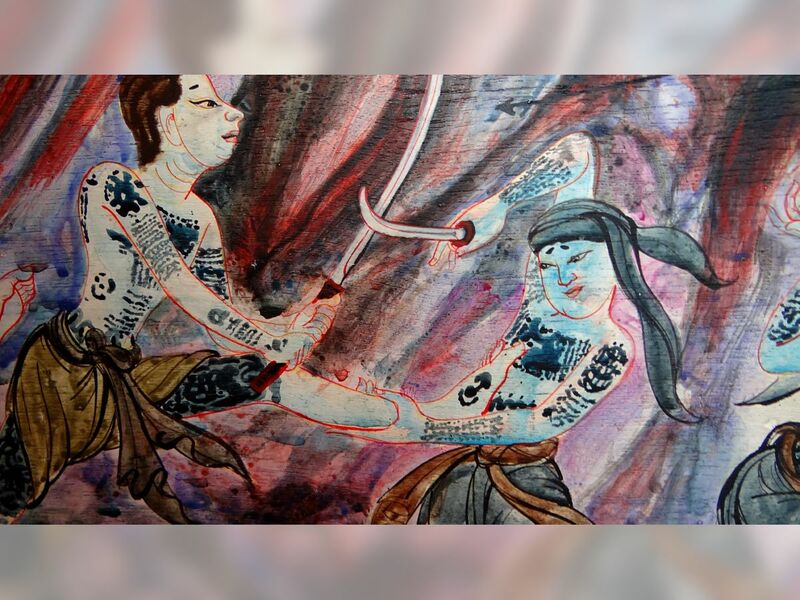 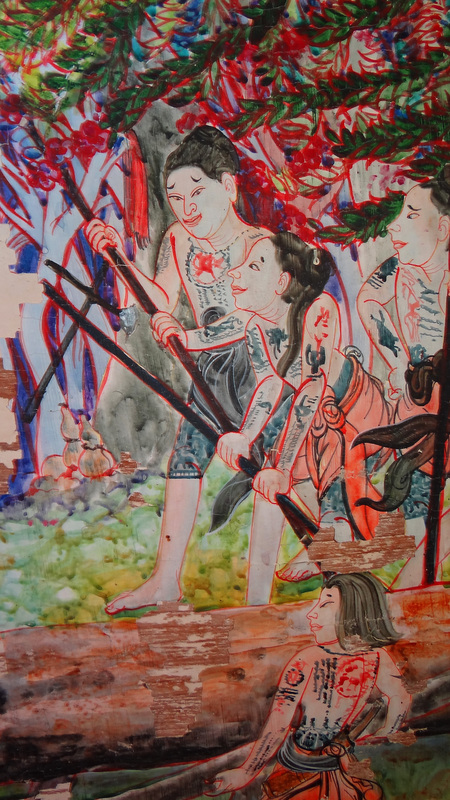 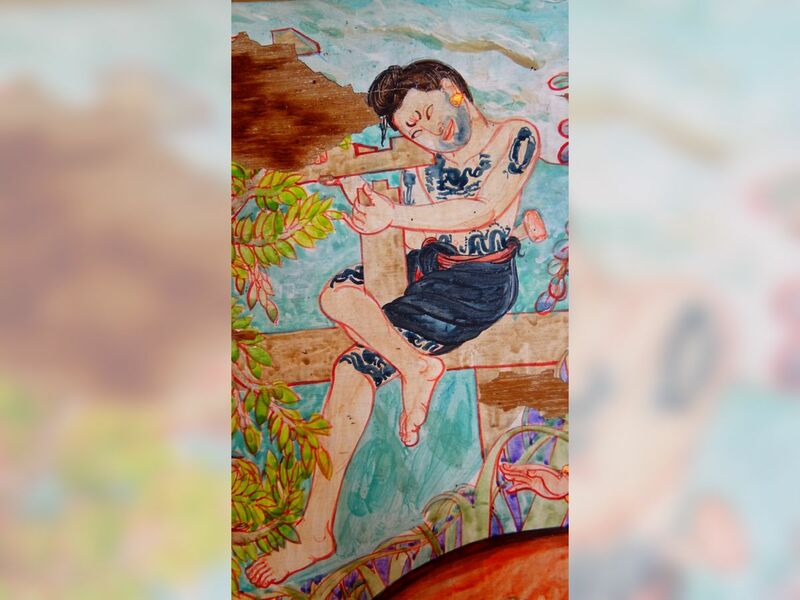 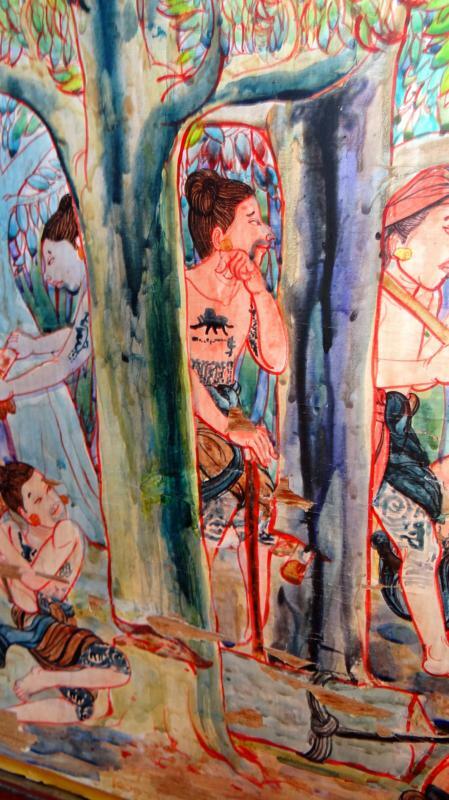 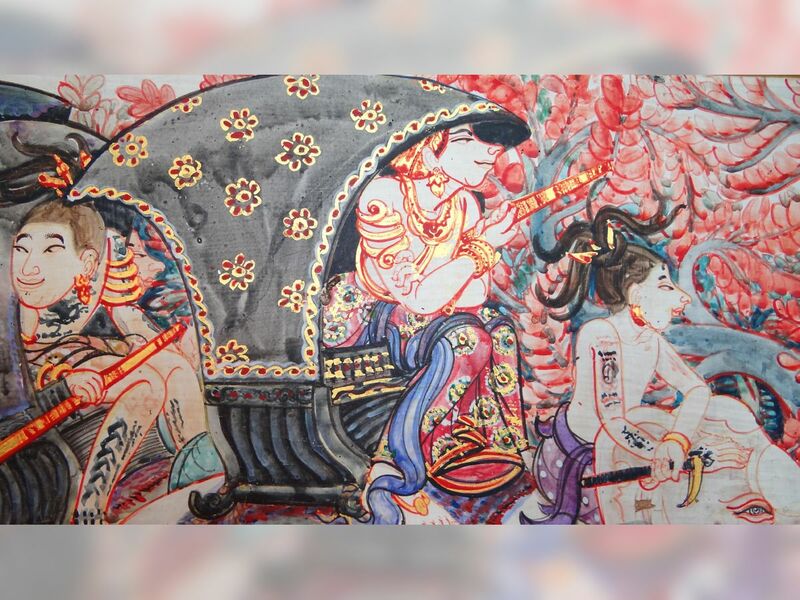 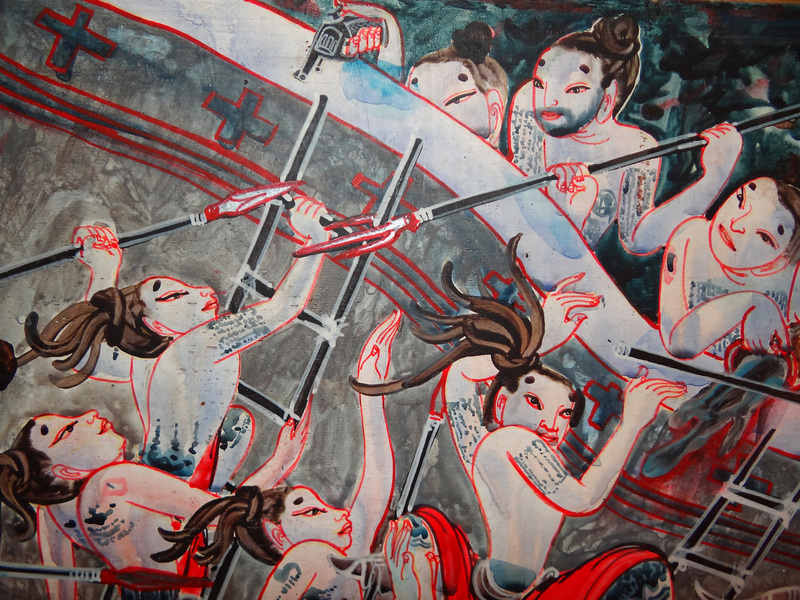 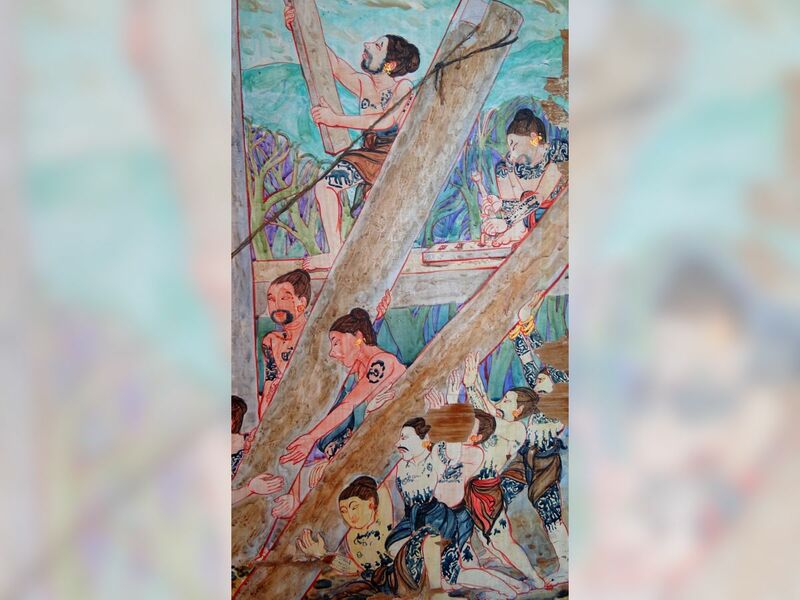 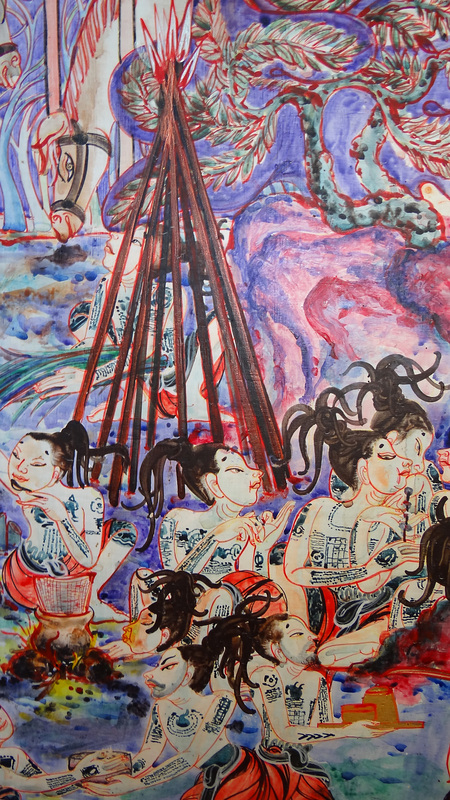 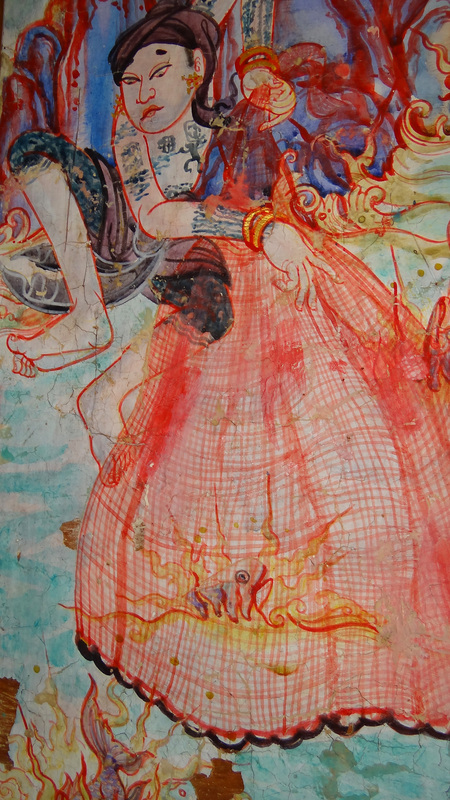 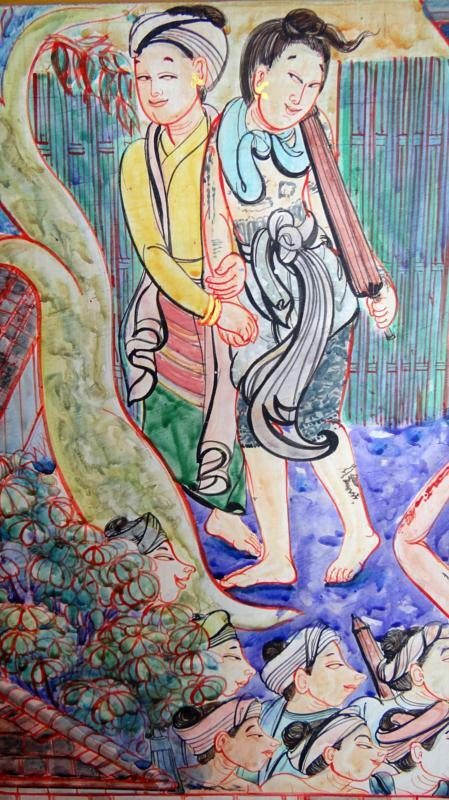 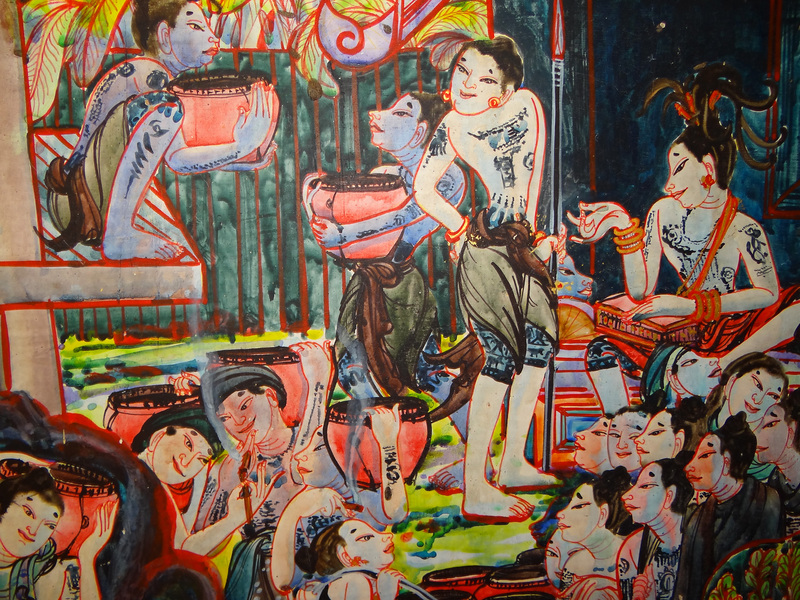 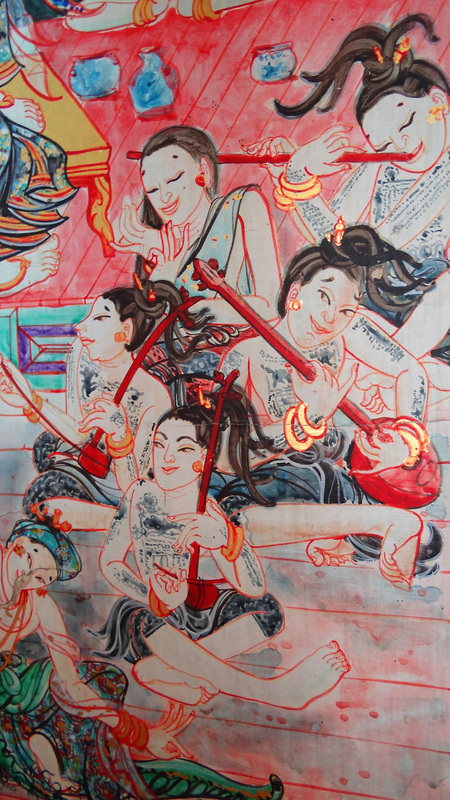 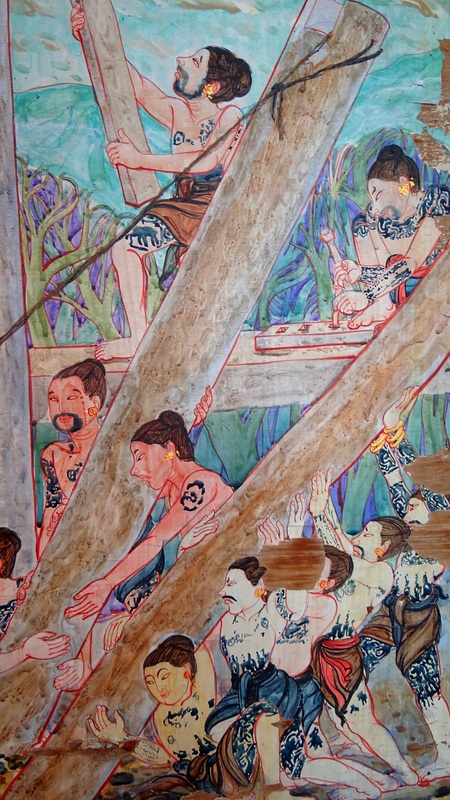 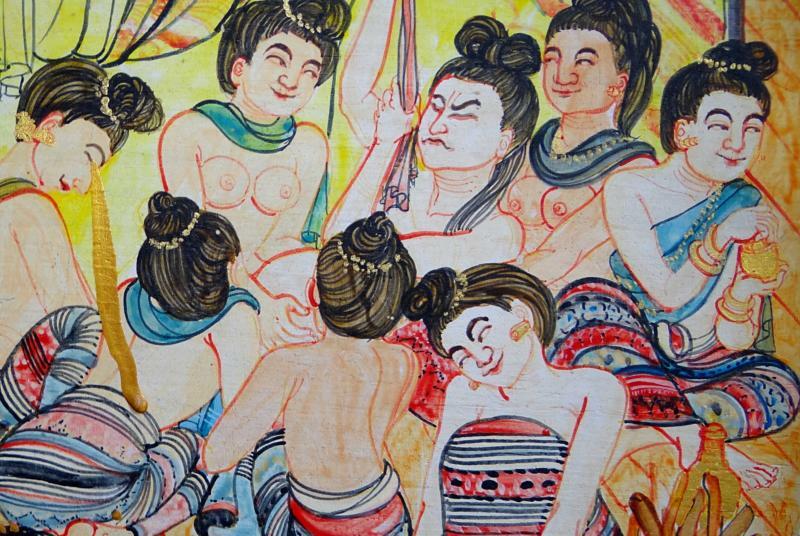 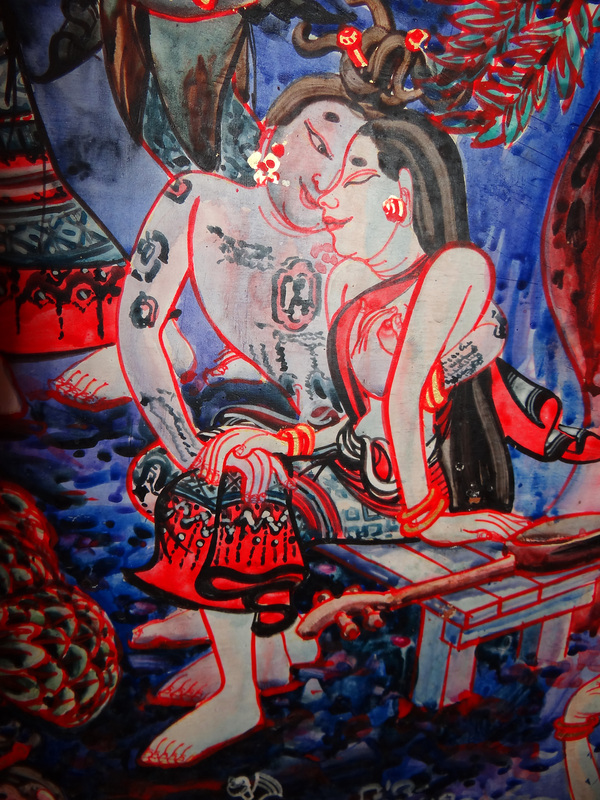 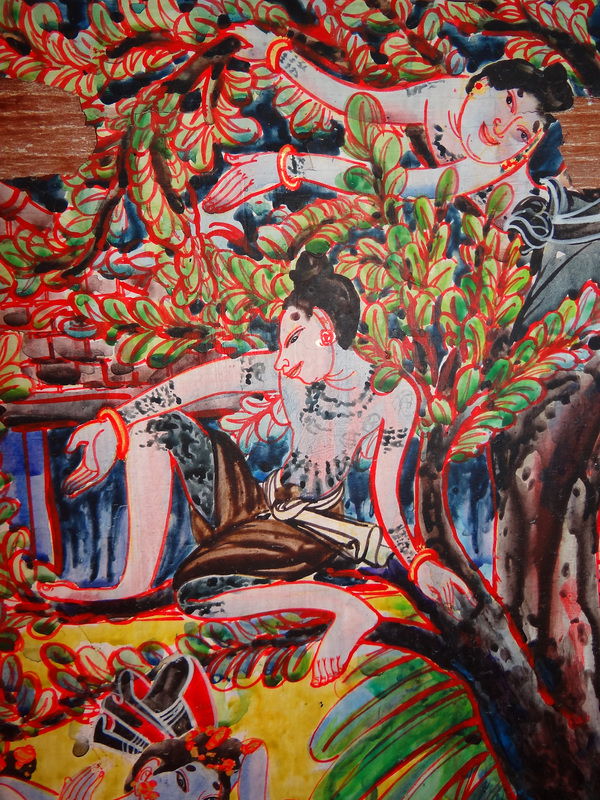 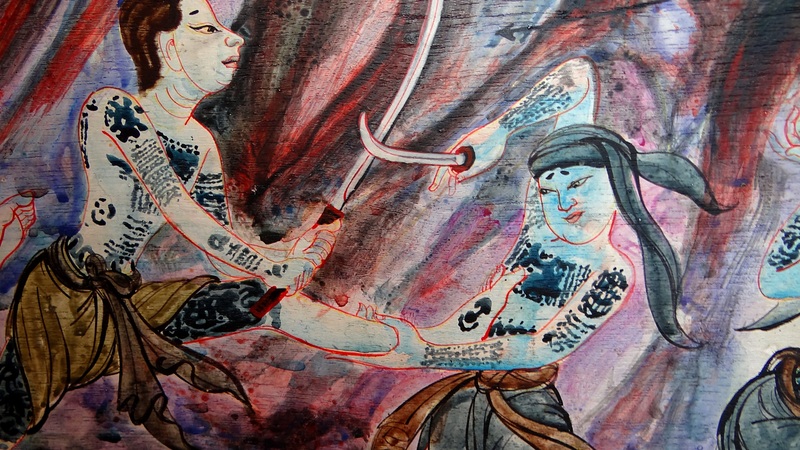 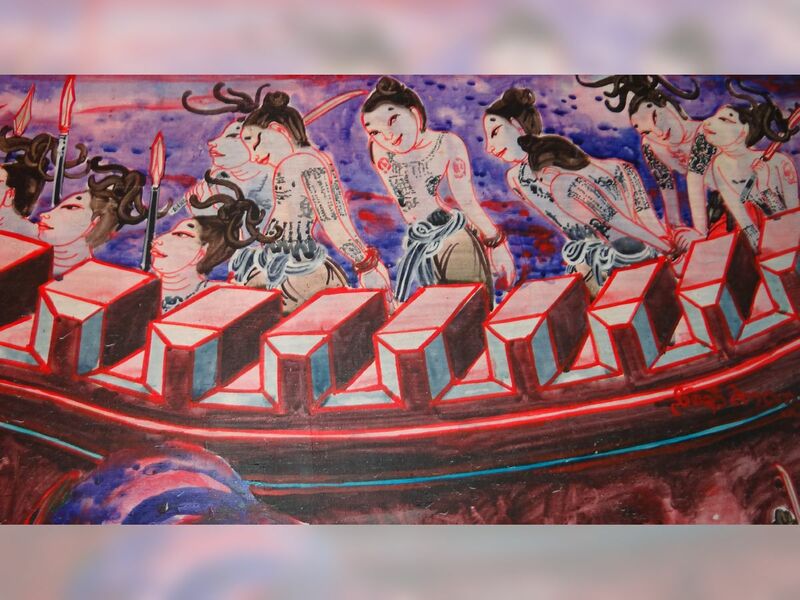 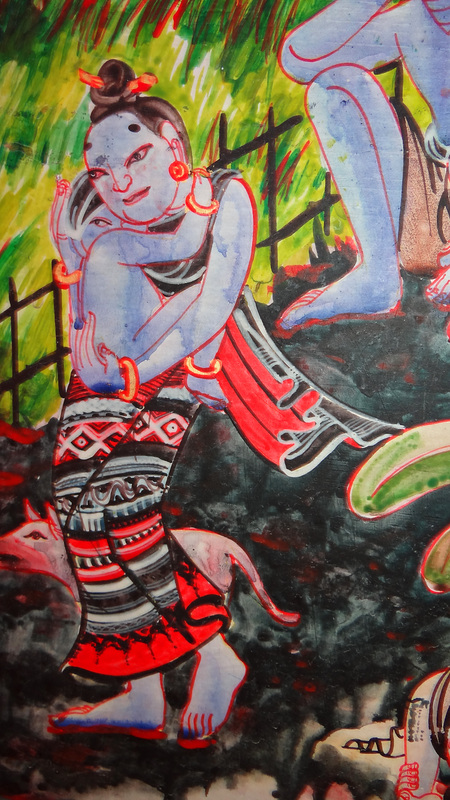 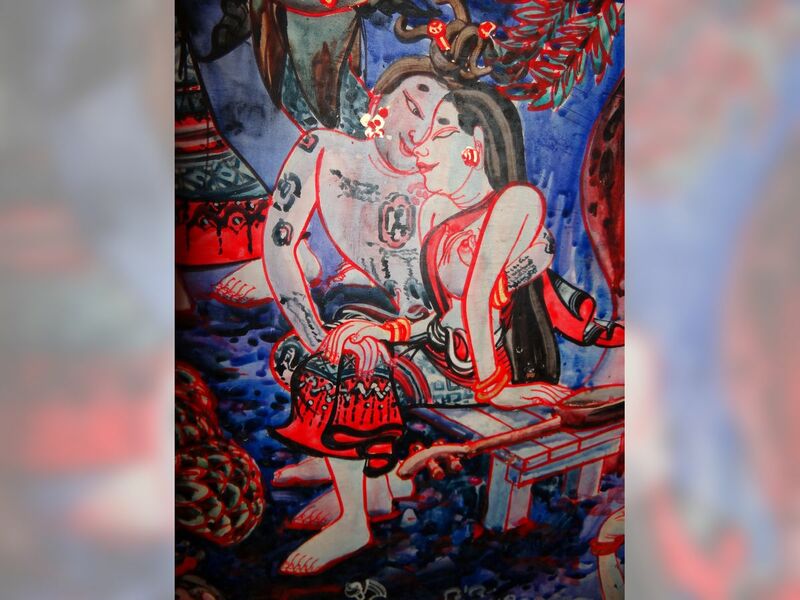 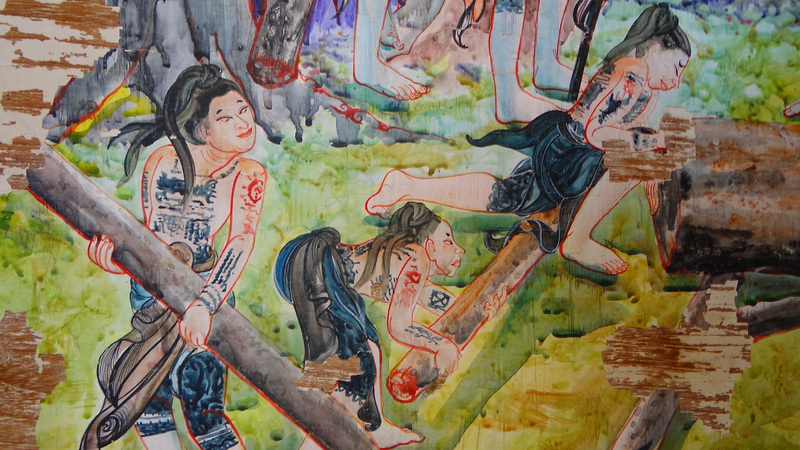 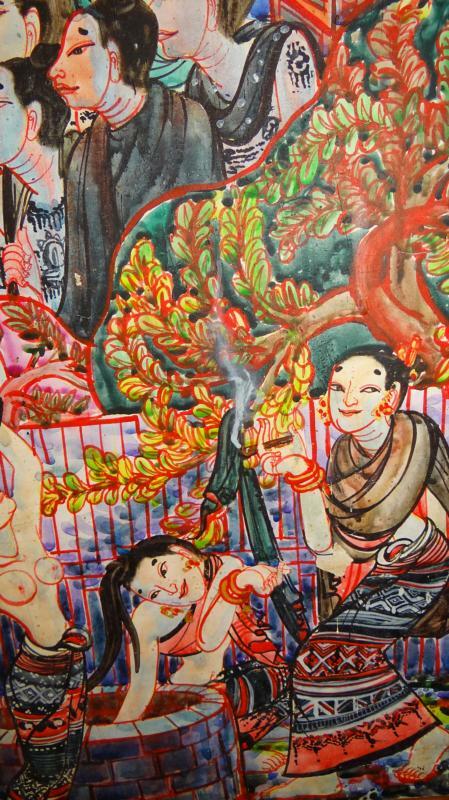 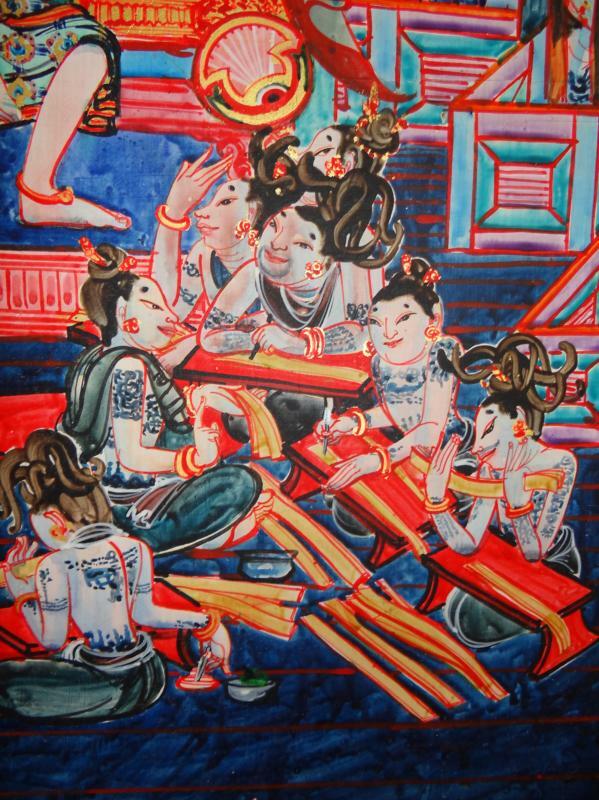 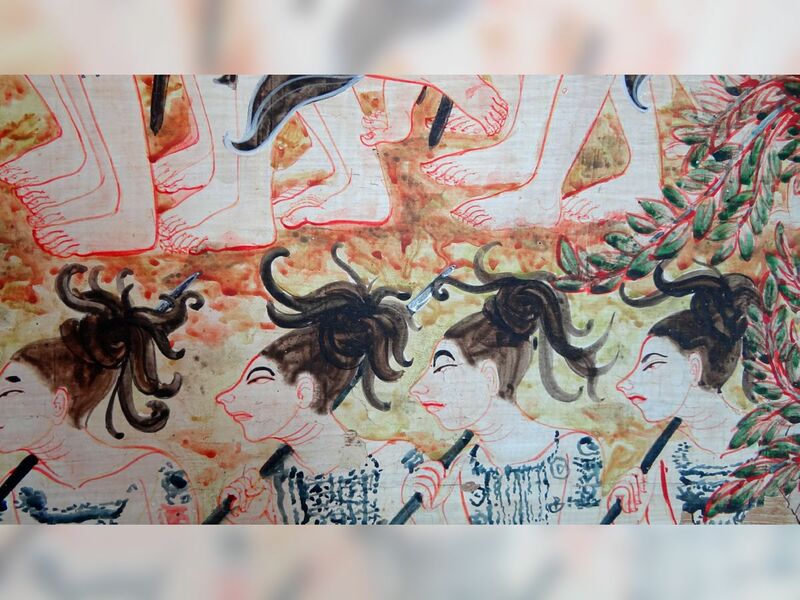 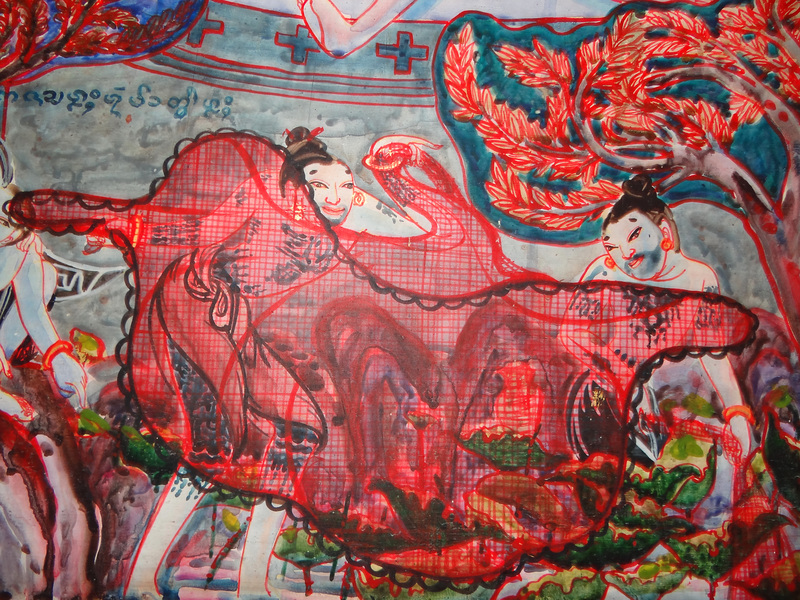 The people in them are very stylised, emphasising the typical Thai Yuan (northern Thai) features, and the bodies are covered with tattoos, as in popular in the north even now. 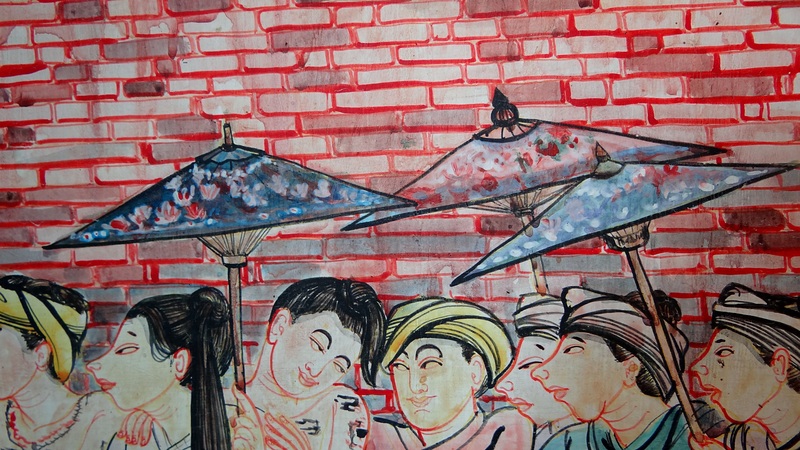 I photographed some of these murals on the last day I was in Fang in July 2011, and after I left I contacted a friend living in the area and asked if he could make better photographs of them for me. I am very grateful to Fred Blandford for taking the time, and for making such very good photographs of the murals. 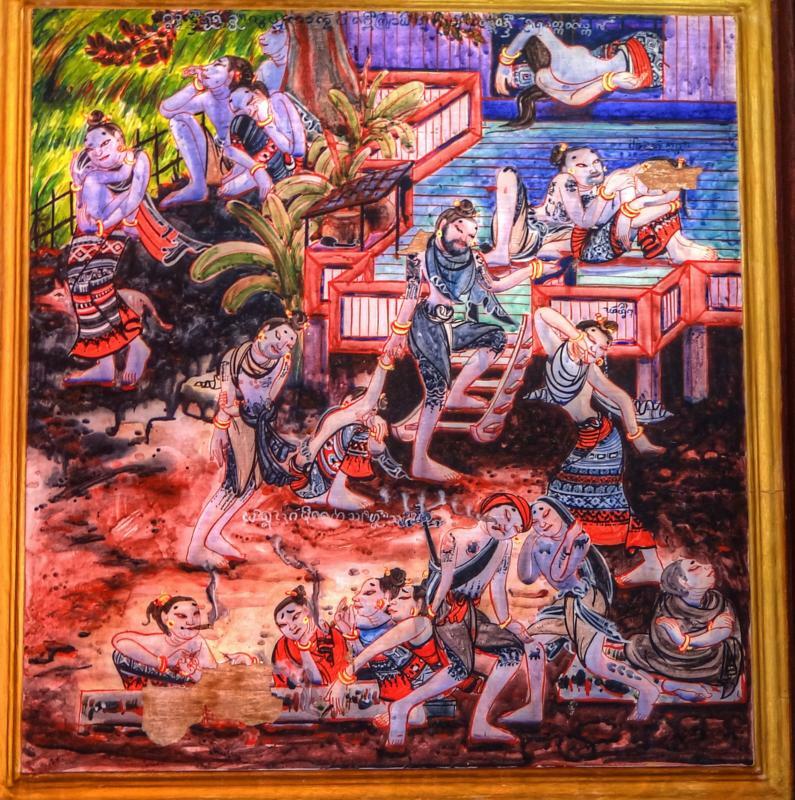 More of his photographs from Wat Chedi Ngam are in the Guests section of the website. Later I asked Mrs. Chanya P. Depaul, who had been very kindly helping me with my work in Chiang Mai, if she knew anyone who could translate the writing on the murals, which is in old Lanna script. 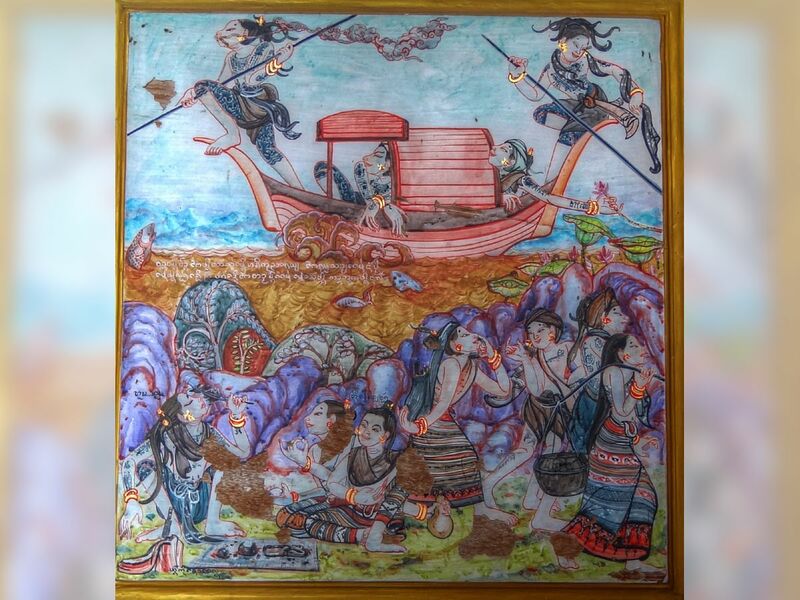 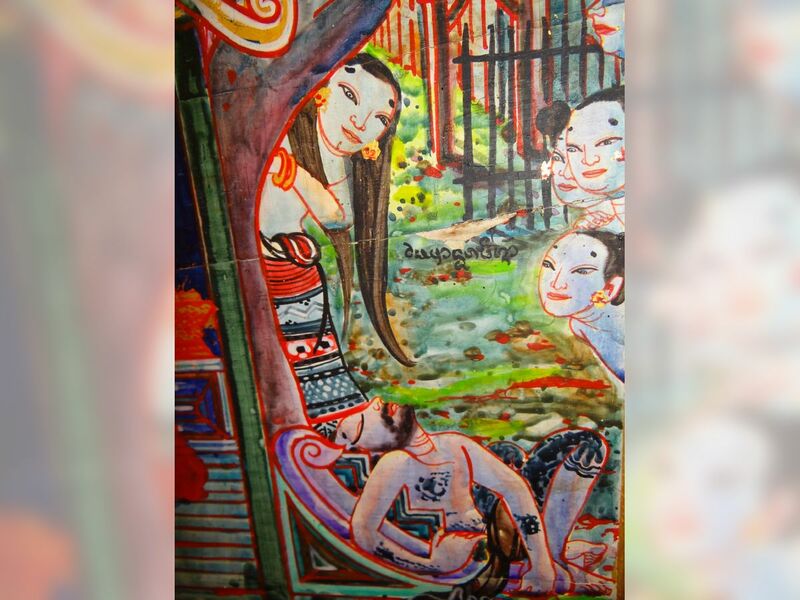 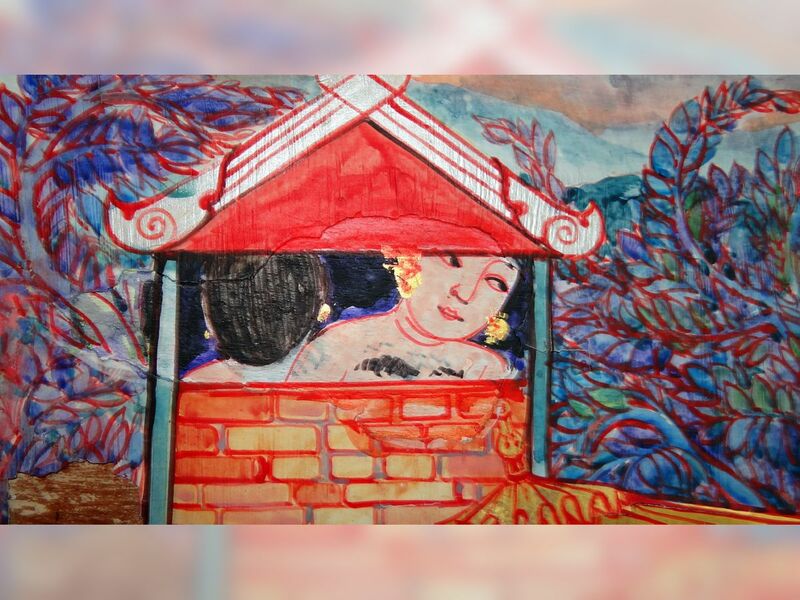 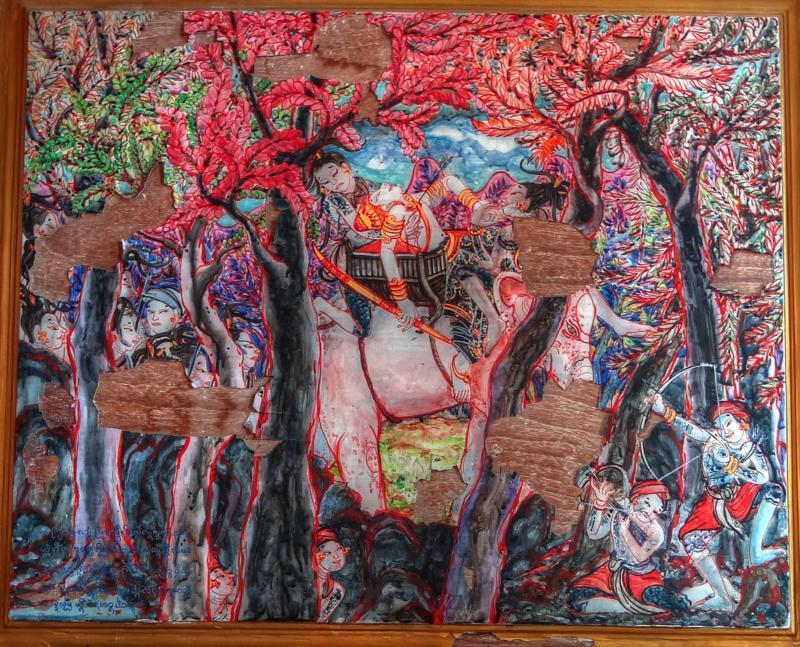 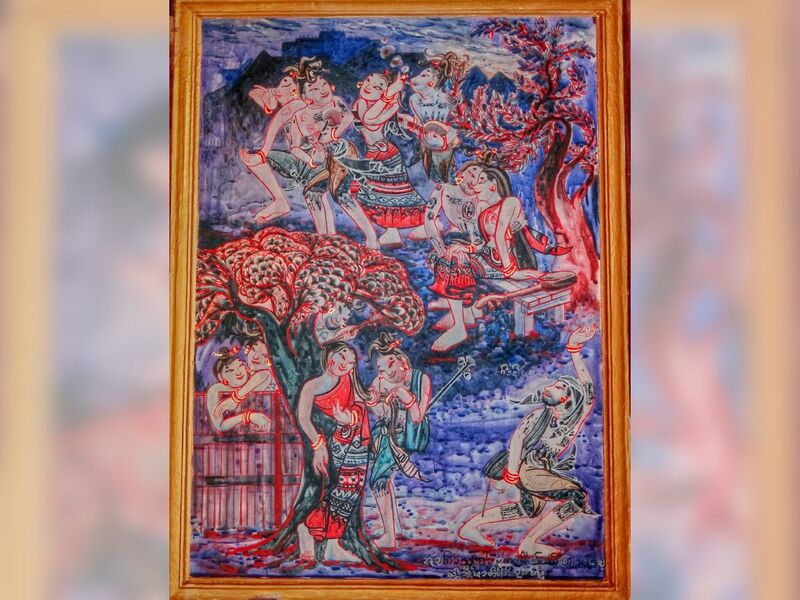 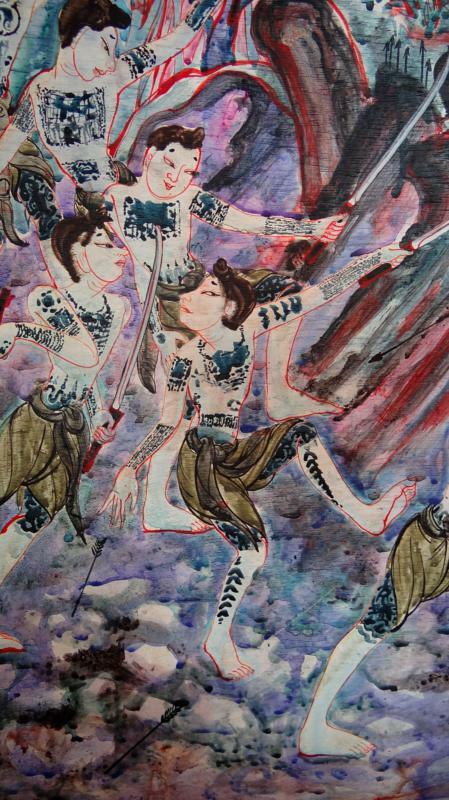 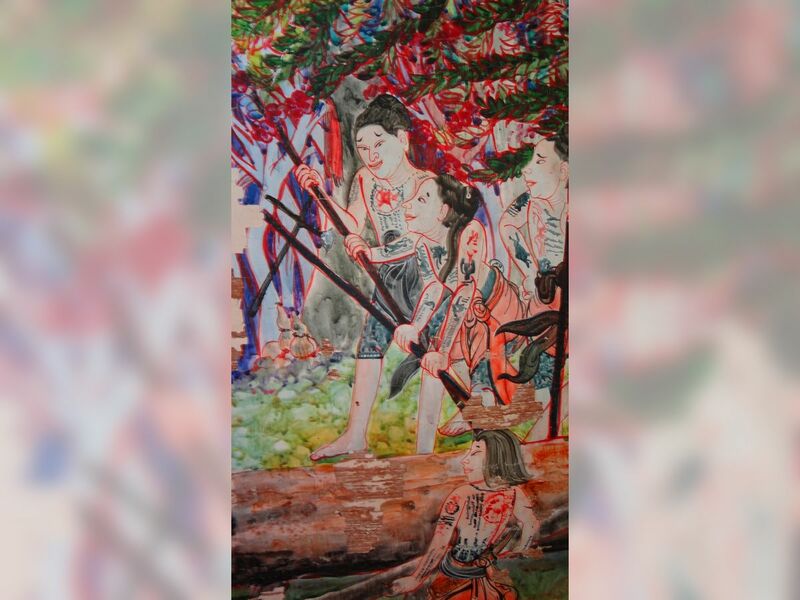 She contacted an artist friend, Phongphan Ruannanchai, who worked with Ajahn Jampong Tangtrakul, first translating them into modern Lanna, then Thai, then English, which I abbreviated and sometimes corrected working from various histories of the kingdom. 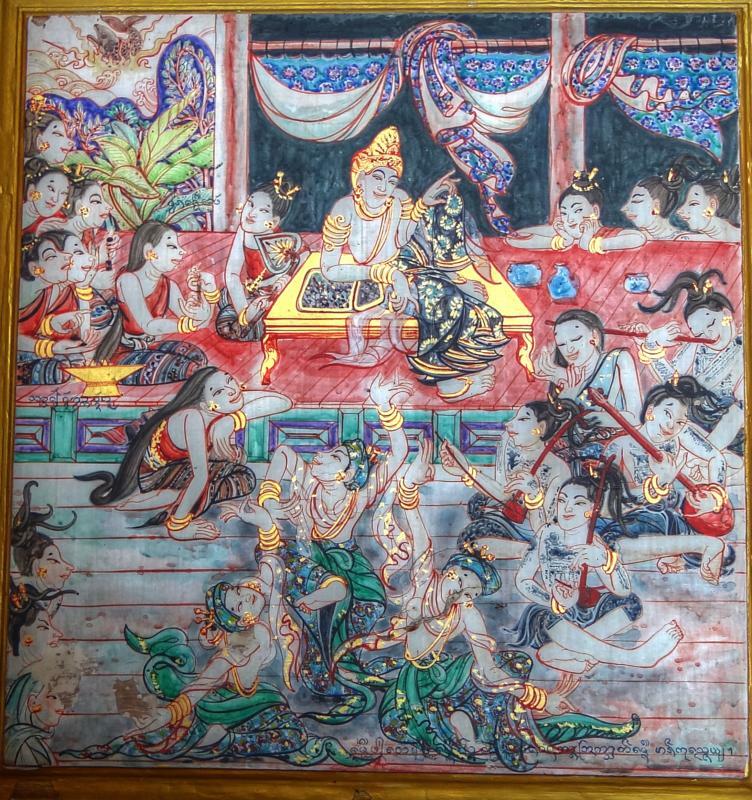 King Mangrai, the 25th ruler of the Lao Dynasty was the son of Phra Lao Mang of Ngoen Yang and Nang Thep Kham Khayai (Uoe Ming Jam Muang), who was the daughter of the Tai Leu ruler of Chiang Rung. 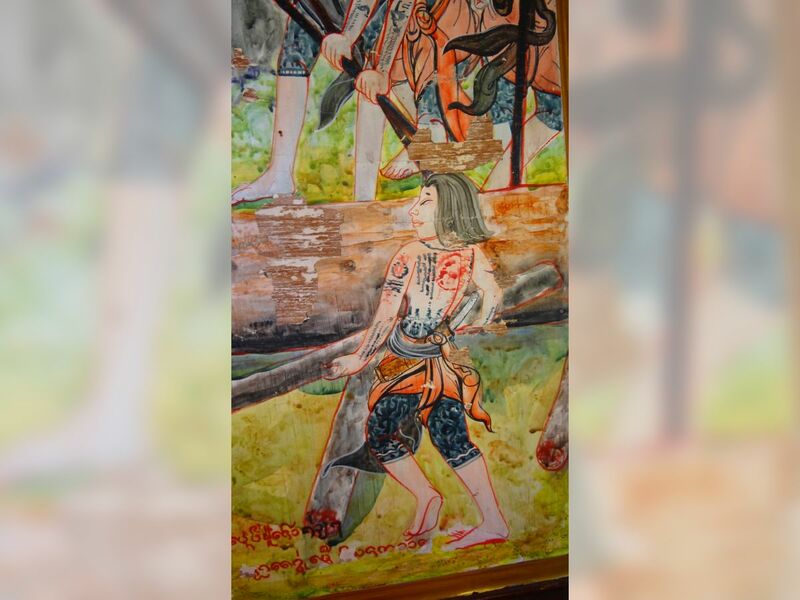 A charismatic leader, he ascended to the throne of Ngoen Yang in 1261 determined to reunite the divided cities and prevent further suffering from the constant fighting along the border. 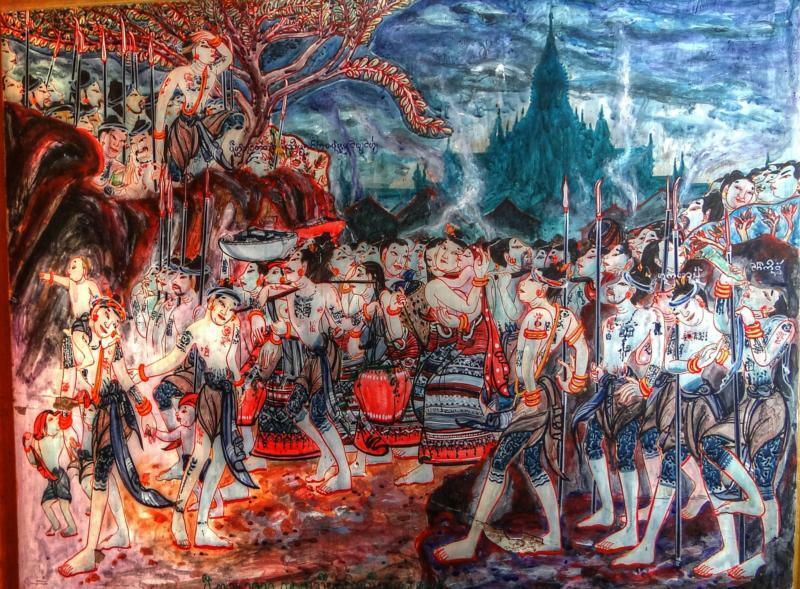 King Mangrai decided to subdue the smaller city states by calling all the leaders to come and pay homage to Ngoen Yang Chiang Saen. 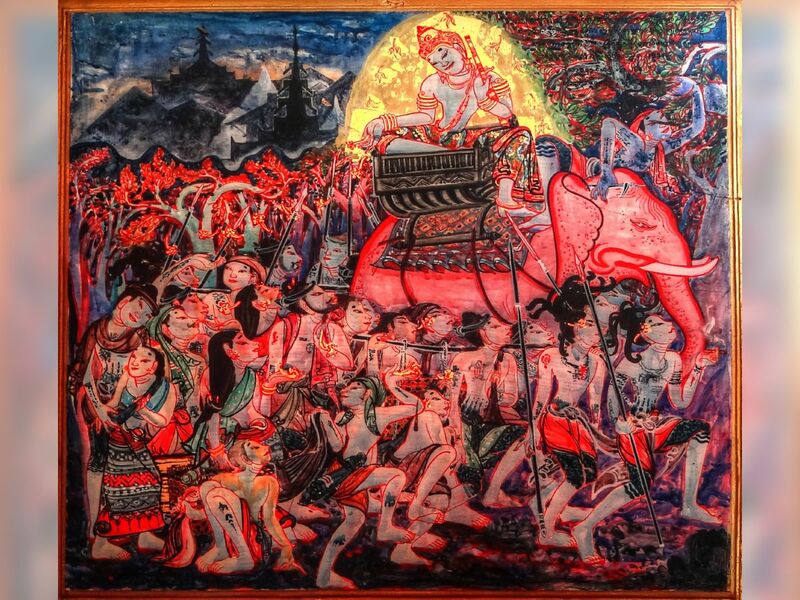 King Mangrai subjugated any city that refused. 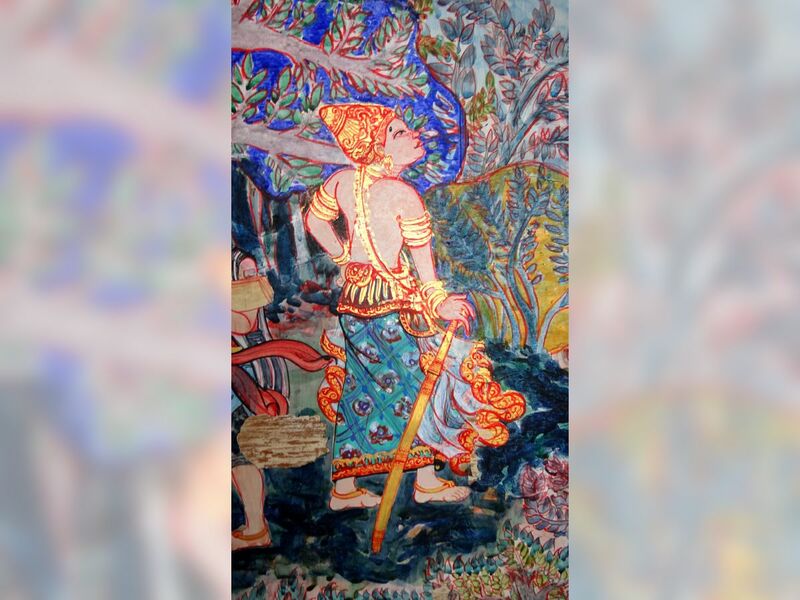 Once he had successfully brought all the cities in the Kok River basin under his power, he declared it a dominion which he called Khwaen Yon or Yonok. From there he extended his power to the west and to the south. He decided to move the capital from Ngoen Yang Chiang Saen and established it in the city of Chiang Rai in 1262. Six years later he captured Chiang Khong. 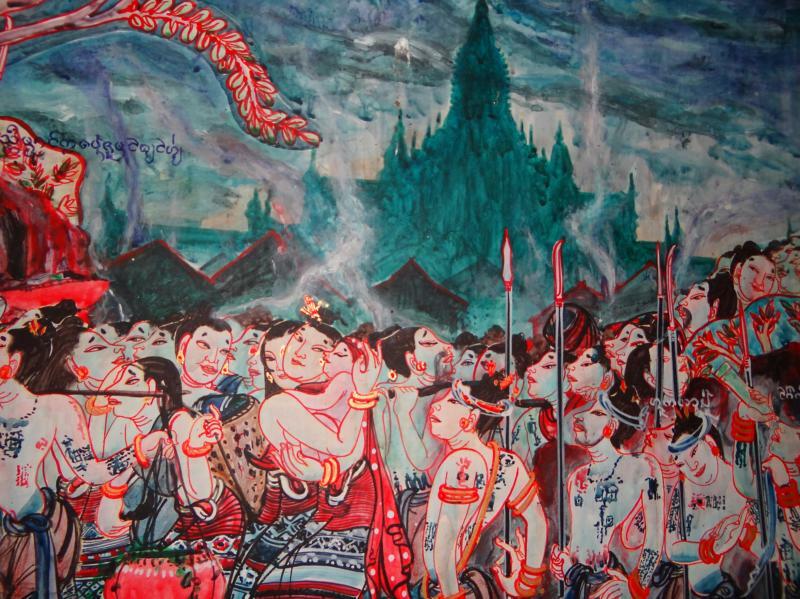 In 1272 he moved his capital to Fang to seek a place more suited to the expansion of his kingdom. 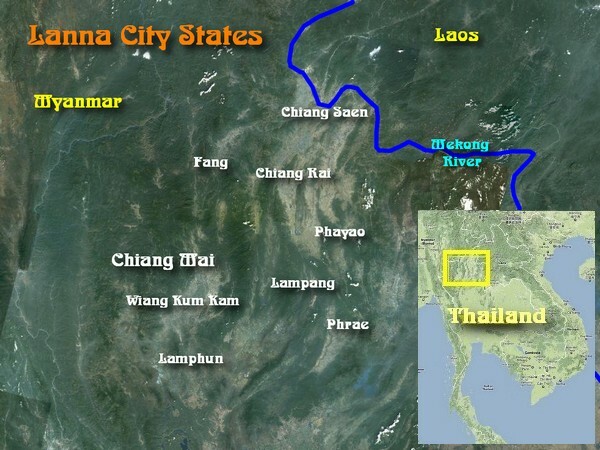 King Mangrai's next move was to come when he learned that the Mon had extended their power throughout the Ping River basin. 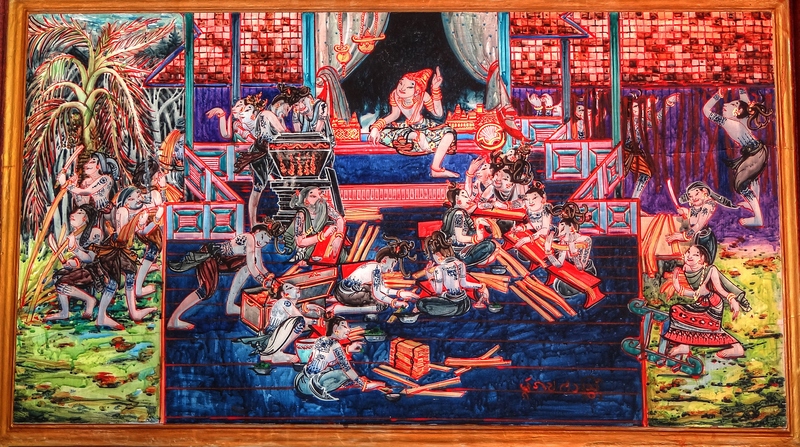 The Mon cities of Nakhon Haripunchai and Nakhon Khe Lang under King Yi Ba and his younger brother King Boekl, served as the centres of administration. 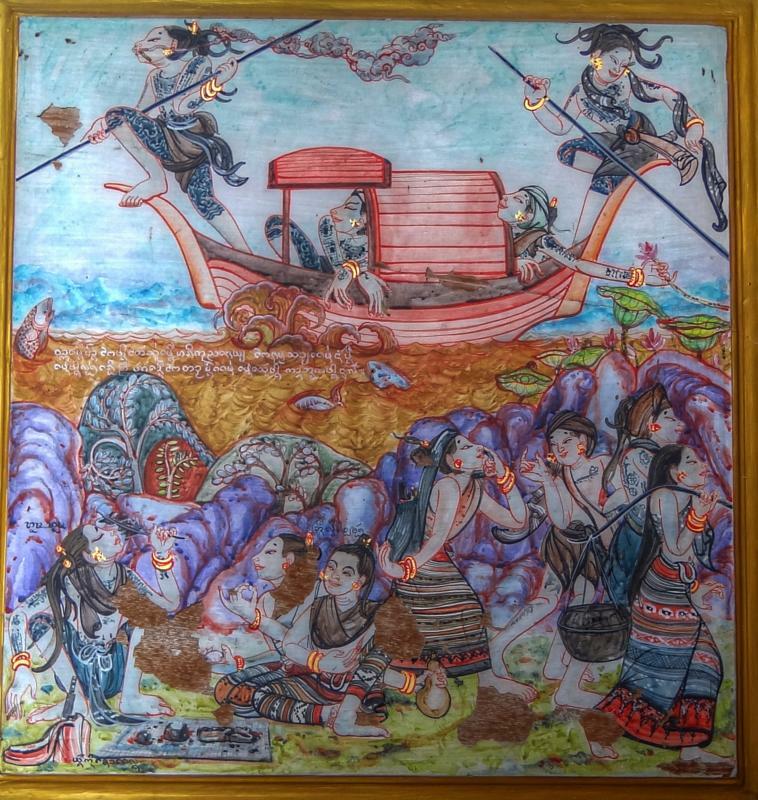 A merchant who had come to trade in Muang Fang also informed King Mangrai that Haripunchai was a prosperous trading city that served as a major centre by river and by land. 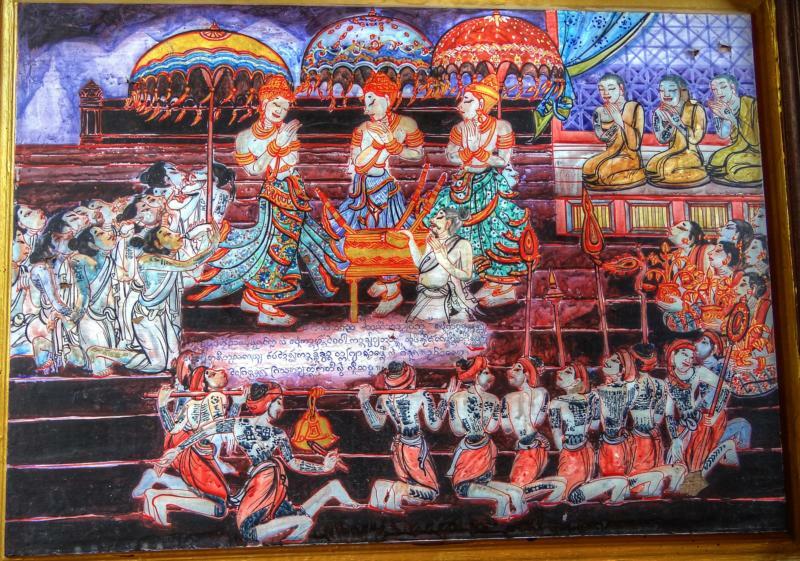 Inspired by the prospects of greater power, King Mangrai desired to include these cities in his own domain. 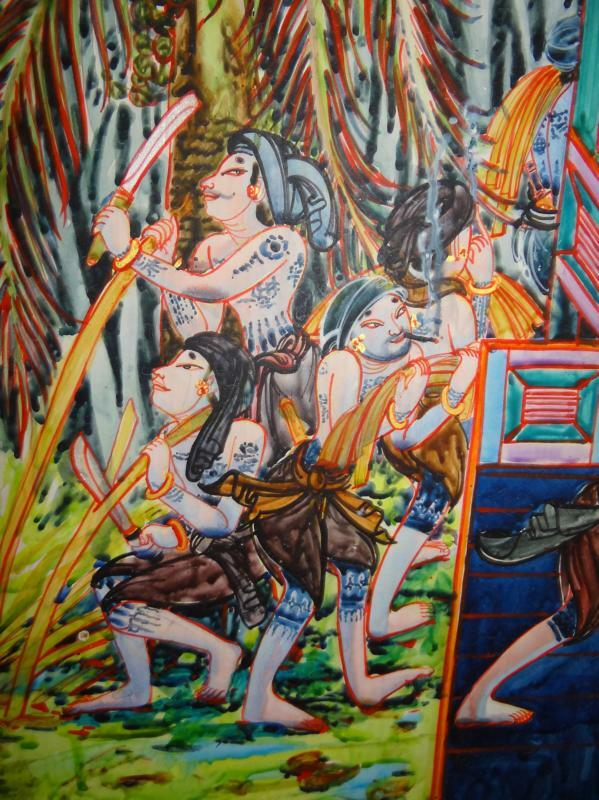 However, the Mon had long been in the region and were well equipped with manpower and weapons. By comparison, King Mangrai had only just started to establish his kingdom and did not have the military might required. 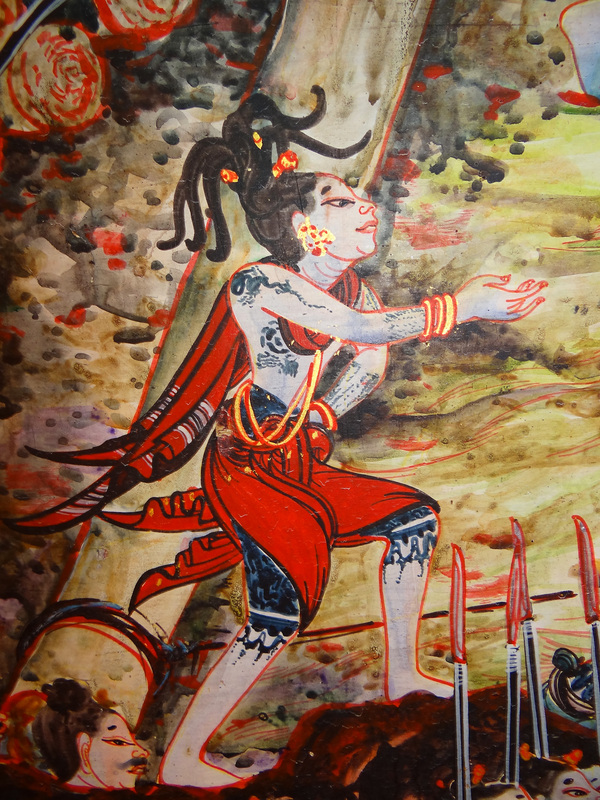 How could he be victorious? 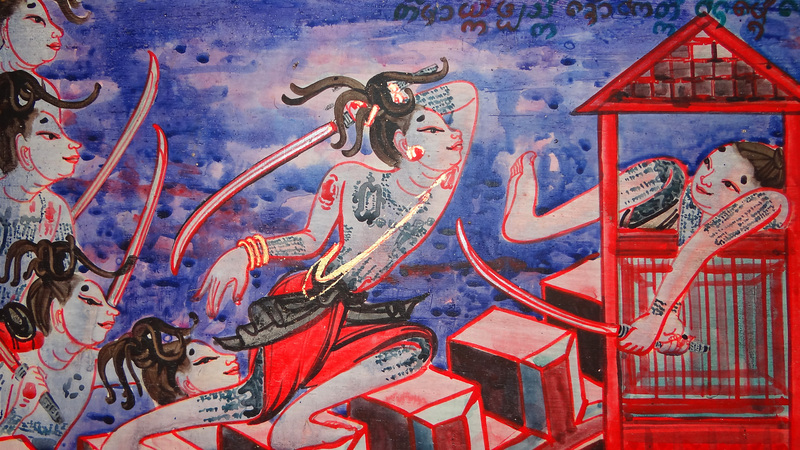 King Mangrai realised that the use of force would result in his own defeat unless he could undermine the strength of the city. Thus he decided to send the merchant Ai Fa to cause unrest and sow the seeds of destruction in the relationship between King Yi Ba and his subjects. 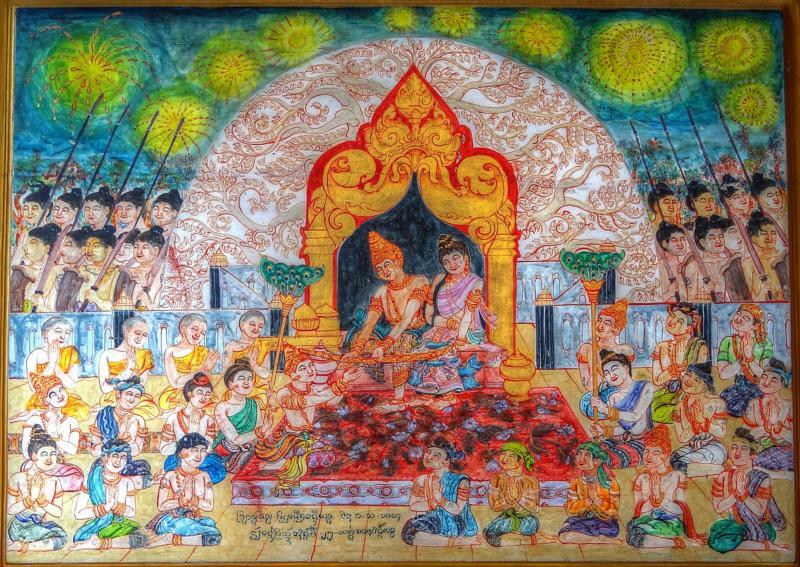 King Mangrai's plan called for the pretence of punishment by whipping Ai Fa and confiscating his wife and children and all his possessions. Then by expelling him from the city, Ai Fa Would go to seek refuge with King Yi Ba of Haripunchai. 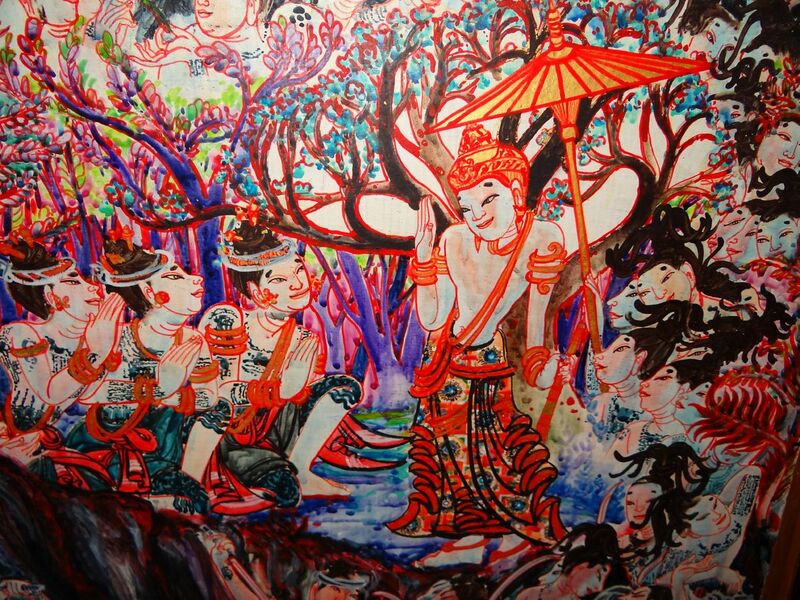 There he would seek to win the confidence of the King and his subjects. 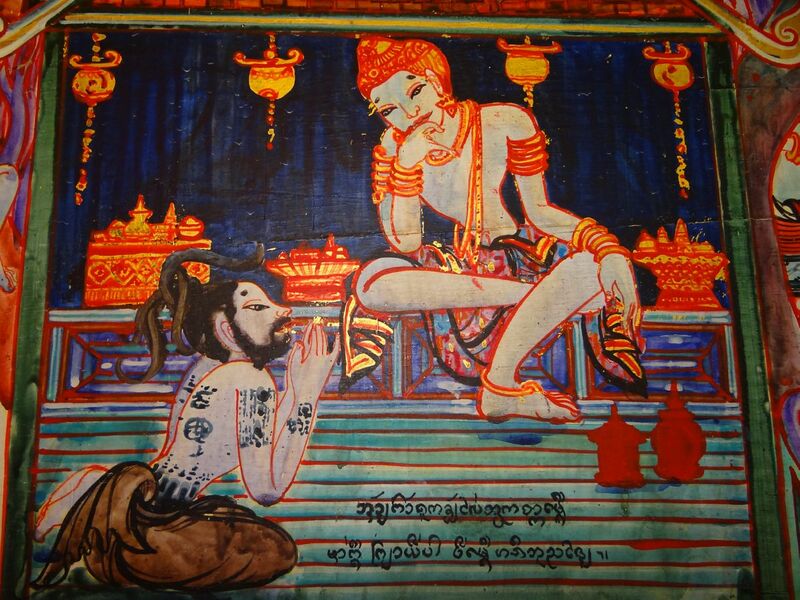 King Yi Ba would then give him the power to make decisions and collect taxes for the royal treasury. 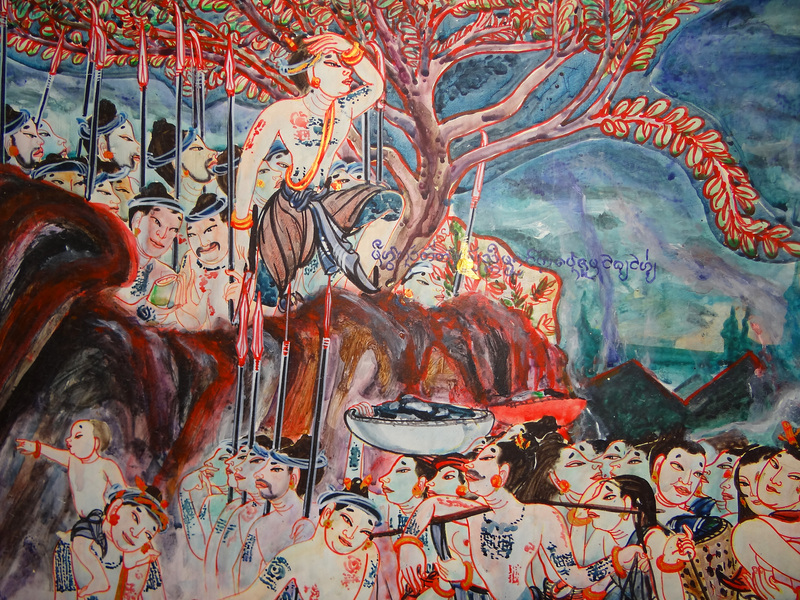 Ai Fa succeeded well in his mission, creating discontent among the people by collecting taxes at an unusually high rate. 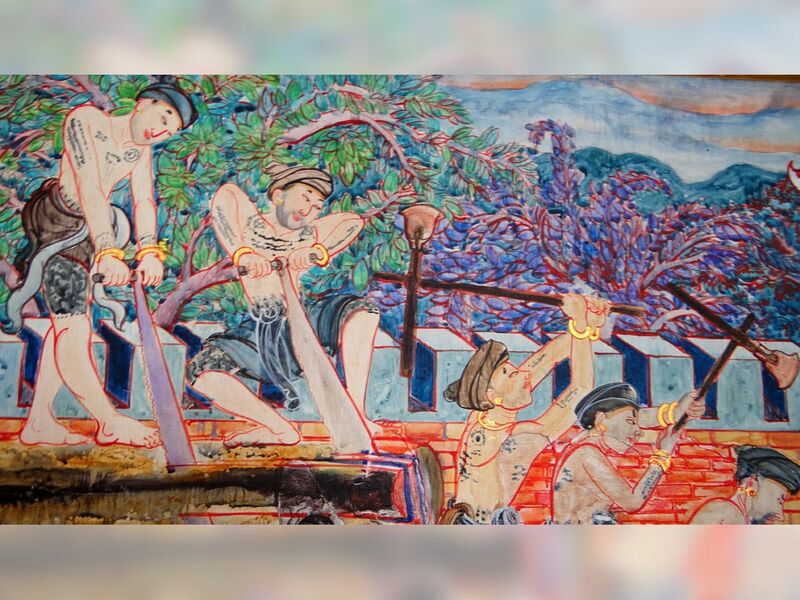 He conscripted the people to dig irrigation canals and build dams within short periods of time during the dry season when the earth was dry and hard. 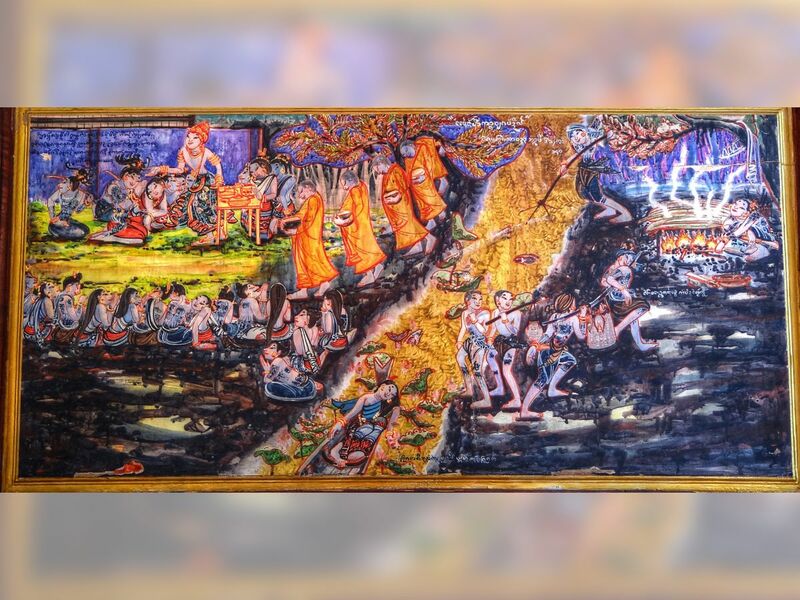 These canals were later to become known as muang khaeng (hard canals), and traces of them can be seen to this day. Ai Fa further conscripted labourers to fell trees in the forest and drag the logs across fields where the rice was maturing in order to build a palace for King Yi Ba. 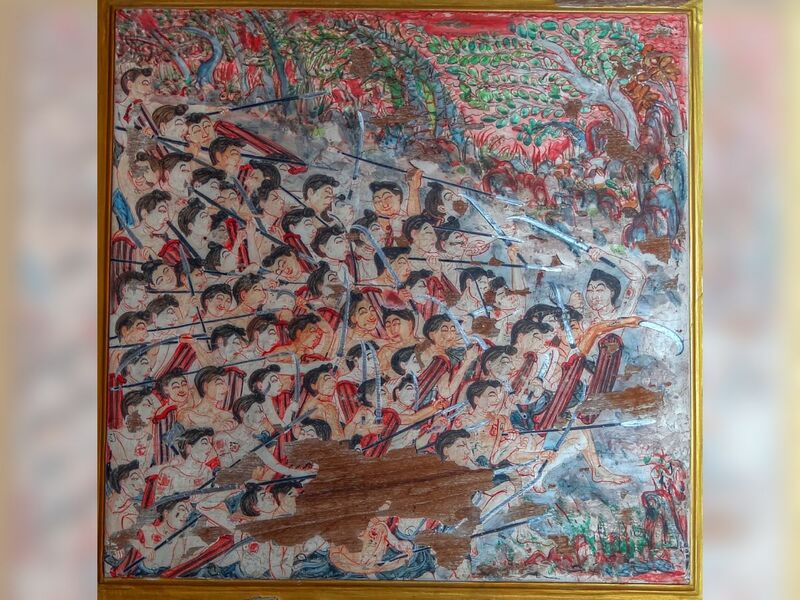 He blamed King Yi Ba for his orders, and so the people became enraged and wanted to take revenge against King Yi Ba. 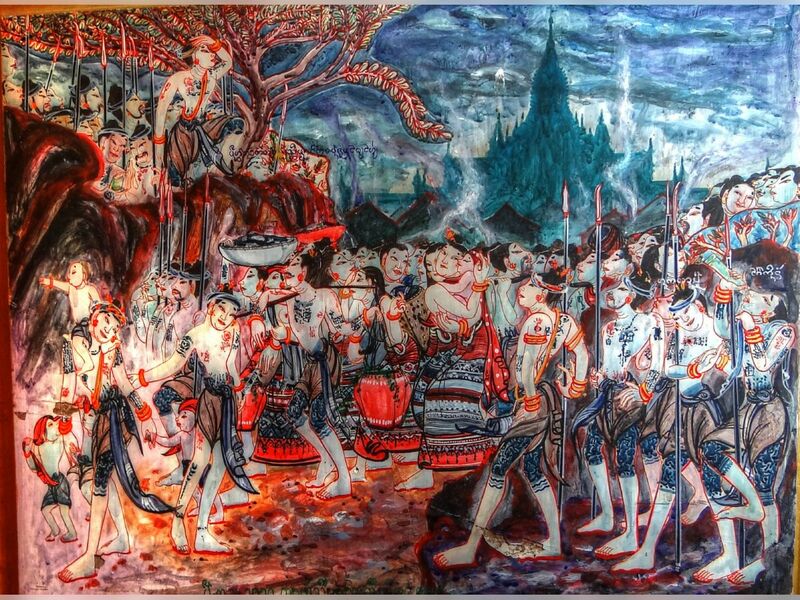 When discontent filled the city, Ai Fa saw the opportunity to extol King Mangrai and make the people want King Mangrai come and rule. 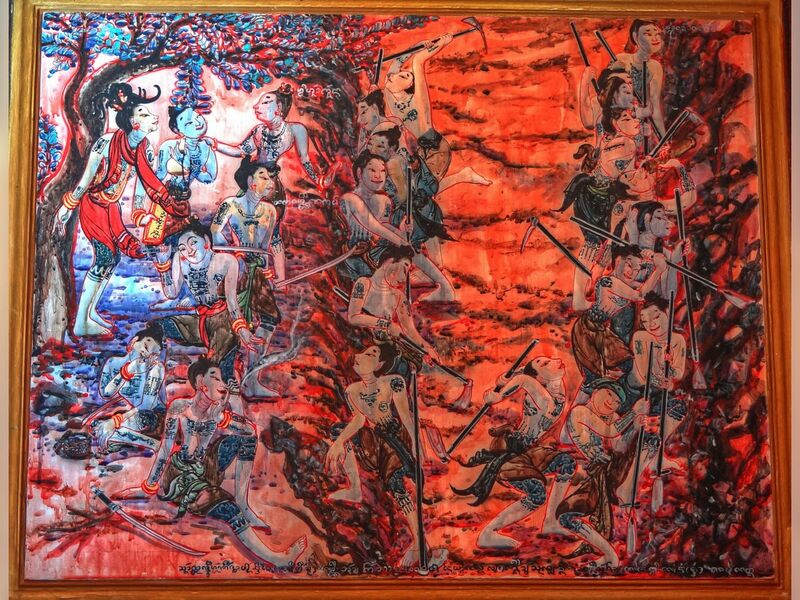 Ai Fa quickly sent a message to King Mangrai who mobilised his forces and, in 1283, they easily conquered Haripunchai. 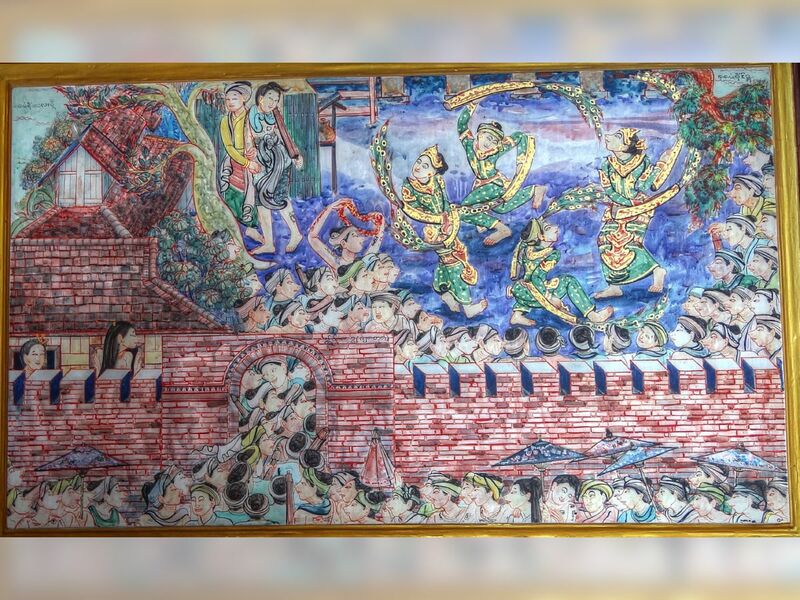 Ai Fa had taken seven years to bring down the city of Haripunchai, which had survived previously for 618 years. 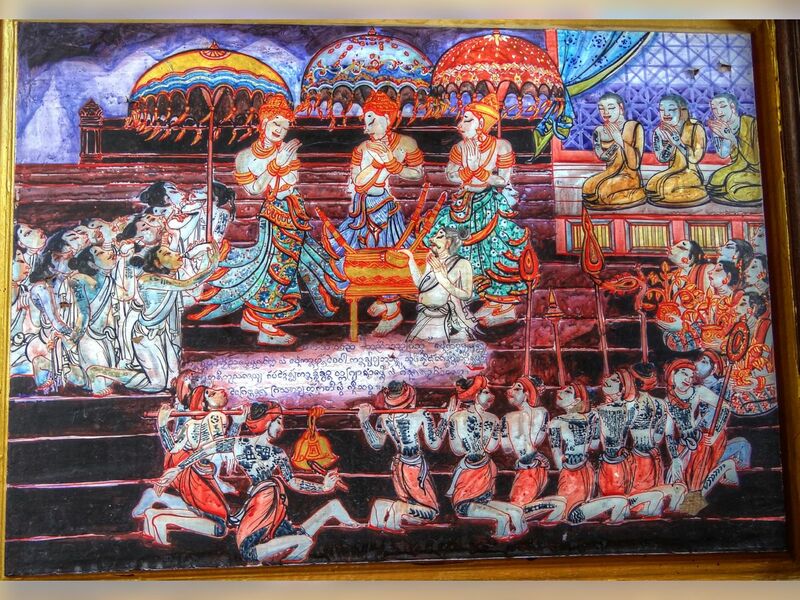 After seizing control of Haripunchai, King Mangrai resided there for three years before handing it over to Ai Fa to control. 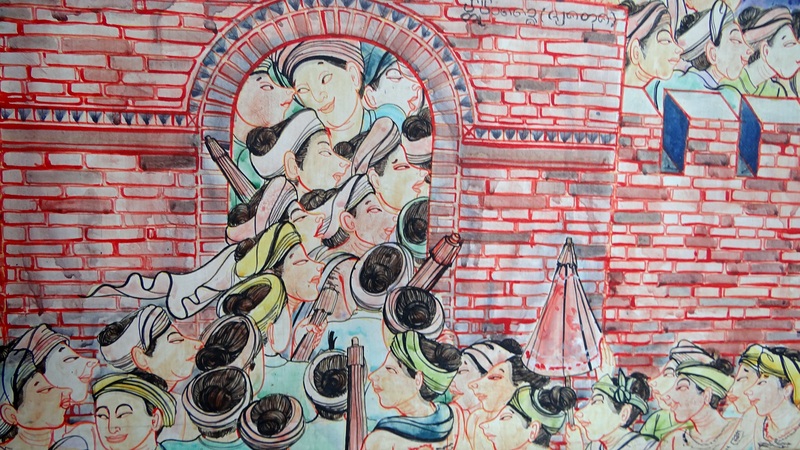 Haripunchai was too small a city with little oppoortunity for territorial expansion, and therefore it was not suited to serve as his new administrative capital. 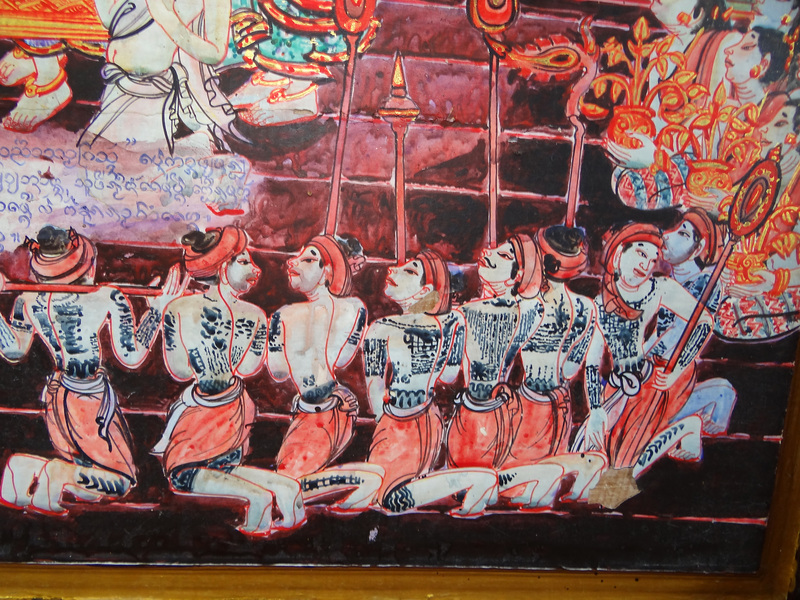 As an ancient, prosperous city with many the temples of great renown, it would serve better as a religious centre. 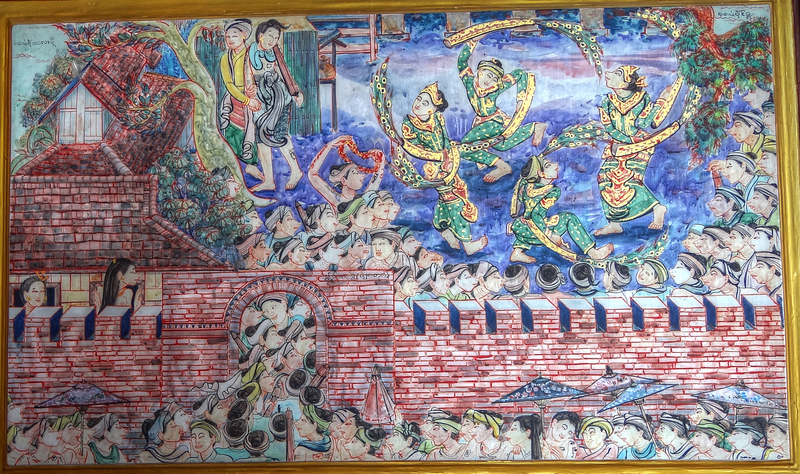 After presenting the city to Ai Fa, King Mangrai first established his new capital, Muang Cha Wae, to the northeast of the old city. 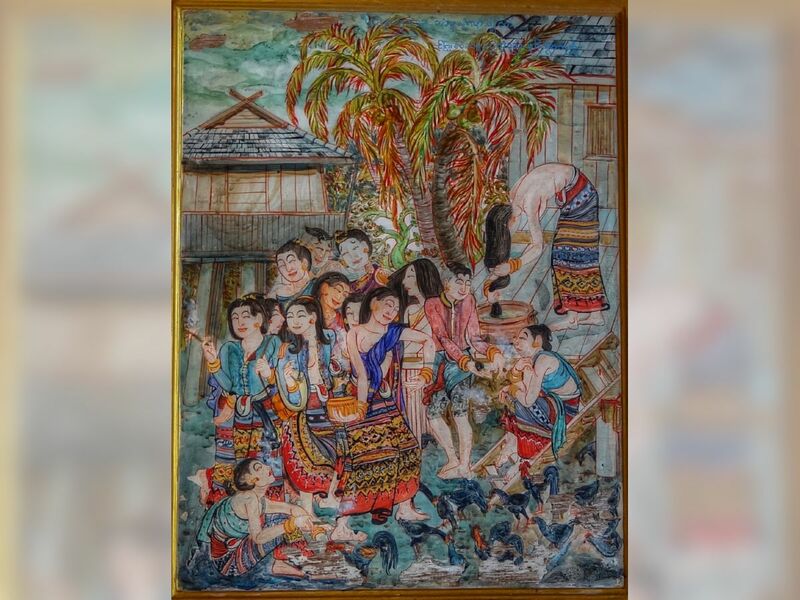 Regular flooding in the rainy season, however, forced him to move the capital to a new site which became known as Wiang Kum Kam. Wiang Kum Kam was founded in a shallow, fertile basin where the Ping River flowed. 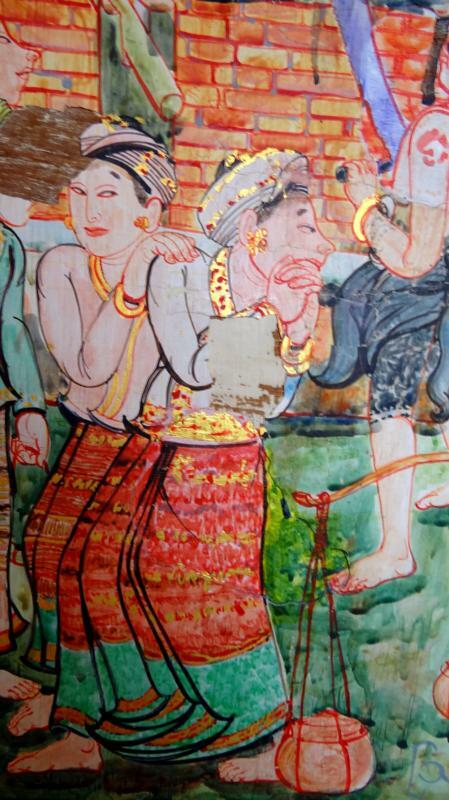 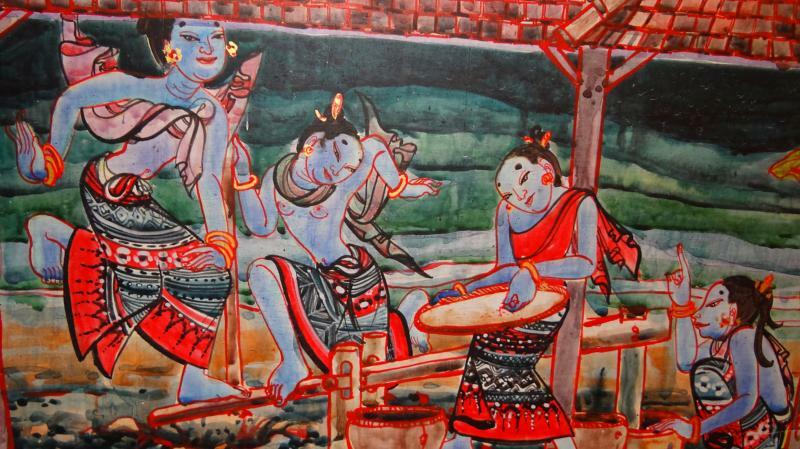 An old community already existed on the site when King Mangrai chose it for his capital. 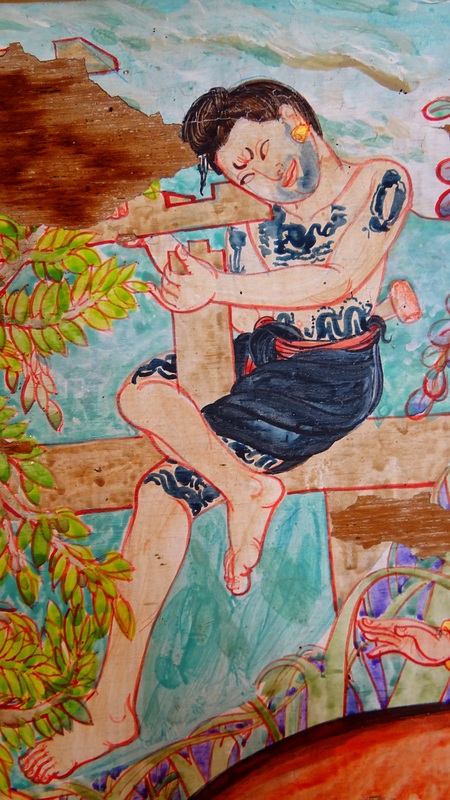 He ordered moats dug on all four sides and let the waters of the Raming, as the Ping was then known, flow in. 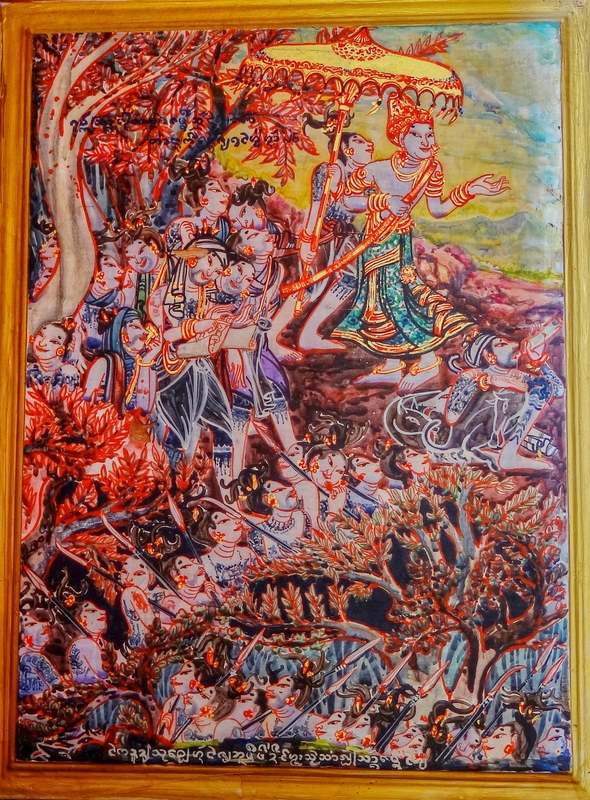 In choosing this location King Mangrai was influenced by the location of Haripunchai, which was sited next to a river for convenience of transportation and trade. 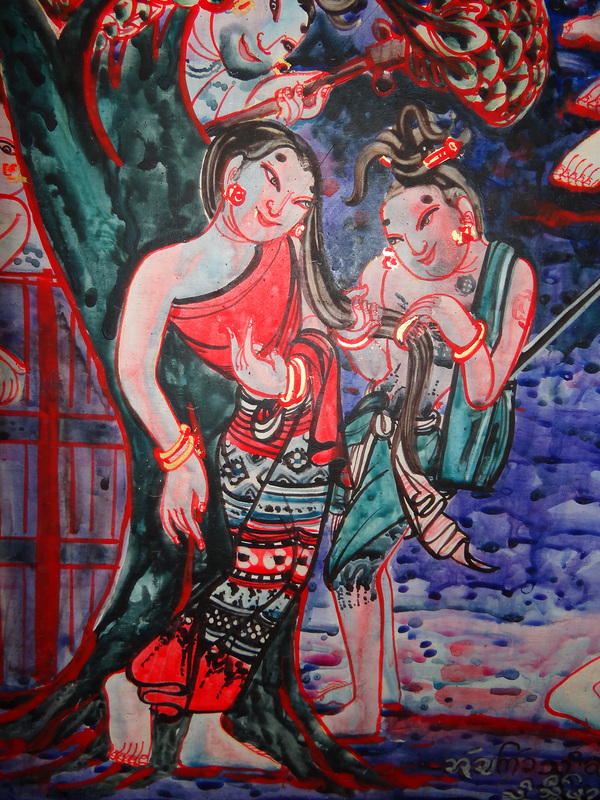 Traditionally, the Lao Dynasty preferred to establish their cities in the low foothills at the base of mountains. 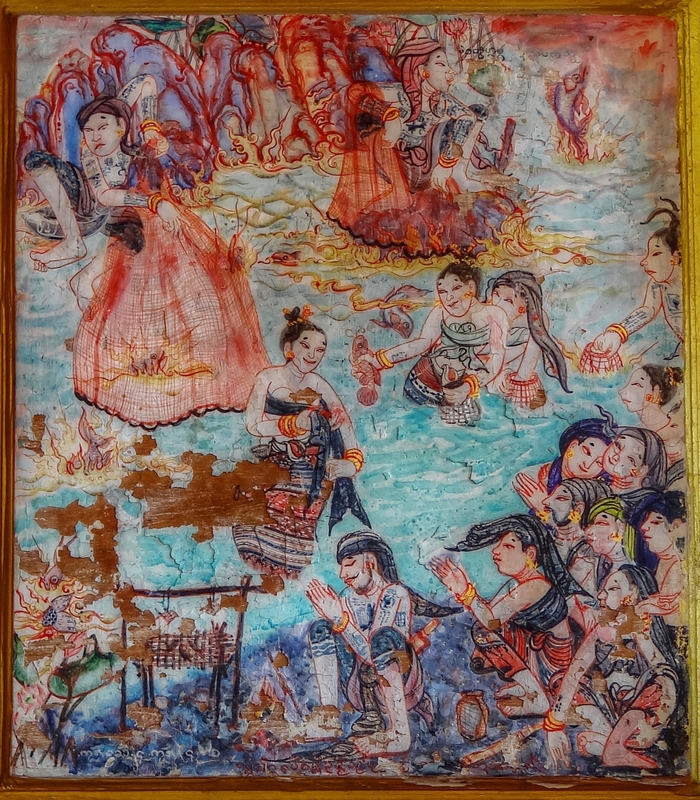 The culture of Haripunchai influenced not just the choice of sites for the capital but many other aspects of the Kingdom of Lanna. 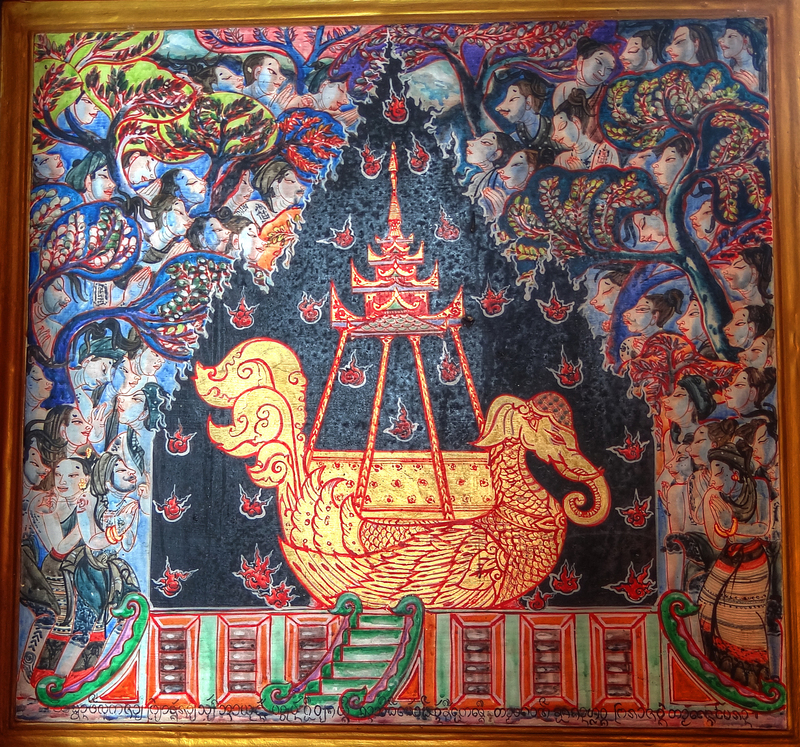 For example, the Lanna religious script known colloquially as tua muang, was adapted from the Mon Haripunchai script. 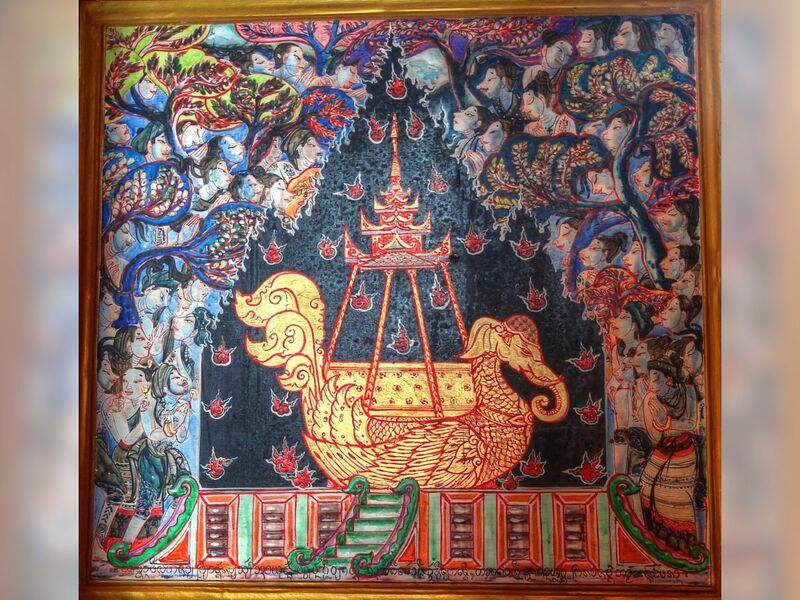 The religious architecture was also copied in the construction of Wat Ku Kham (Wat Chedi Liam), which was based on the style of Wat Ku Kut in Haripunchai. 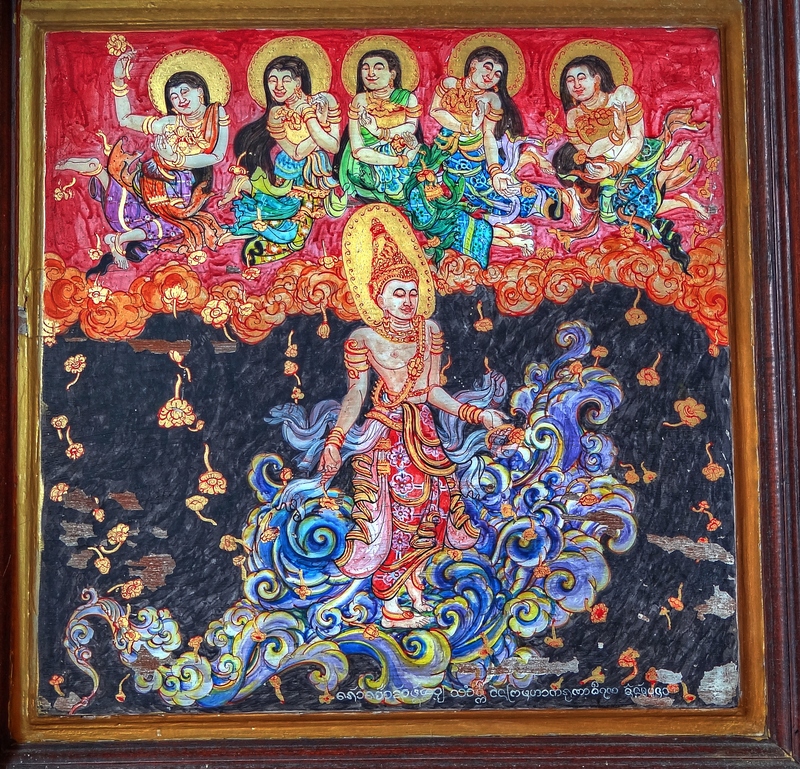 Wat Ku Kham was equal in importance to Wat Kan Thom (named after Nai Kan Thom, the craftsman who built the temple) in the city of Wiang Kum Kam. 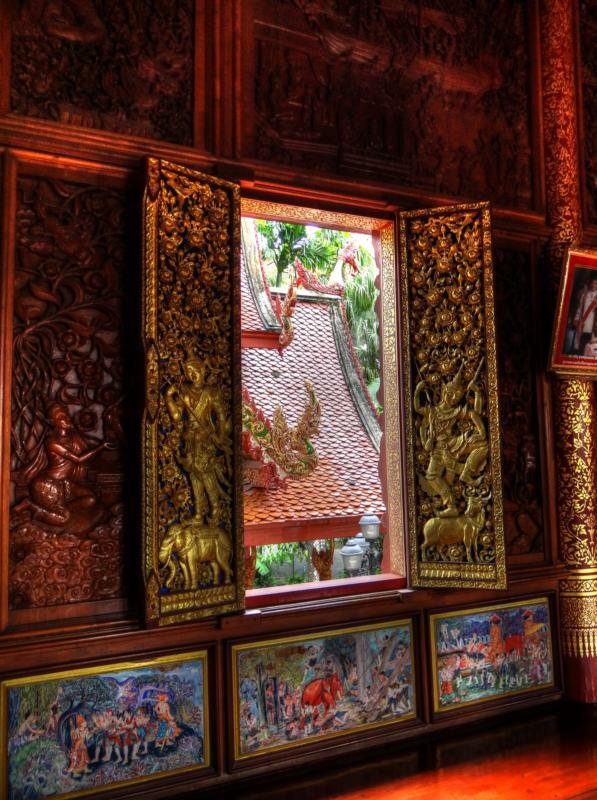 The chedi of Wat Lan Thom, however, was not built in the style of Haripunchai and reflects the beginnings of a blending of cultures between the different peoples under King Mangrai. 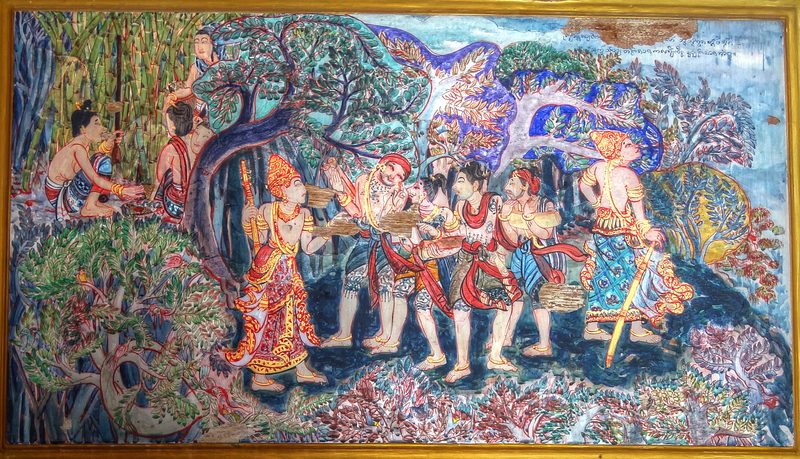 The local ethnic Mon Haripunchai and the Tai Lawa were joined by the Mon Hongsawadi (Pegu) who had come with Nang Usapaikho, the wife of King Mangrai. 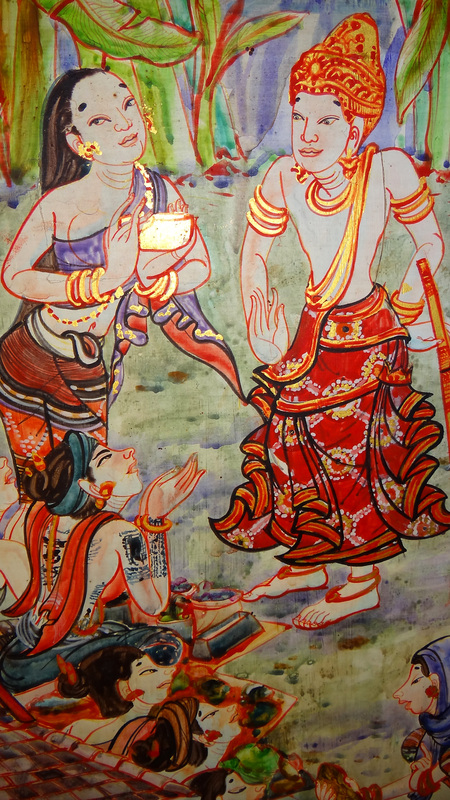 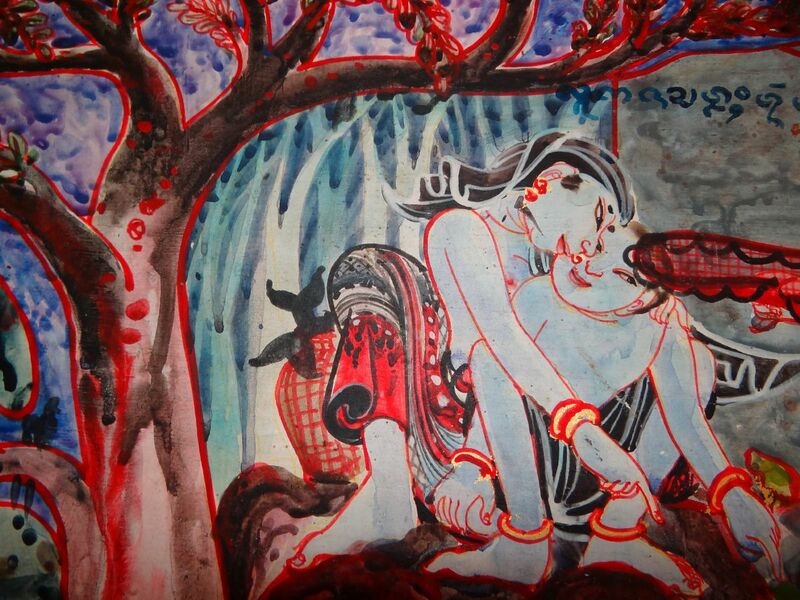 These Mon had followed her when her father gave her to the King, seeking friendship with King Mangrai. 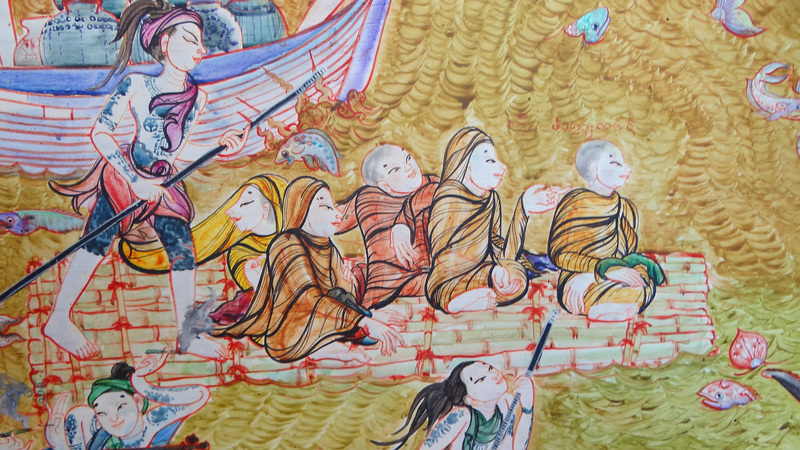 In addition, there were also the Tai Yai of Muang Angwa (Ava), who were goldsmiths and metal workers. 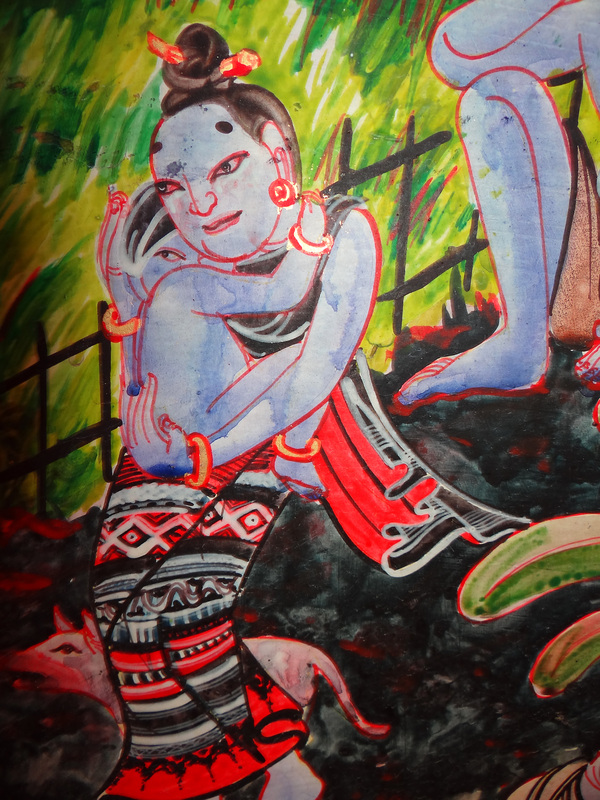 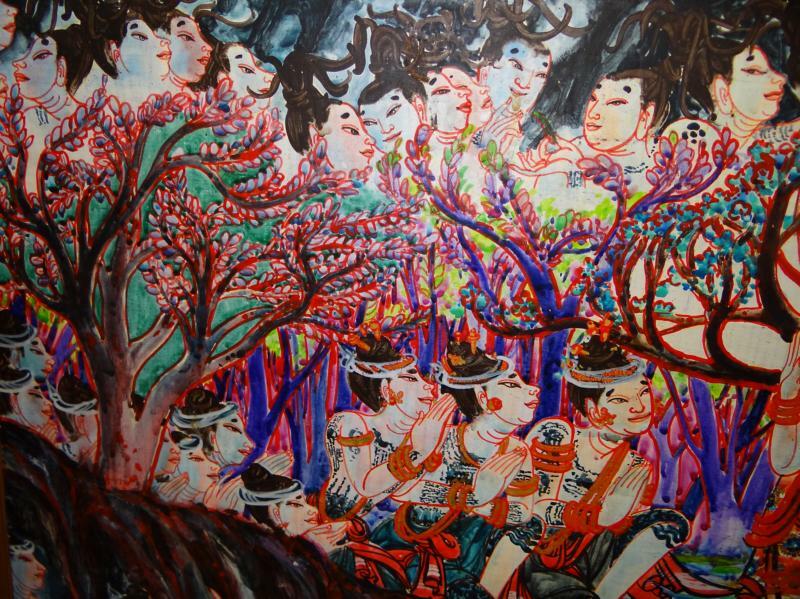 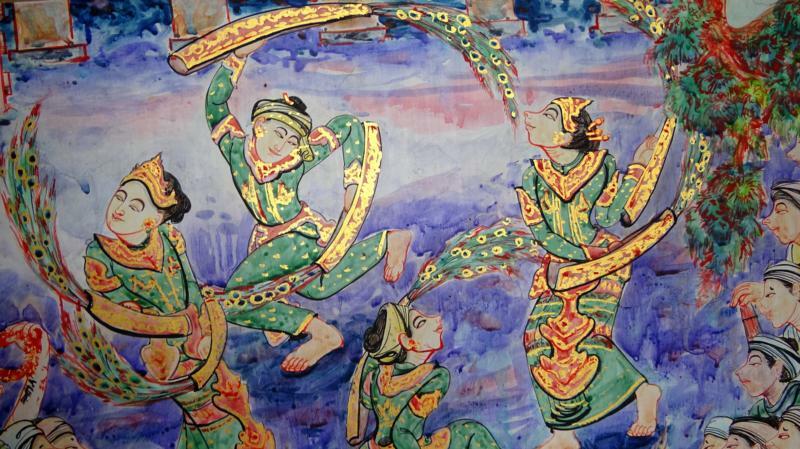 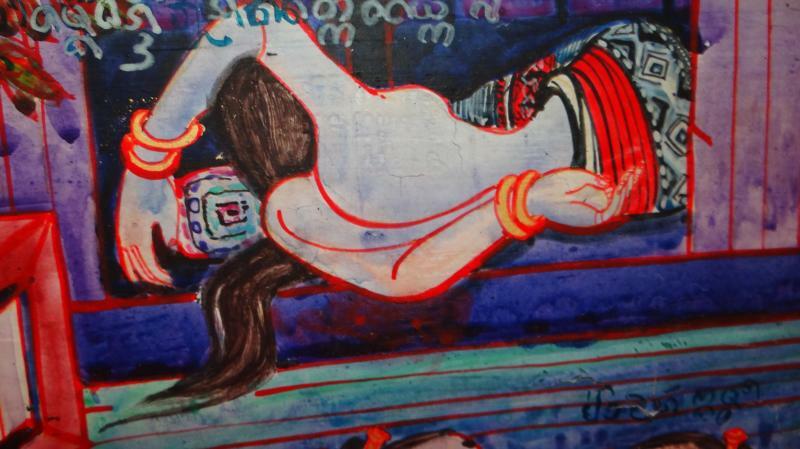 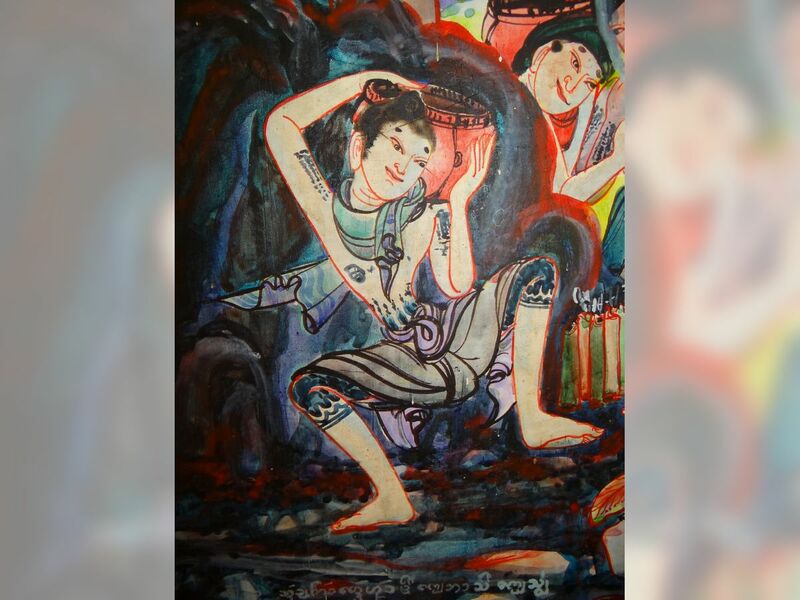 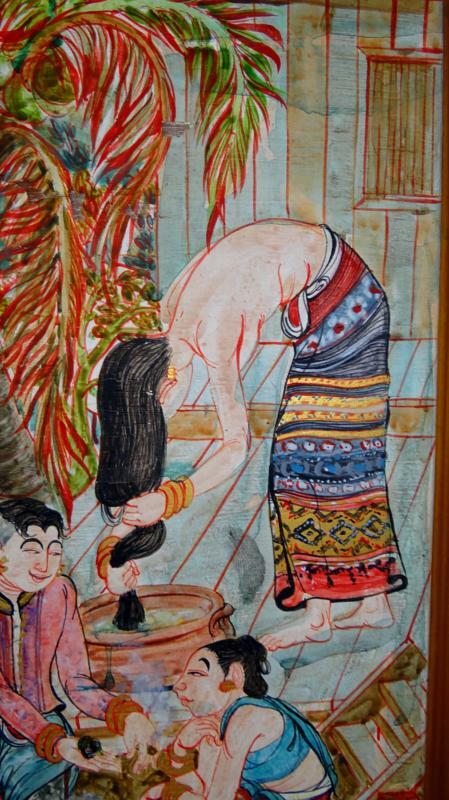 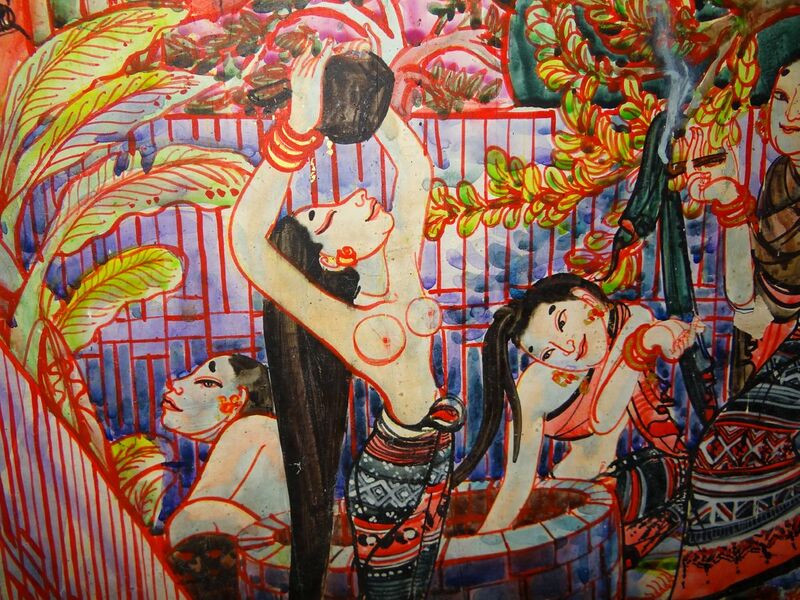 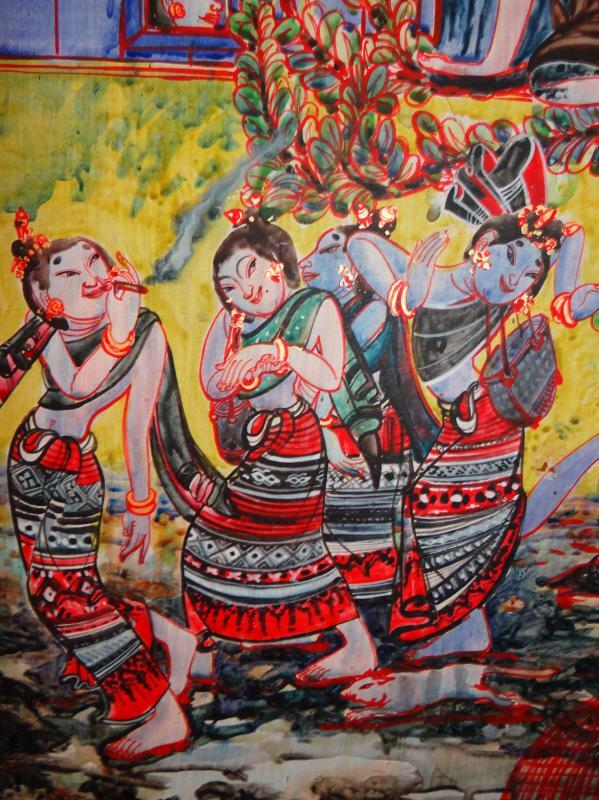 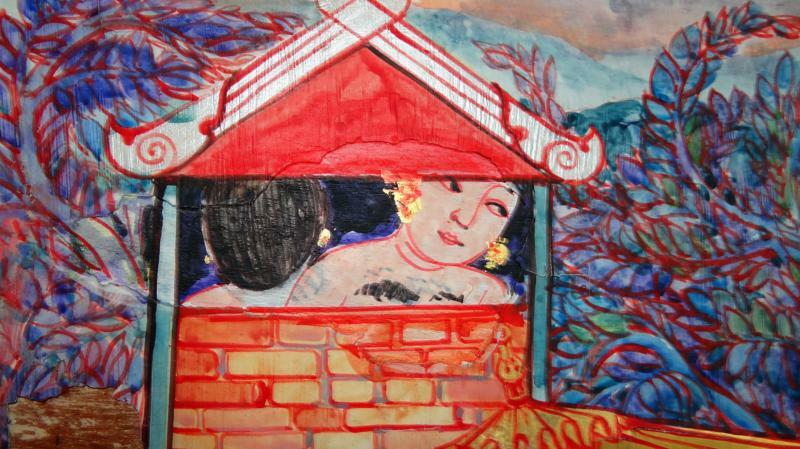 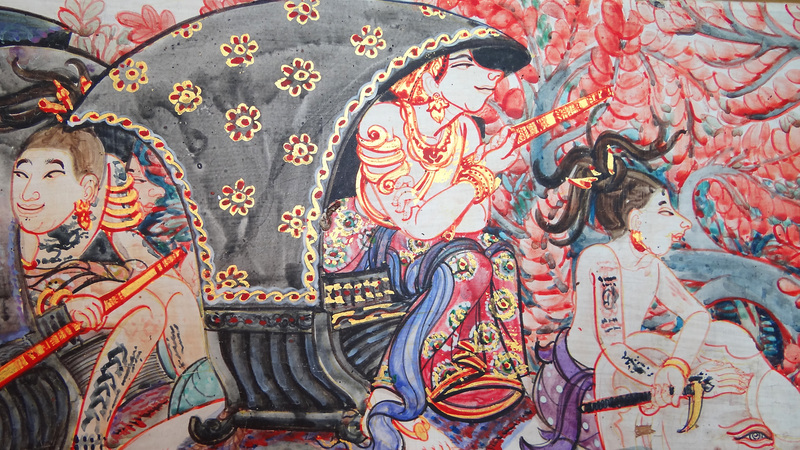 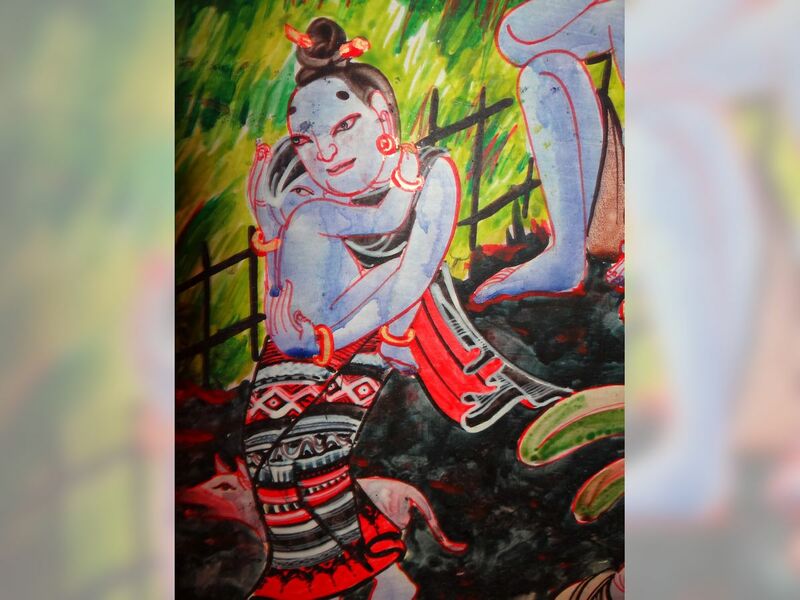 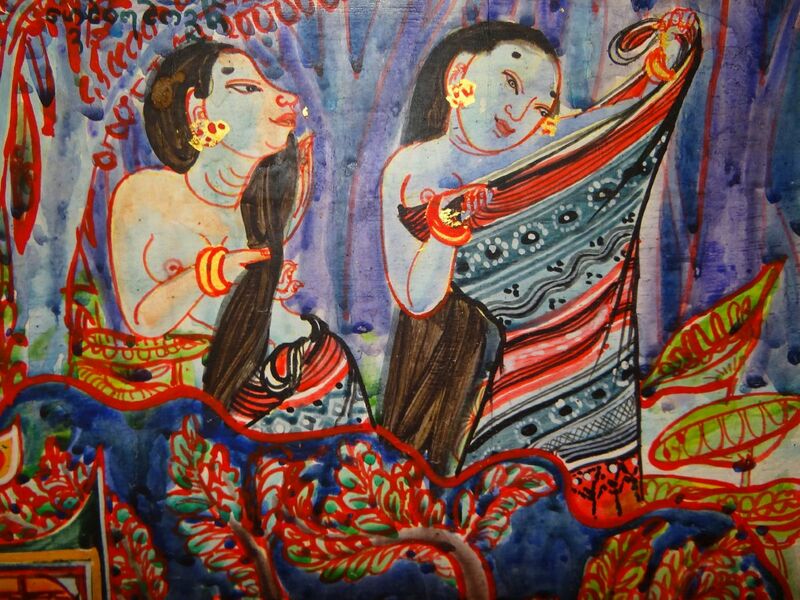 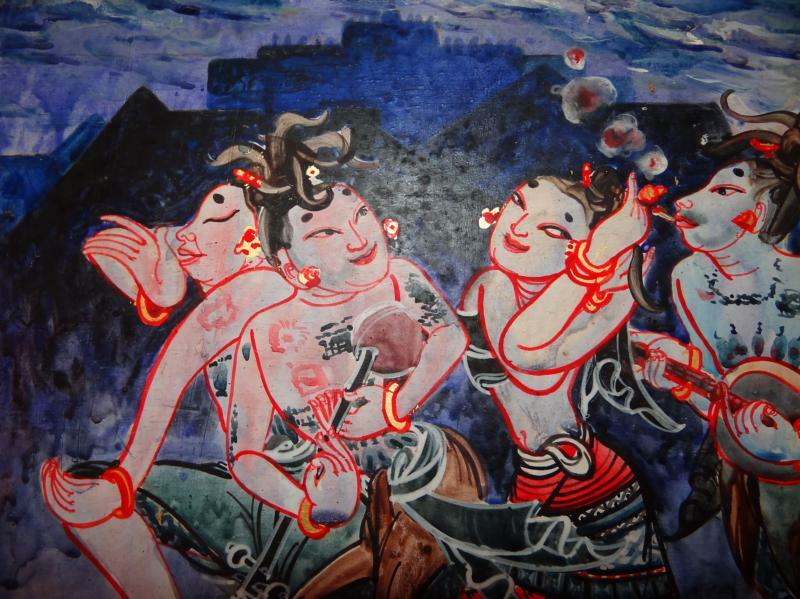 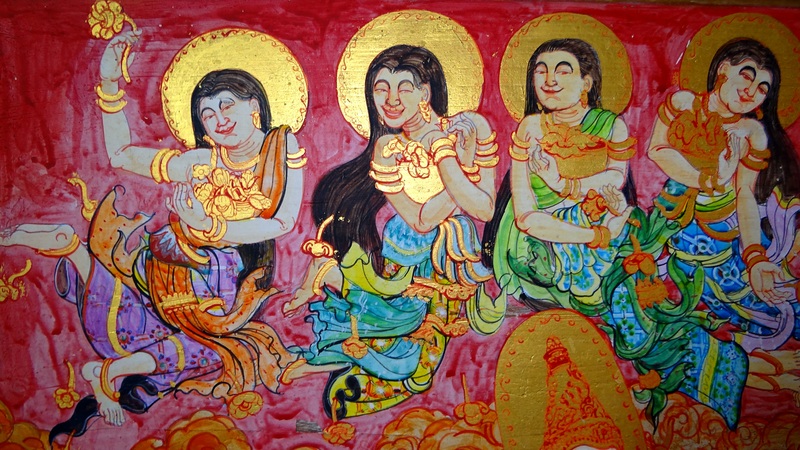 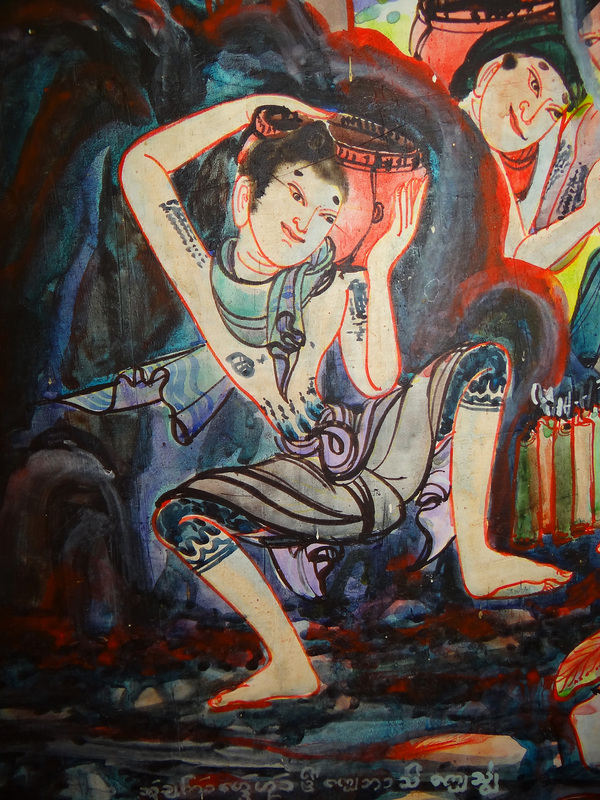 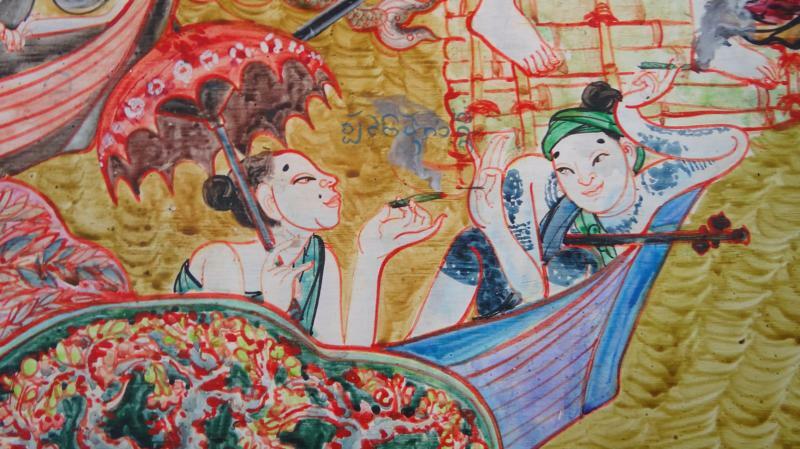 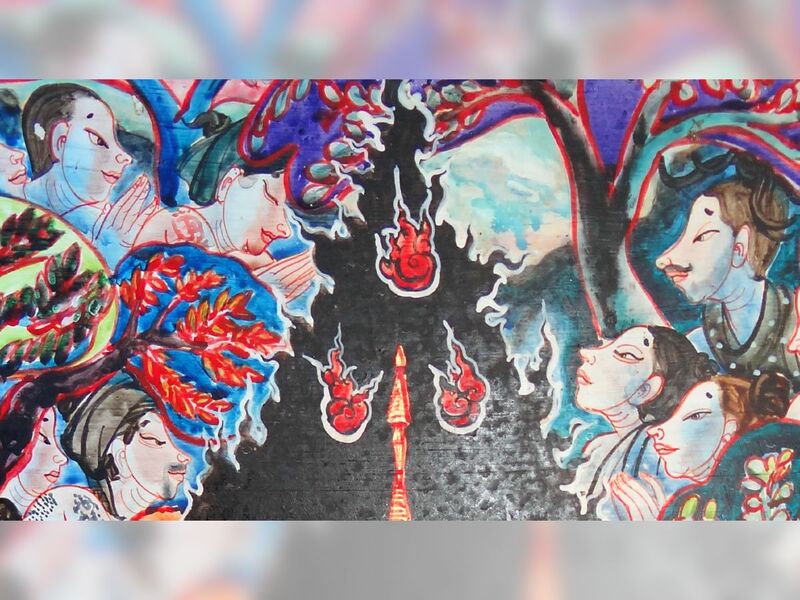 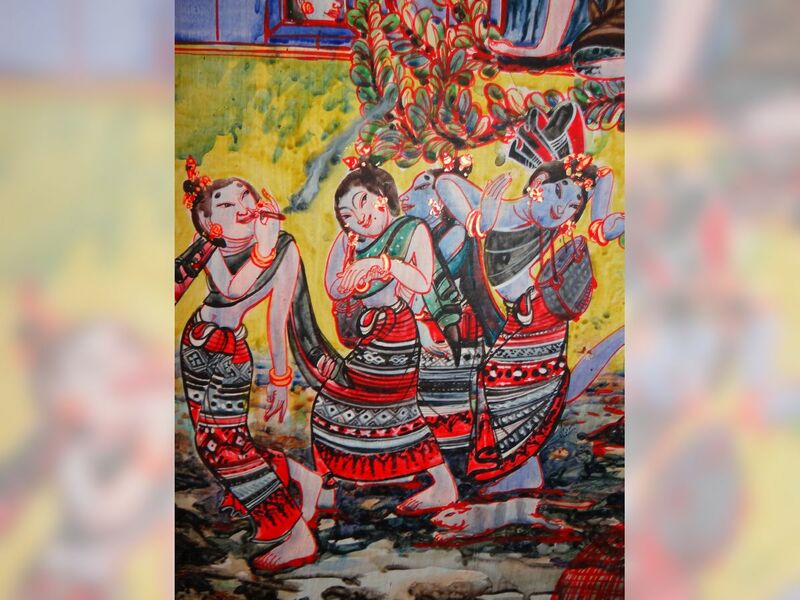 From the mixing of these different cultural origins, the artistic culture of Lanna first began to find its own identity. 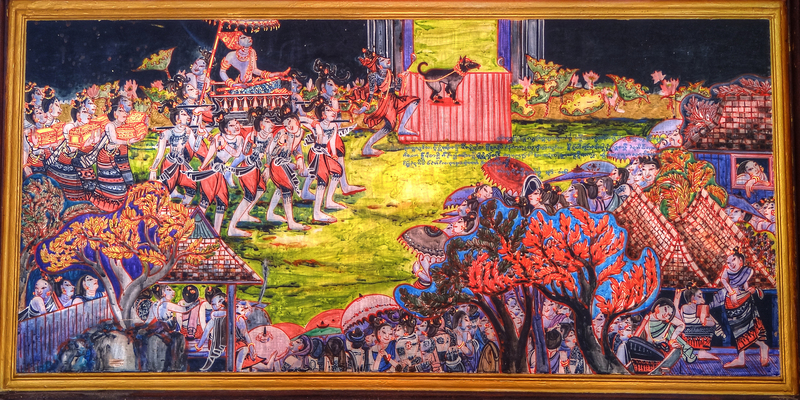 King Mangrai resided at Wiang Kum Kam for five years. 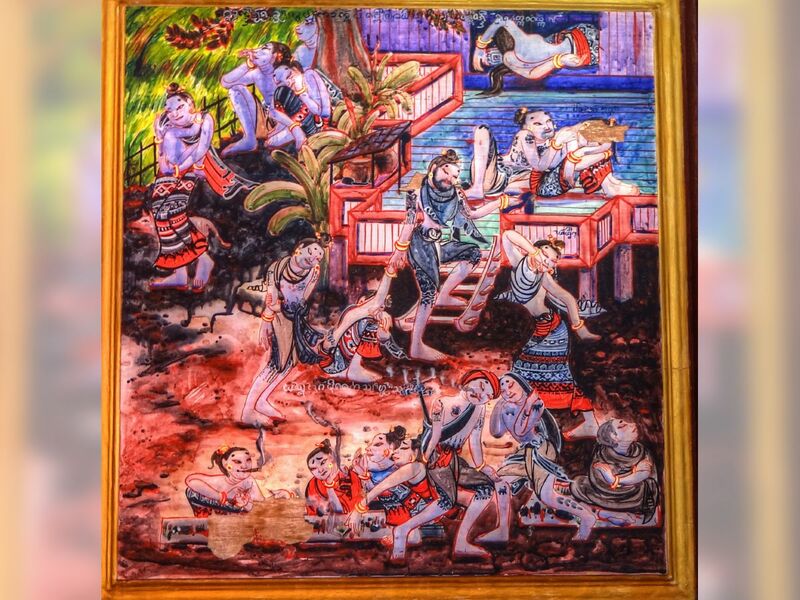 But this site was also subject to flooding during the rainy season, causing hardship and difficulty. Thus a search began for a better location, one that would serve as the permanent capital of the Lanna Kingdom. 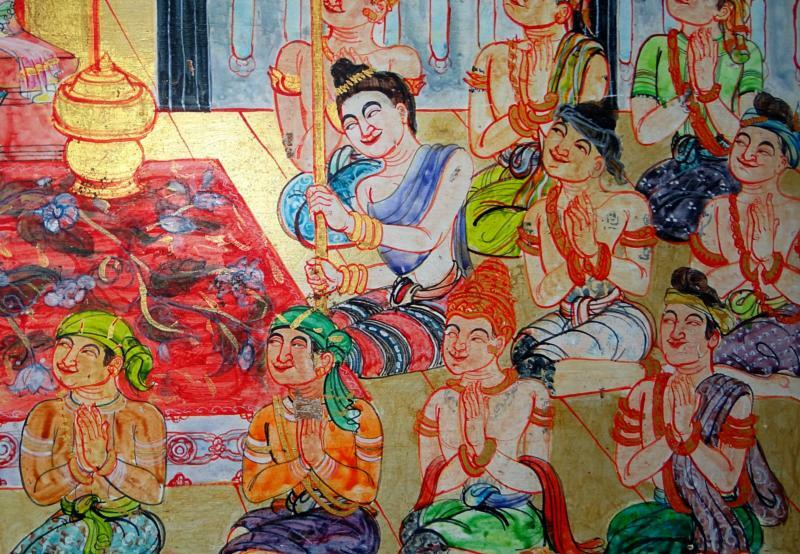 In 1296, King Mangrai discovered an area where the lie of the land most suited the founding of a new city. 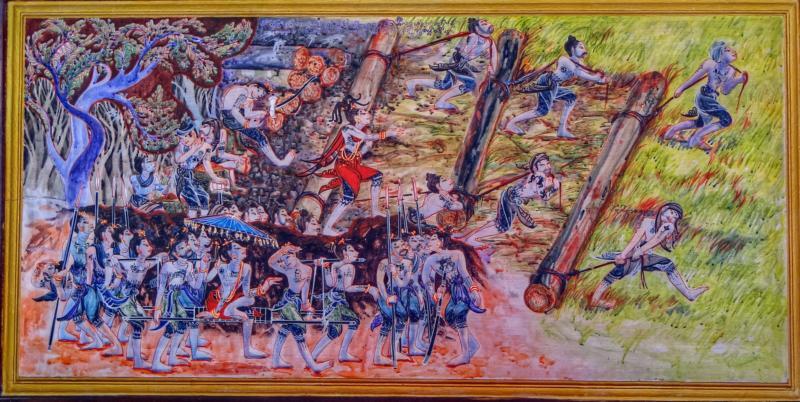 The area that pleased King Mangrai had formerly been the site of other communities - Wiang Chet Rin, or Chesathaburi at the base of Doi Suthep, Wiang Nophaburi on the actual site of the new city and Wiang Suan Dok. 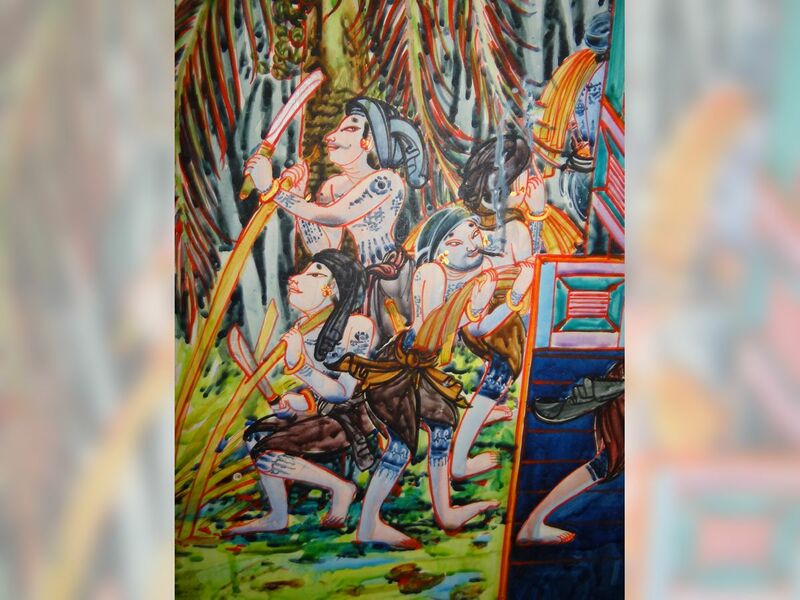 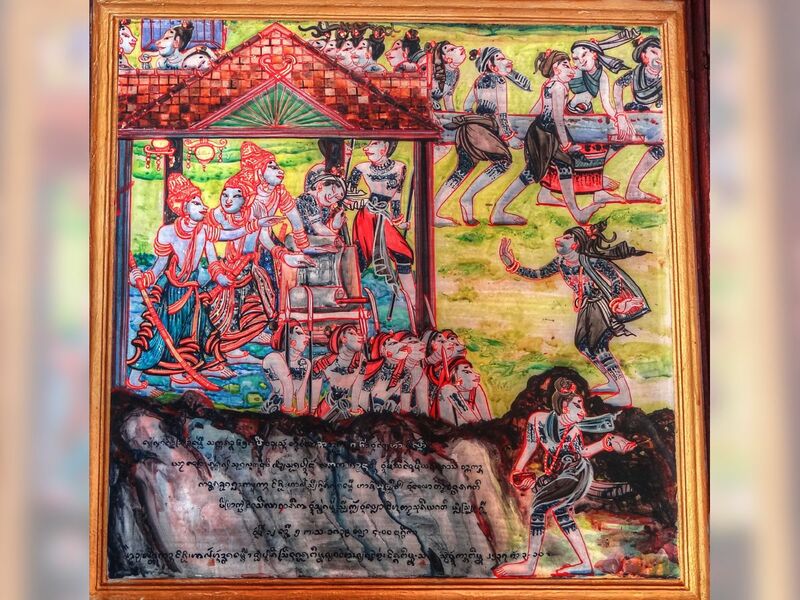 “ The Lord Indra said to the demon, Dig up the sacred pillar and take it to Wiang Nophaburi. No enemy shall breach the city gates while the people honour it with flowers and rice. 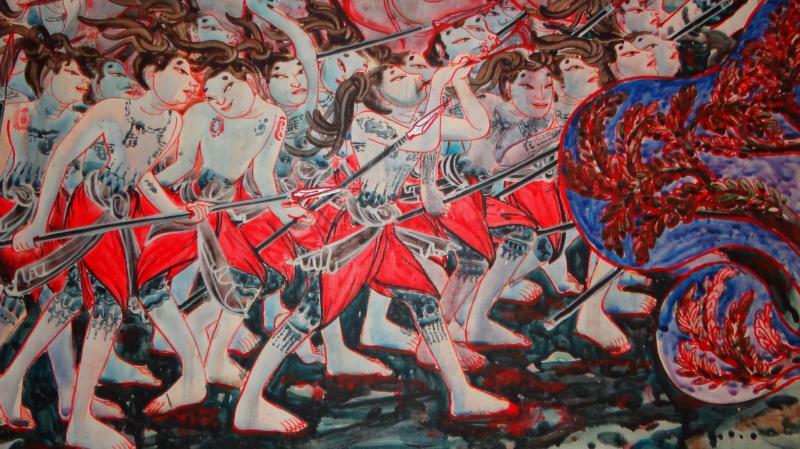 The people shall also pay respect to the two guardian demons. But time passed and the people became negligent in duty and made the area unclean. 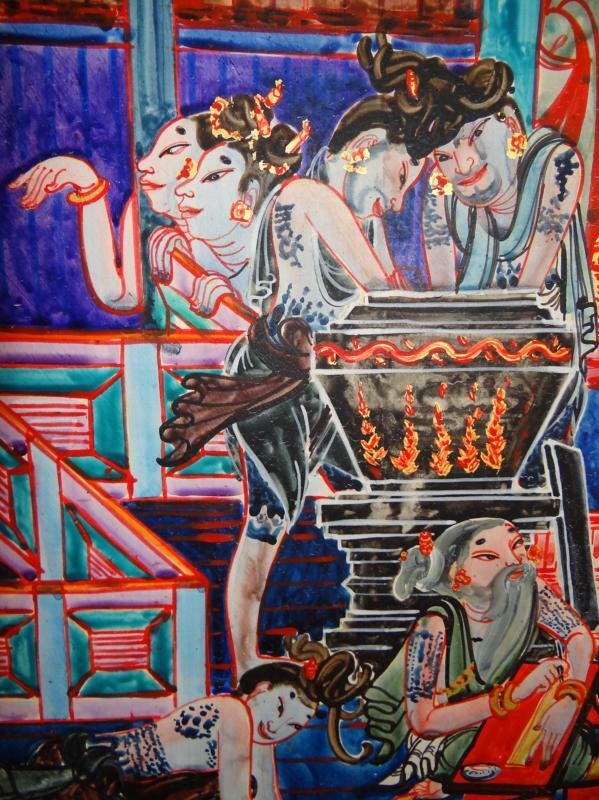 The two demons returned the pillar whence it came. 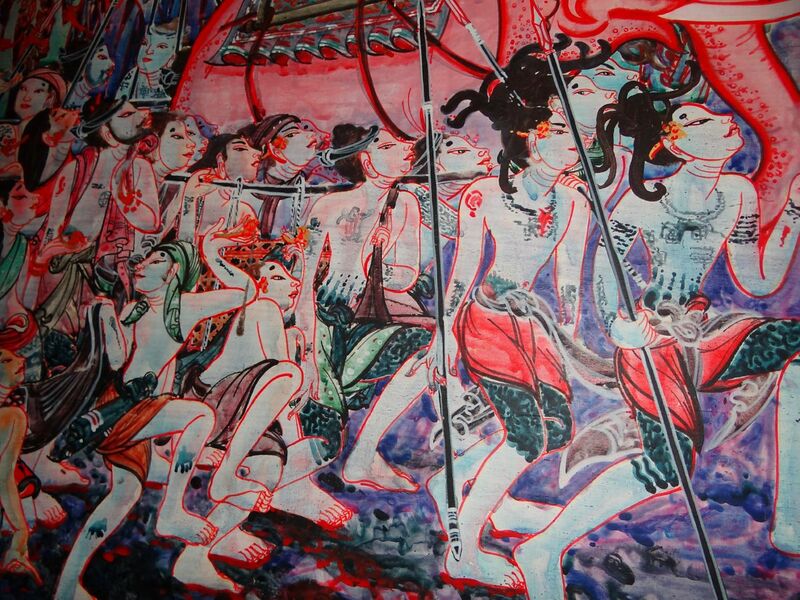 Whereupon the city fell into decay and was oppressed by the enemy and the people suffered much. 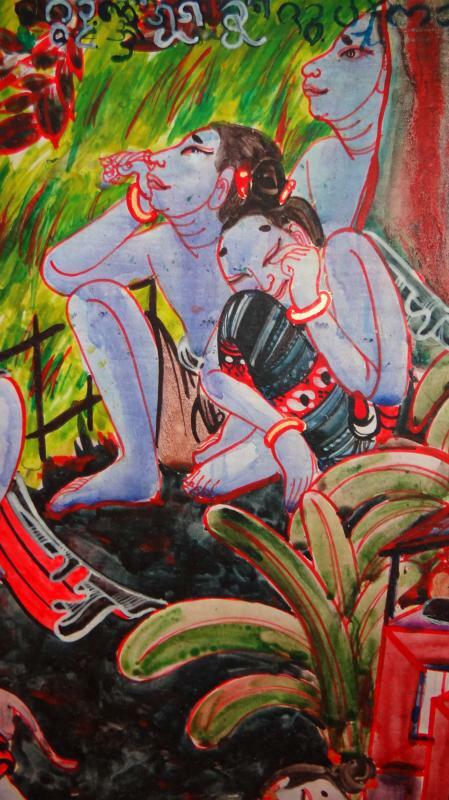 And such it was till one mendicant went in search of help from the Lord Indra. 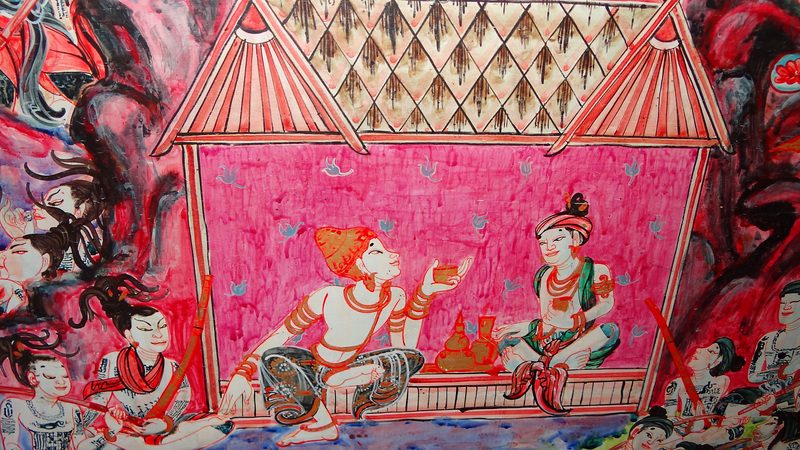 The Lord Indra commanded him, Cast a large pot. 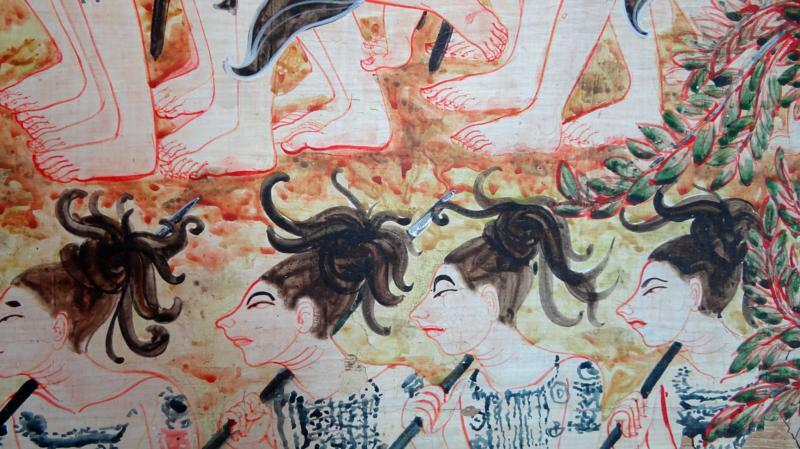 Mold a male and female animal of every kind and place one pair of each type in the pot. Place images of the people of the hundred and seven languages in the pot and bury it beneath the earth. 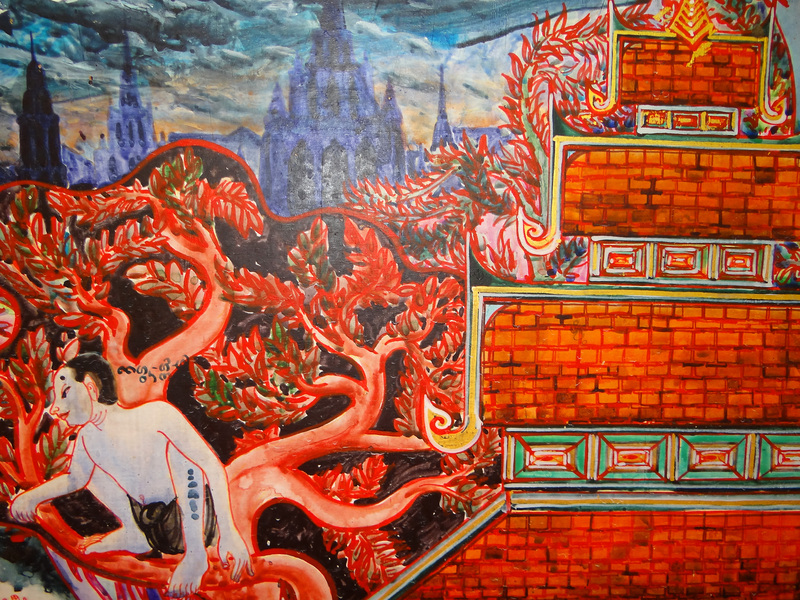 Above this spot ye shall construct a tutelary pillar and honour it as the real Inthakhin Pillar. 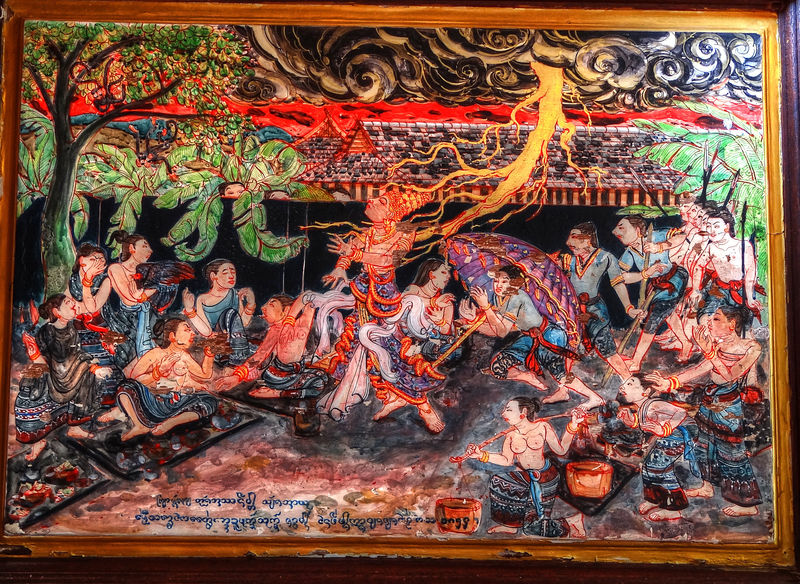 In this way the city shall be free from threat and misfortune ” The legend of the Inthakhin Pillar plays an important role in proving the founding of the city of Chiang Mai and is the origin of the annual tradition held to pay respect to the city pillar. Having founded the new city, King Mangrai gave it the name Nophaburi Sri Nakhon Ping Chiang Mai. 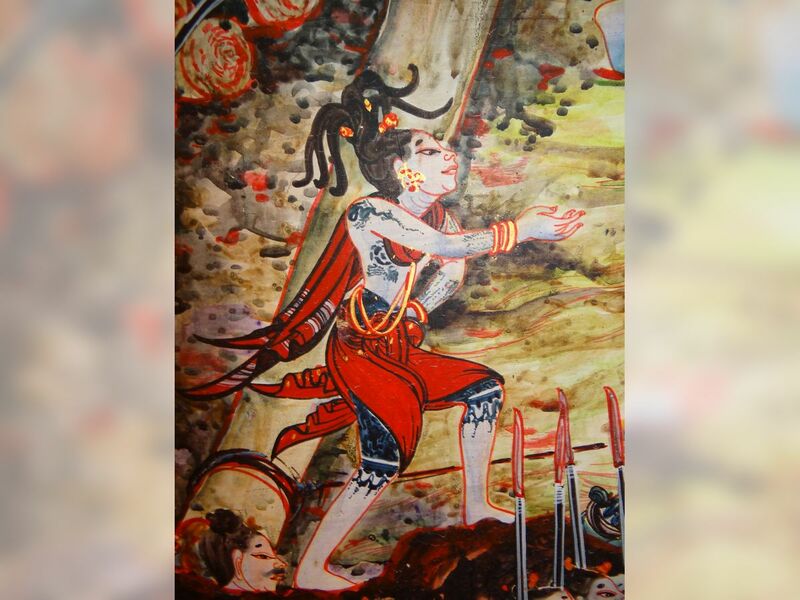 He asked the Lawa of the history of the Ping area and was advised to pay obeisance to the Inthakin Pillar and to enter the city from the north. 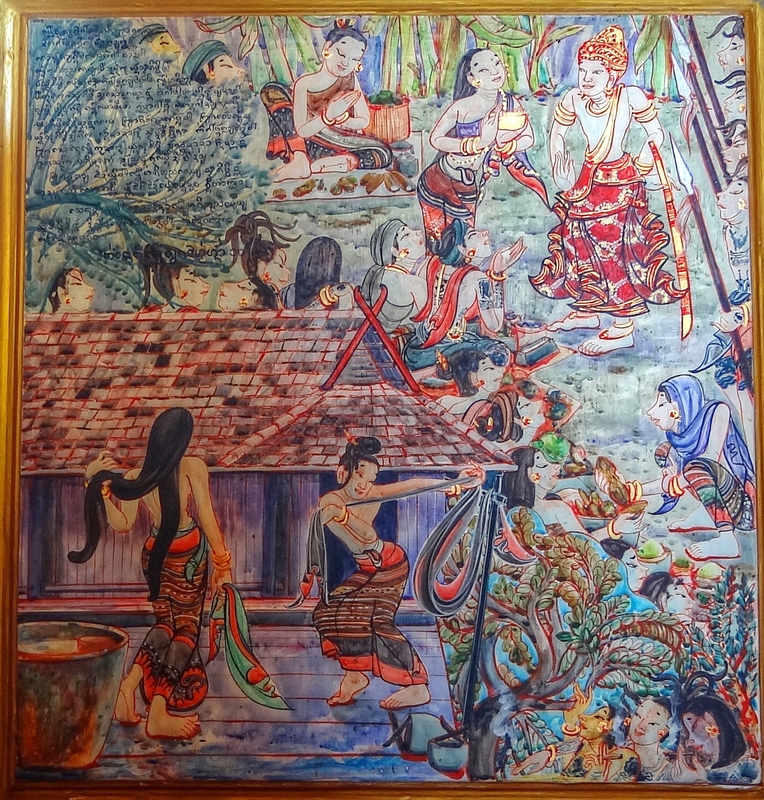 His acceptance of the traditions of the original inhabitants of the area may have influenced him in adding the name Nophaburi to the name Chiang Mai. 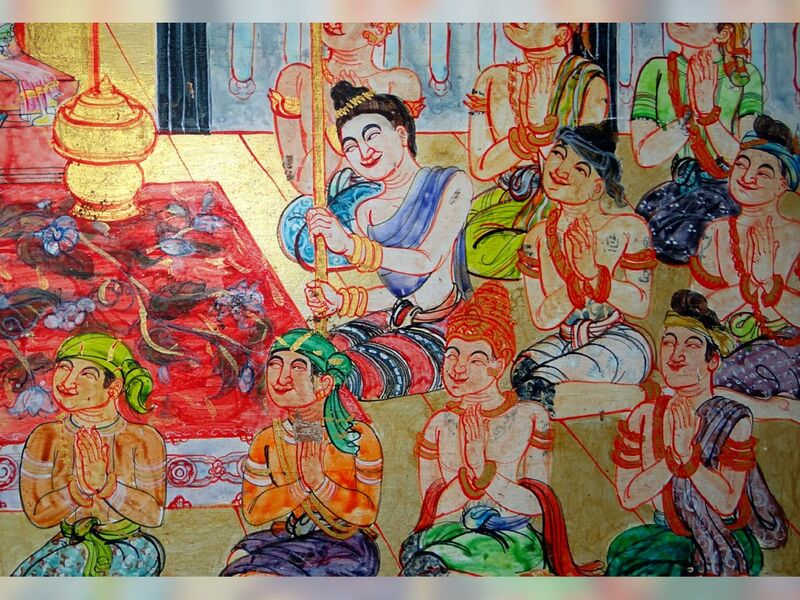 The people believe that the importance of the Inthakhin Pillar was shown more than two centuries later by the events that led to the loss of the city to the Burmese during the reign of Phra Mekuthi. 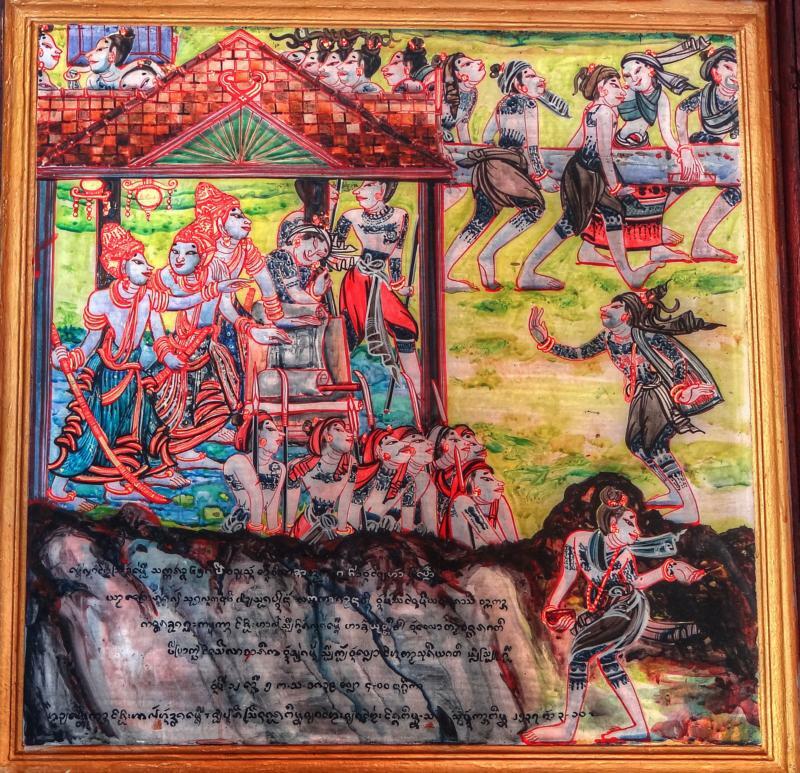 According to these beliefs the Burmese were able to conquer the city because Phra Mekuthi forbade his people to pay respect to the Inthakhin Pillar during his reign. 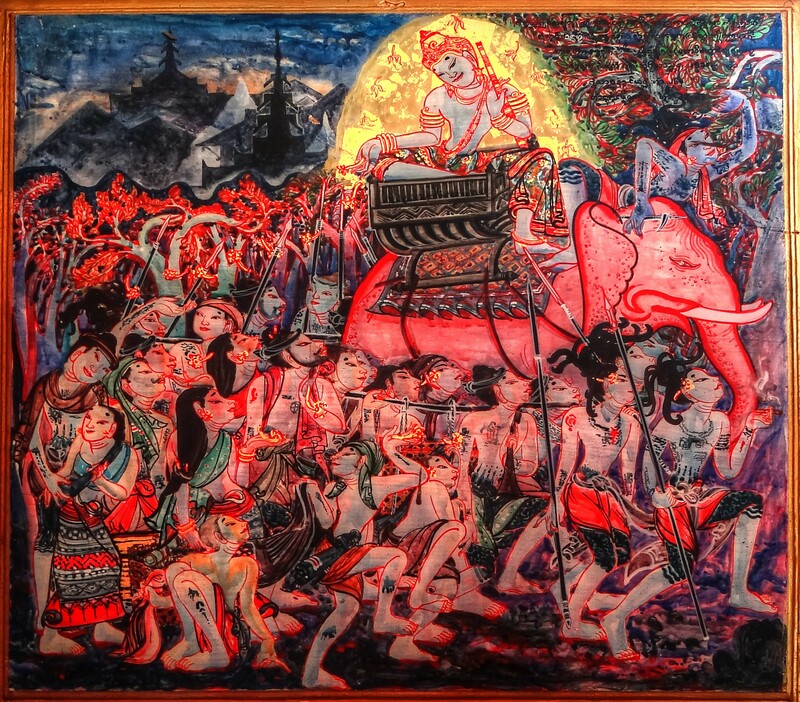 After establishing the city of Chiang Mai, King Mangrai ruled over the new capital until he reached the age of eighty. 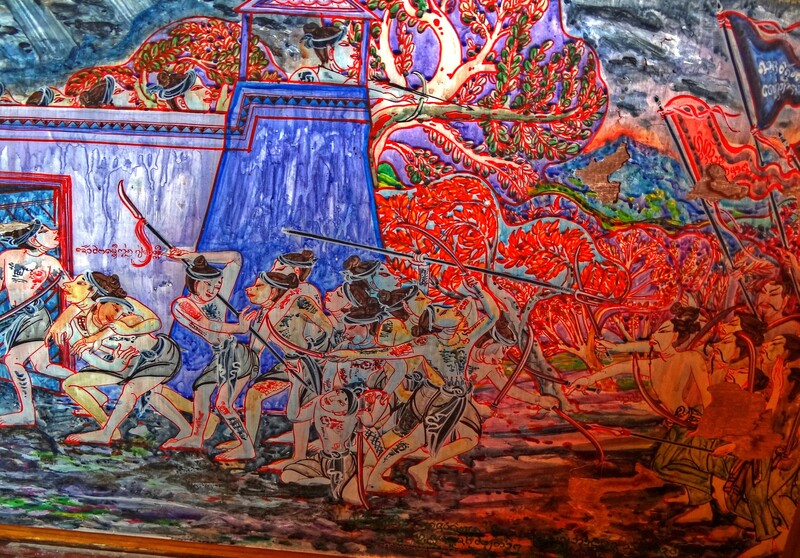 One day while he was touring the marker place he was struck by a bolt of lightning. 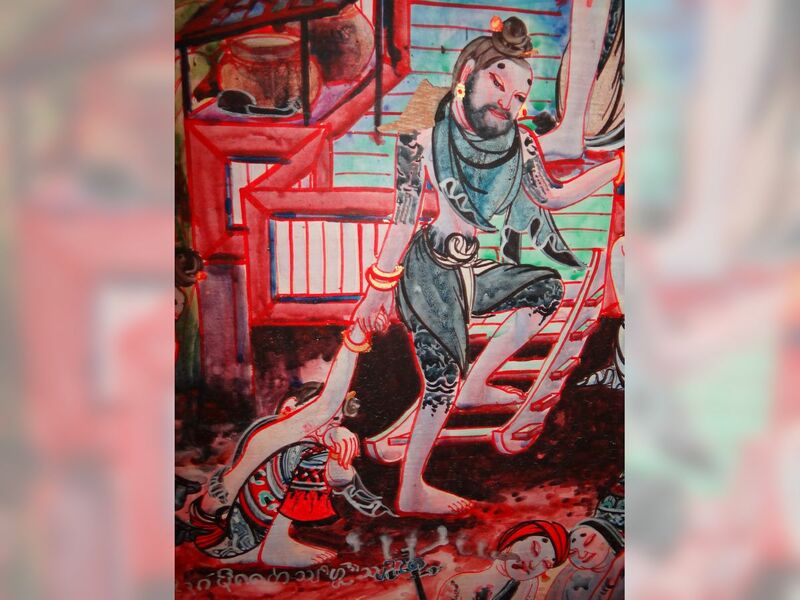 His son, King Chai Songkhram erected a chedi on the spot where his father was killed. 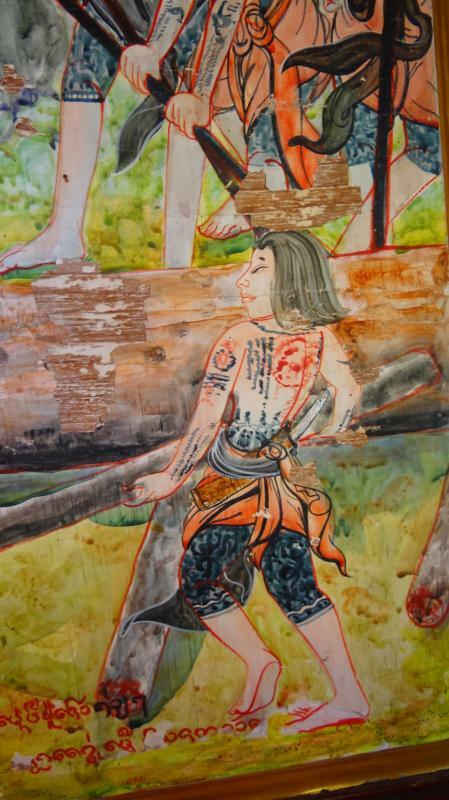 Some people believe that the ruins of Wat Sadeu Muang in the vicinity of the Tilokarat Convention Hall marks that site. 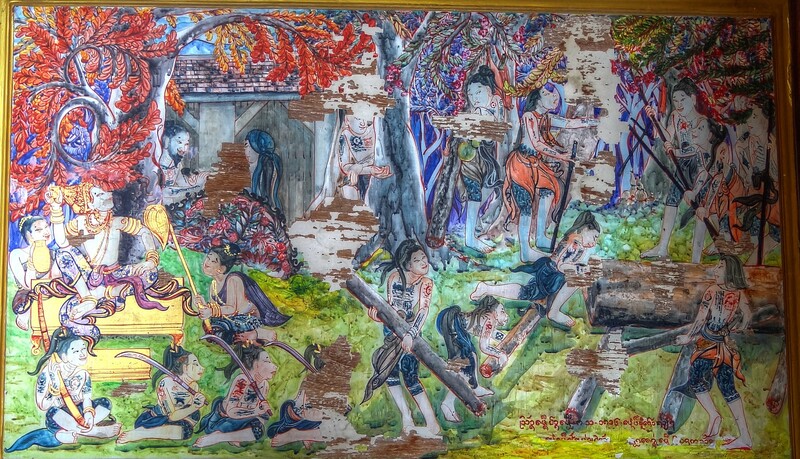 Others say that it is marked by the collapsed Chedi which is situated near a Bodhi Tree behind the royal residence of Chao Mae Tiphawan Na Chiang Mai. 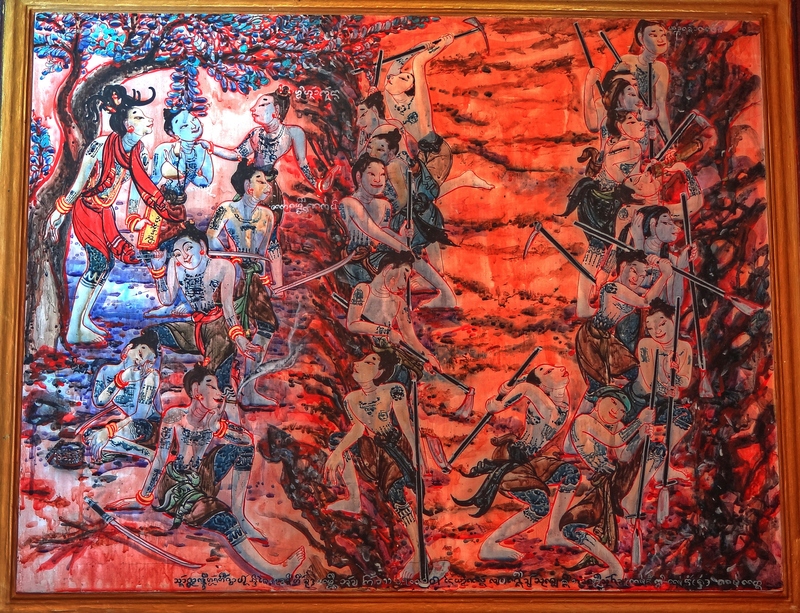 A monument was later built at the Klang Wiang Intersection as a memorial. 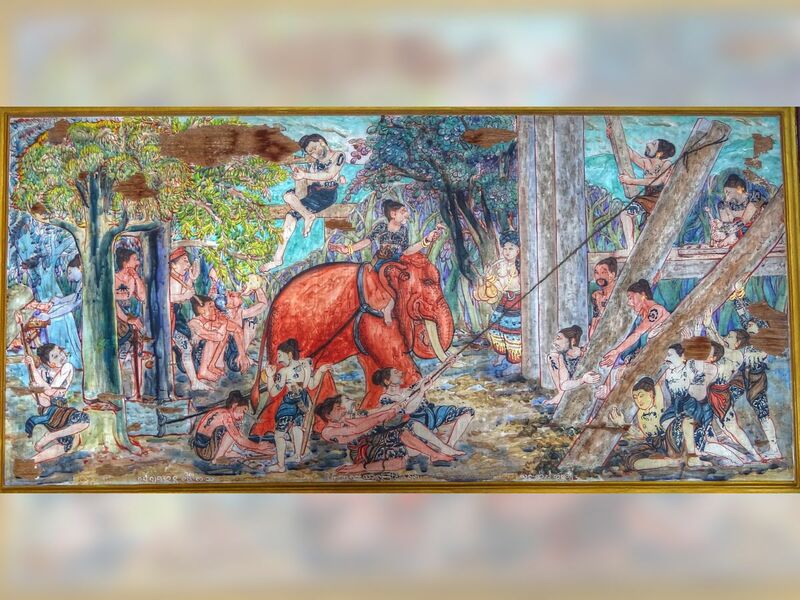 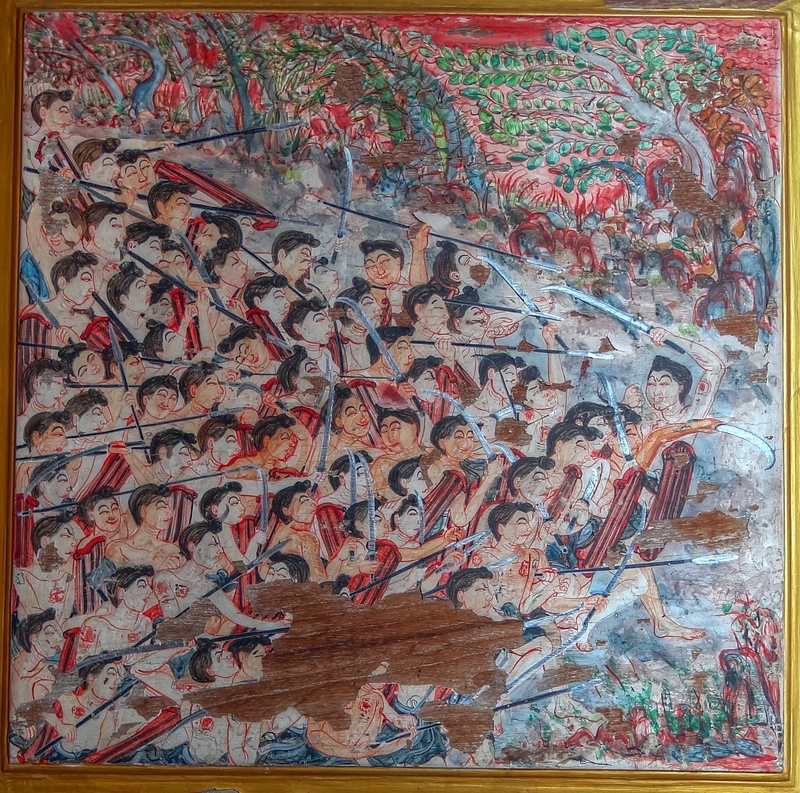 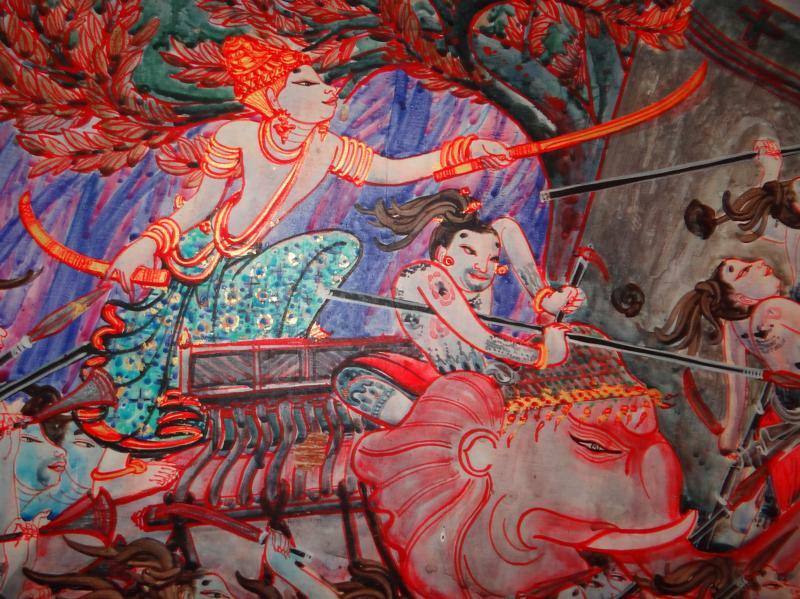 In founding the city of Chiang Mai, King Mangrai had not just shown himself to be a great ruler and warrior. 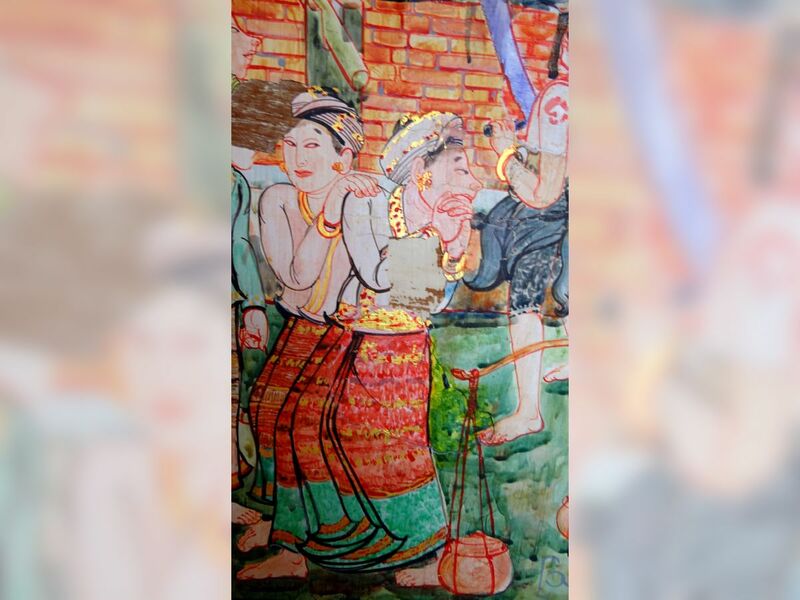 He had also proved he was adept at financial matters when he chose locations suitable for trading and established markets at both Wiang Kum Kam and Chiang Mai. 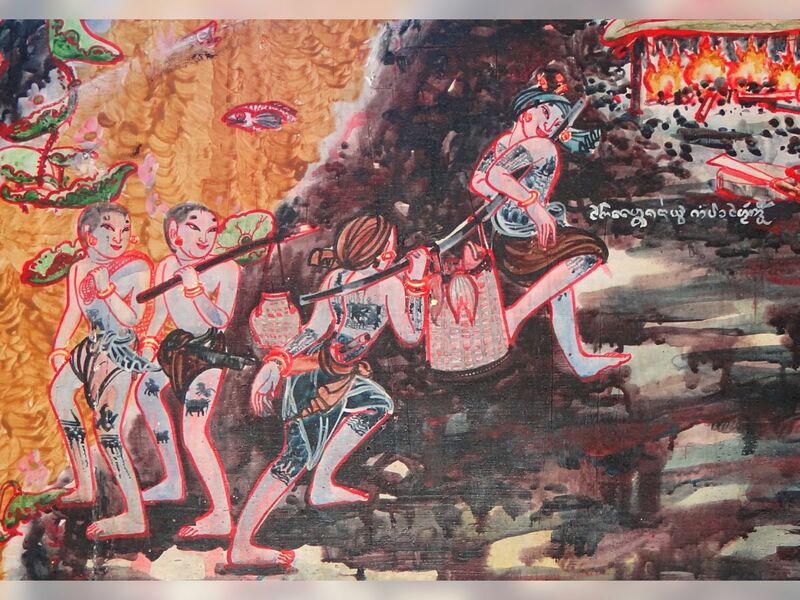 In matters of jurisdiction, he compiled a book of laws known as the Mangraisart which is believed to be based on the code of ethics of the Mon of Haripunchai. 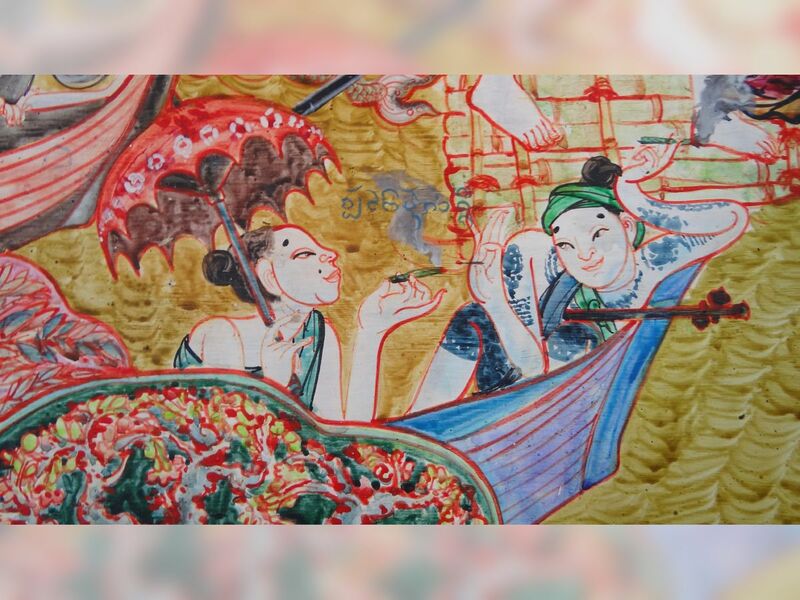 He also promoted craftsmanship among his subjects by bringing in accomplished artisans such as silversmiths goldsmiths, blacksmiths, and metal founders from Pagan. 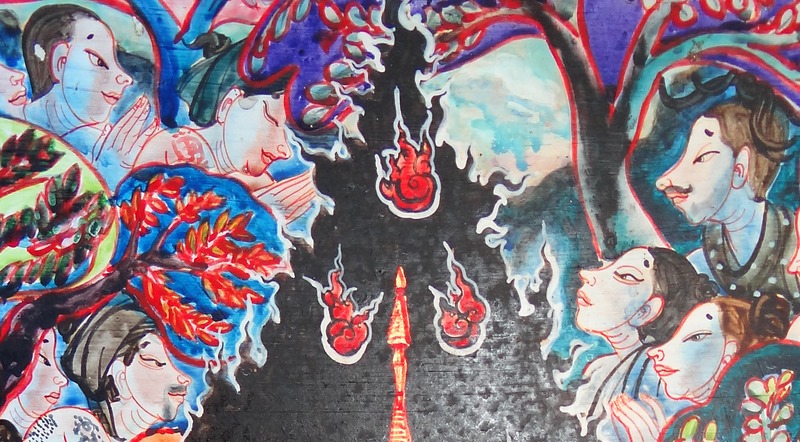 if anyone can help with either please contact me.